Historically speaking, car bomb usage has been reserved for use by terrorists in civilian areas. A nondescript civilian vehicle filled with explosives would detonate at a target, causing deaths and wreaking havoc. While that statement partly stands today, there’s one place where car bomb usage has adapted and changed. Anyone who’s familiarized themselves with the ongoing conflict in Syria and Iraq is bound to have seen an Islamic State suicide car bomb. Used on the frontlines of an active war, these rolling bombs are outfitted with improvised armor plating of varying degrees and design in true Mad Max fashion. Last year alone, Islamic State (hereafter IS) claimed 815 suicide car bombs, the most ever used in a single year by a group. In order to find out how car bomb usage has changed and adapted throughout the years, I will explore the history of car bomb usage by IS and its predecessors, from the inception of the Iraq war in 2003 to the present day. I will also examine contemporary car bomb usage by IS through analysis of 18 months worth of official IS video releases. Furthermore, I will take a look at the ongoing battle of Mosul and the devastating car bomb tactics used by IS there. 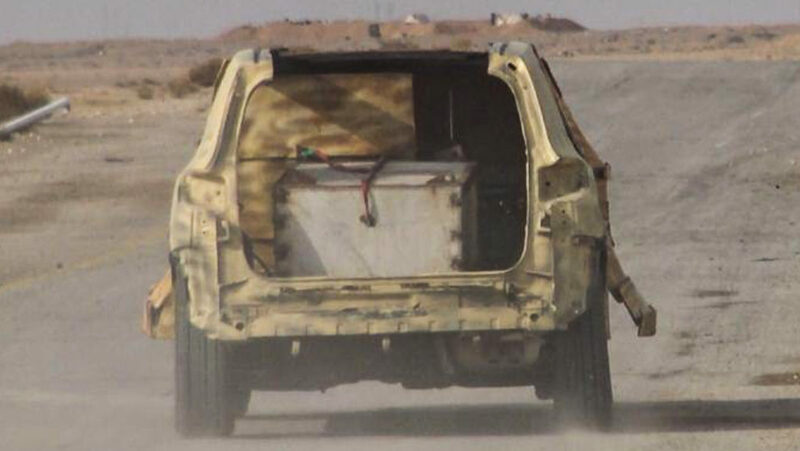 A car bomb, more accurately known as a VBIED (Vehicle-Borne Improvised Explosive Device) is basically any vehicle overhauled to function as a rolling IED, which is then driven to and detonated at a target. 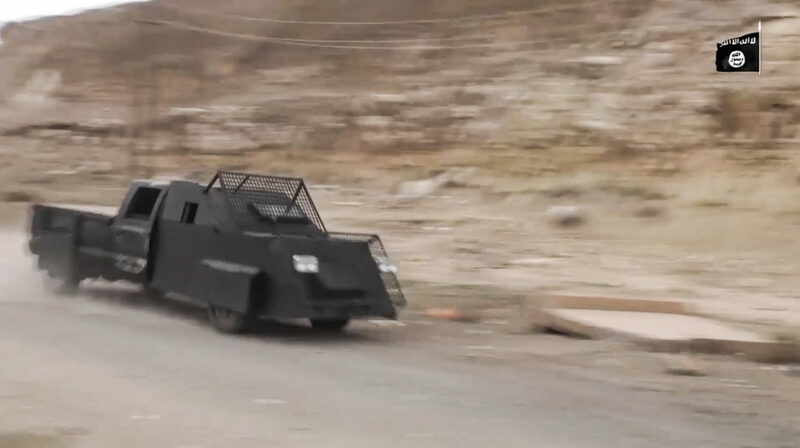 VBIEDs act as their own delivery mechanisms and can carry a relatively large amount of explosives, the only limiting factor being the size of the vehicle. 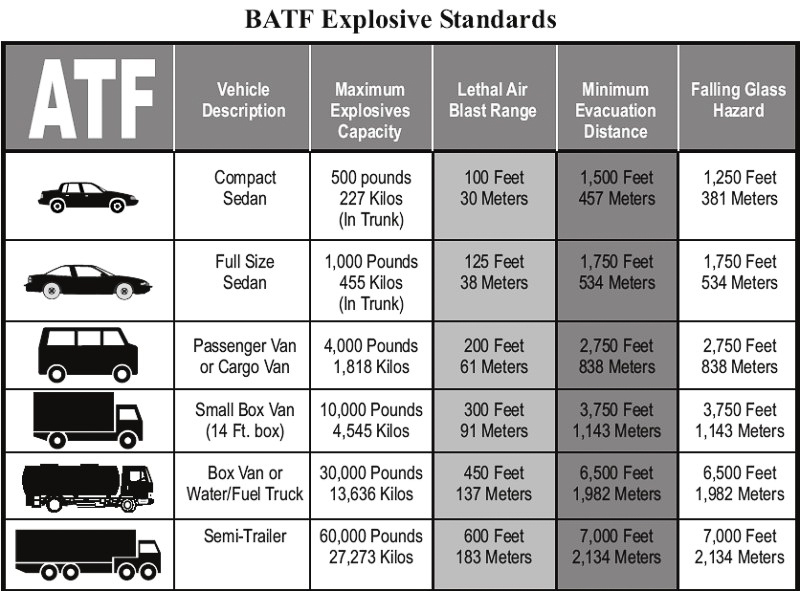 Figure 1: ATF table showing the explosives carrying capacity & lethal blast range for a variety of civilian vehicles if turned into VBIEDs. The parked VBIED typically functions as a larger type of static IED and can be brutally devastating, but this tactic often relies heavily on the enemy coming close to the VBIED instead of the other way around. 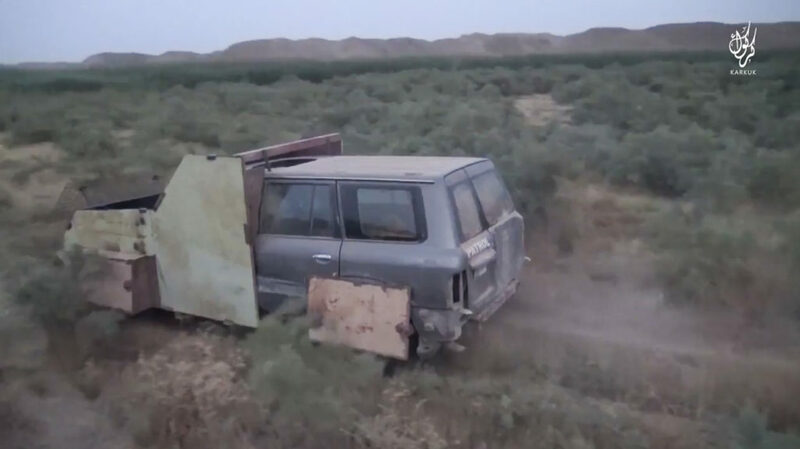 It’s very common to park the VBIED at the target and slip away, but the addition of a suicide driver (SVBIED) allows the bomber to maximize the potential number of casualties by carefully choosing the optimal point of detonation without needing an escape route. 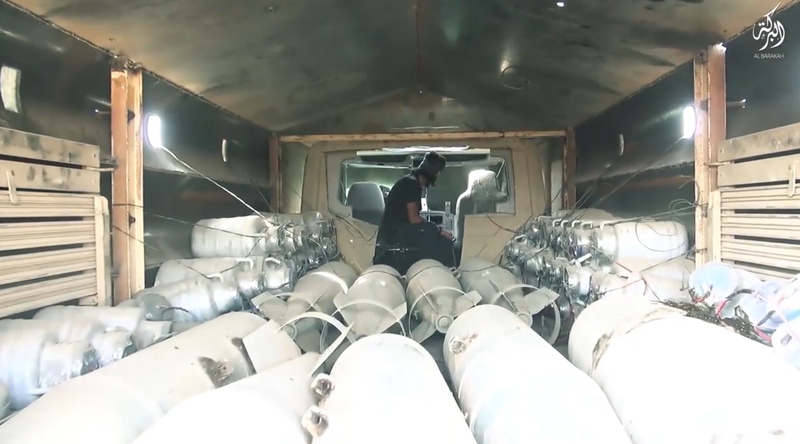 Some of the most common types of explosives used in any VBIED include artillery shells, anti-tank mines, or large metal or plastic barrels/jugs packed with some form of easily accessible explosive (e.g. 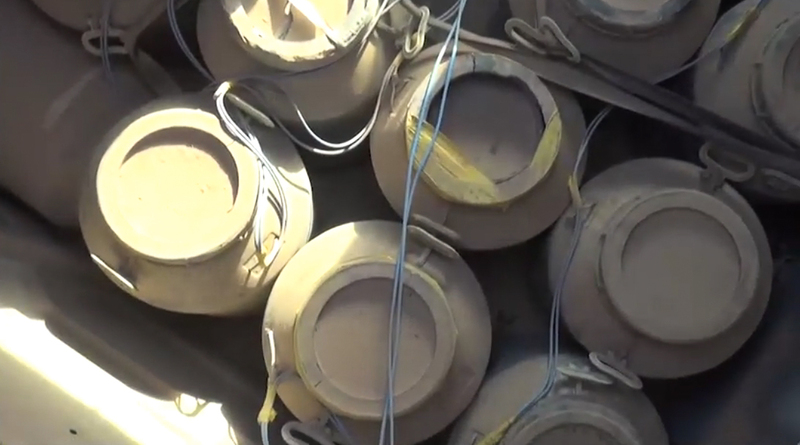 fertilizer-based ANFO or some other HME) – all wired together and connected to a detonator. They’re subsequently detonated using a wide variety of mechanisms, depending on the type of VBIED used. Upon detonation, VBIEDs create powerful blast/shockwaves, and produce vast amounts of shrapnel, as the disintegrating vehicle and objects nearby become fast-flying debris. 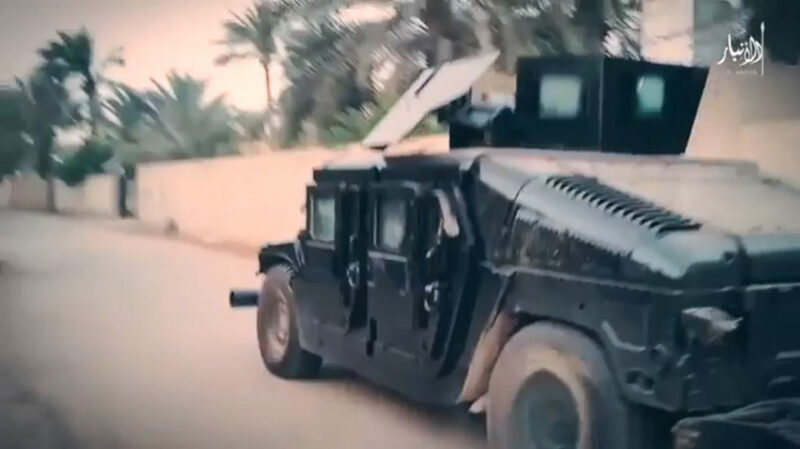 The modern usage of the VBIED stems back to the 1980s in Lebanon and Sri Lanka, and it has since become the most powerful type of weapon readily available to an insurgent group. It’s dirt cheap, it doesn’t require an academic degree to put one together, and the necessary components (a vehicle, explosives, and wiring/detonator) can be procured with ease in armed conflicts and insurgencies where governments lack the ability to project control. During the Iraq war, the insurgents (including the predecessors to IS) were heavily outnumbered in terms of firepower. They were unable to mount large-scale offensives and also lacked the means to wage a sophisticated war. The insurgents had major strongholds in rural areas but also a large presence in many urban centers. Despite that, they were not strong enough to face their enemies in all out conventional battles, and were forced to resort to a campaign of guerrilla warfare. Some of the most common methods of attack included ambushes, ‘hit and run’ attacks, IEDs, kidnappings, decoy checkpoints, as well as targeted assassinations. 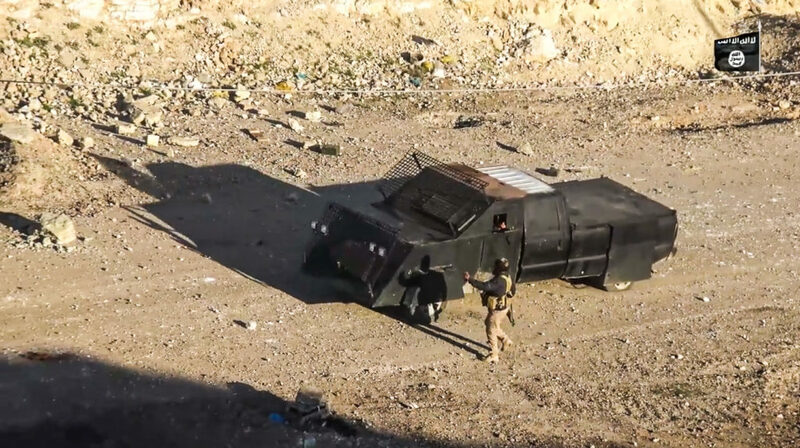 However, one of the most devastating and widely employed tactics of the Iraqi insurgency were parked VBIEDs and SVBIEDs. The first recorded (S)VBIED attack in Iraq’s history happened only days after the US invasion, on March 22nd 2003. 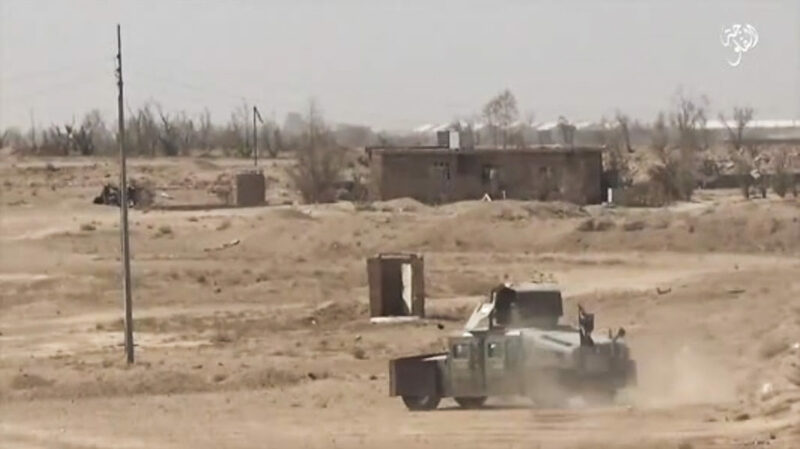 It would mark the beginning of a campaign of VBIED attacks across all of Iraq. Insurgents would regularly make use of unmodified civilian cars and trucks as ‘covert’ parked VBIEDs and SVBIEDs. Using these made sense as it allowed them to blend in with the civilian traffic and get as close as possible to the intended target without being discovered, taking advantage of the element of surprise. 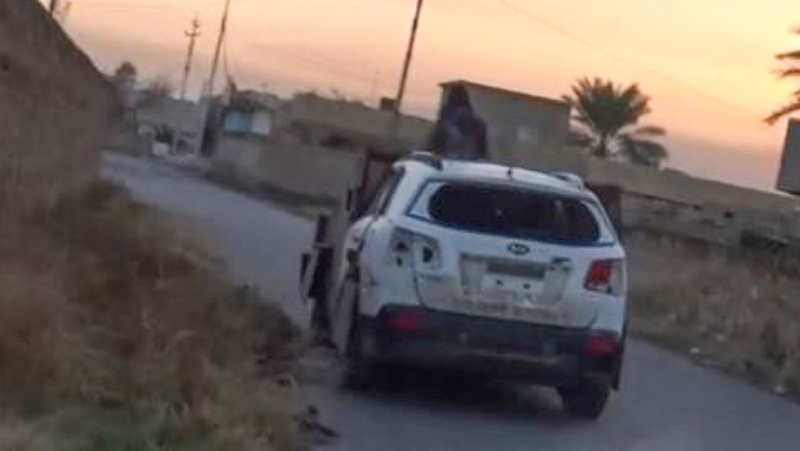 A very powerful side effect of the frequent usage of the ‘covert’ VBIEDs was that it turned every civilian vehicle into a potential car bomb in the eyes of civilians and US/Iraqi forces, undermining morale as well as causing fear and paranoia. 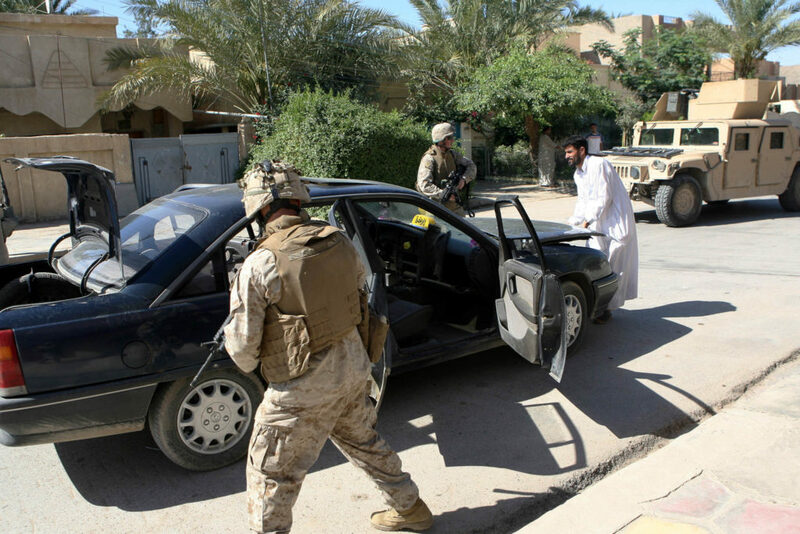 Figure 2: US marines examine a civilian car in Ramadi. May 2006. 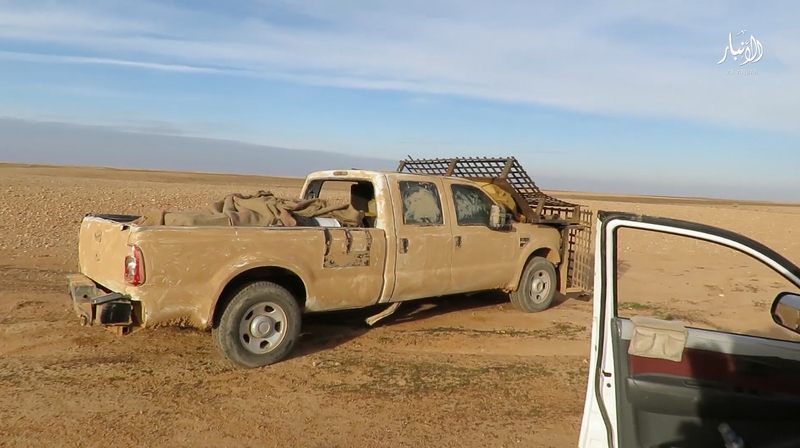 The main difference between parked VBIEDs and ‘covert’ SVBIEDs (other than the fact that the latter involves a driver) is the way they are employed tactically on the battlefield. 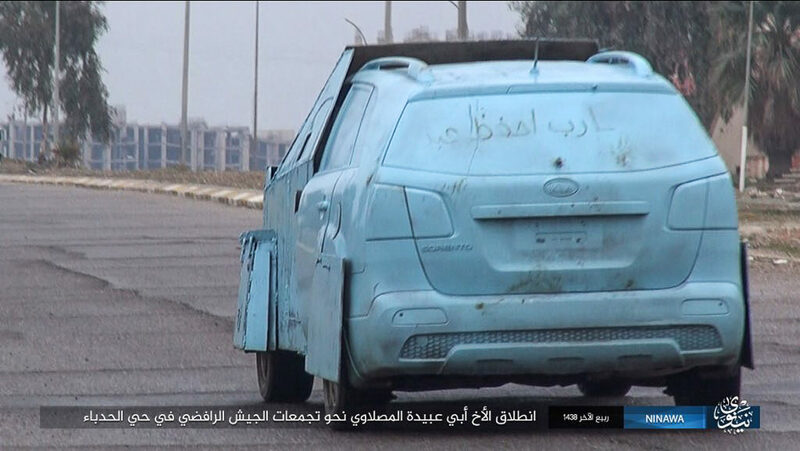 The absence of a driver in a parked VBIED means that its usage is very limited offensively speaking. It’s rarely used in active clashes as it is always static for as long as it takes the driver to leave the area after parking it. 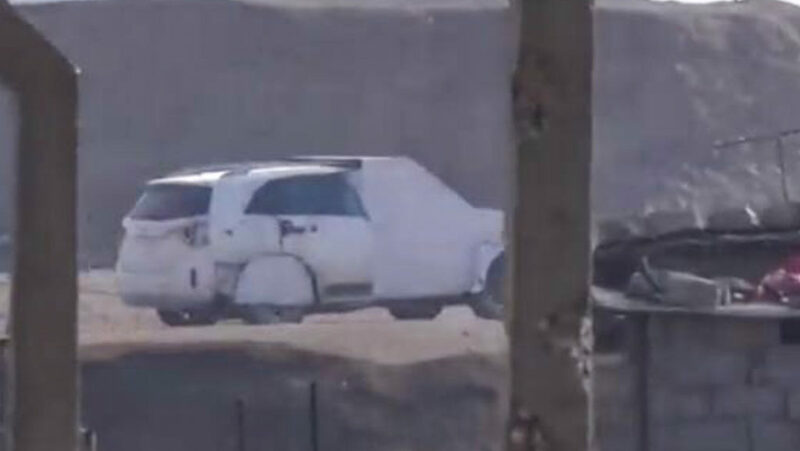 A routine bombing operation using a parked VBIED would include an individual driving the VBIED to and parking it at the desired target, and then leaving the area before it goes off. 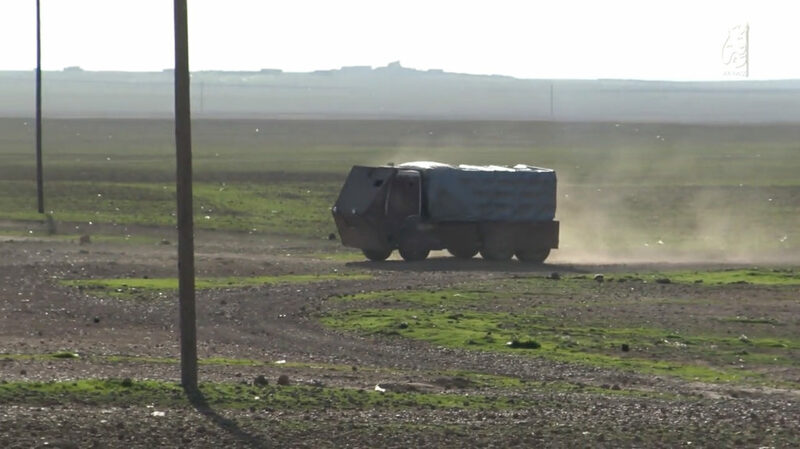 It works well against static and less guarded targets, but when it comes to mobile targets (convoys, patrols) it relies heavily on them approaching the VBIED, not the other way around. 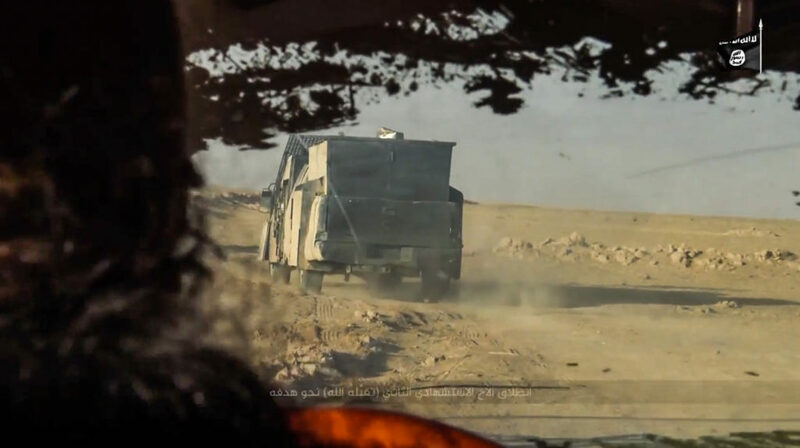 The act of parking and leaving the VBIED at the intended location also increases the likelihood of it being detected prematurely, as someone could raise suspicions. 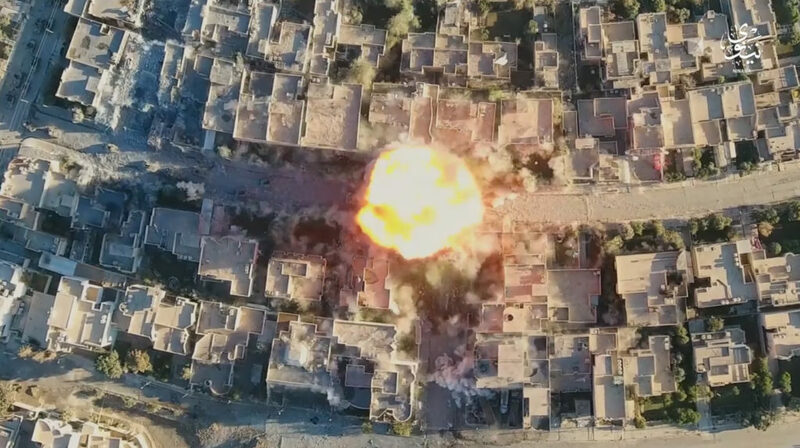 Figure 3: Controlled detonation of a parked VBIED during the Iraq War. ‘Covert’ SVBIEDs on the other hand work well against all types of targets, but they’re especially effective against security targets. The addition of a driver means that they can choose the optimal point of detonation without having to worry about getting out of there alive. This also means that they can approach a sensitive target without raising much suspicion. Typical insurgent tactics when conducting SVBIED attacks on security targets would include a suicide bomber driving his vehicle to and crashing into US/Iraqi convoys or bases before detonating. 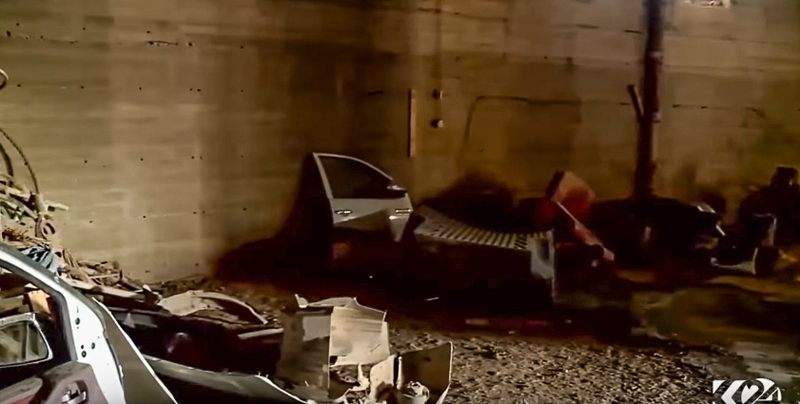 Using larger truck-based SVBIEDs enabled the attackers to crash through the walls of a compound before detonating the bomb to increase the number of casualties. Sometimes multiple coordinated SVBIED attacks would strike the same target – the first one used to breach the perimeter, paving way for the second which would go for the main target. Used in conjunction with small insurgent units in a synchronized assault, it could be very effective. 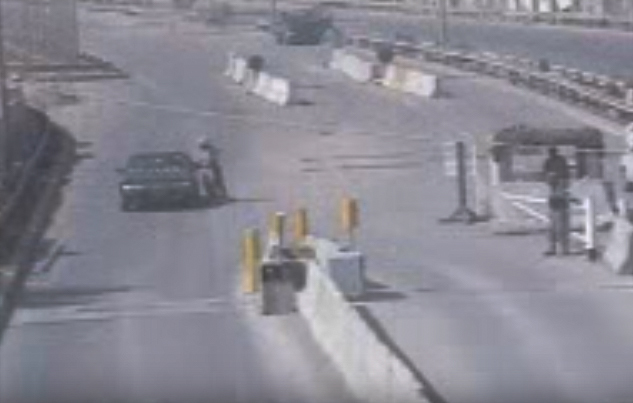 Figure 4: Seconds before a ‘covert’ SVBIED detonates at an Iraqi checkpoint. 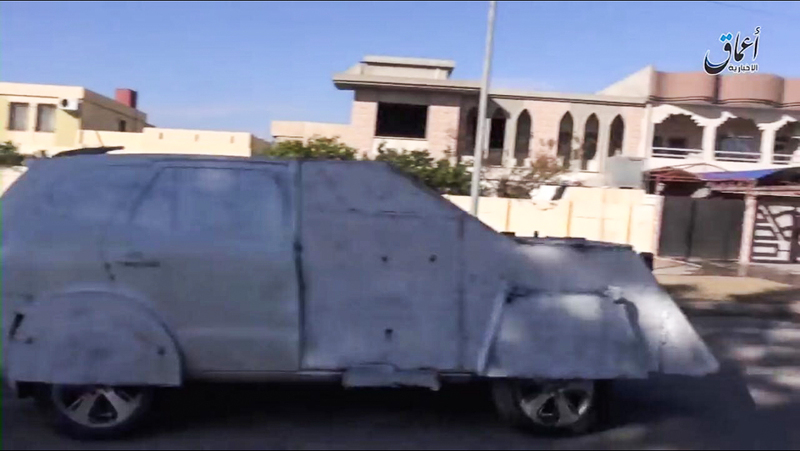 The simpler construction and execution of a parked VBIED operation meant that they were used many times more frequently than ‘covert’ SVBIEDs. In 2005 alone there were 873 reported parked VBIEDs, almost as many as there were confirmed SVBIED attacks during the entire Iraq War (886). Due to a variety of reasons there is no official tally of either type, but these numbers give an indication of the frequency of their usage. The major threat that VBIEDs posed to American outposts meant that extensive fortifications such as large concrete blast barriers and mazes of sand-filled Hesco walls were an absolute necessity. However, making security targets more difficult to strike would only drive insurgents to hit less protected targets. 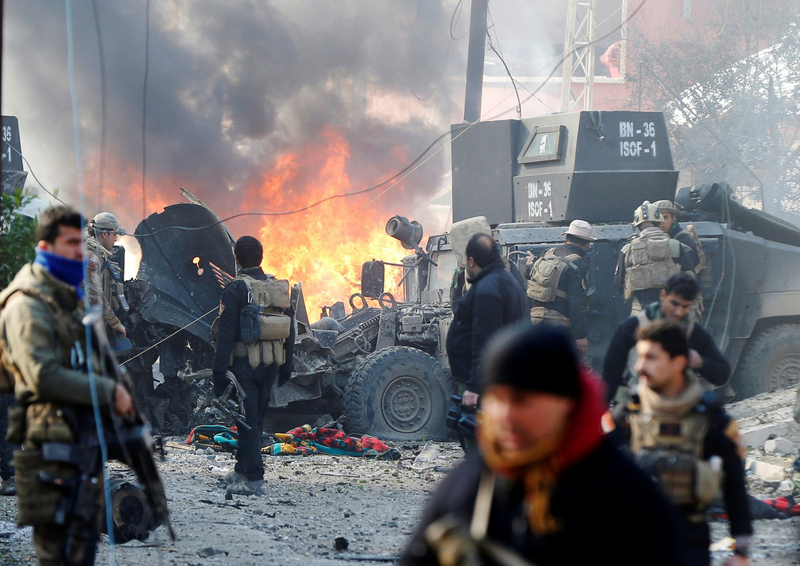 While the US and Iraqi militaries were obvious and logical targets, insurgents attacked civilians for more insidious reasons – to provoke revenge killings of Sunni civilians, thereby furthering Iraq’s descent into political violence. 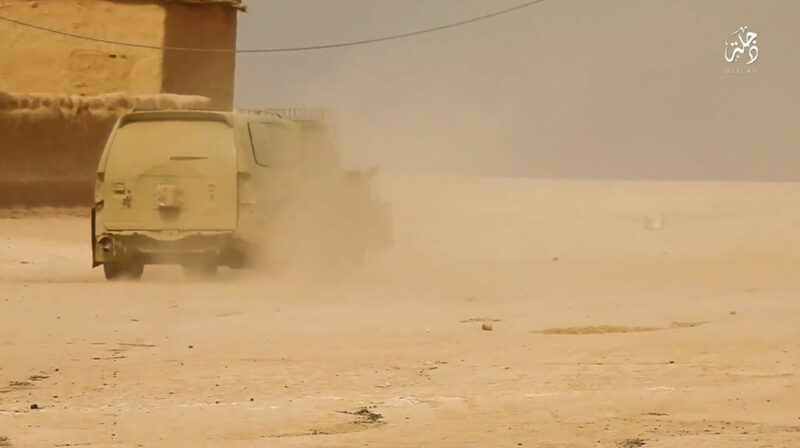 The US also dedicated immense resources and large numbers of soldiers, conducting repeated joint raids lead by US special forces in order to knock down the VBIED threat to a ‘manageable’ level. 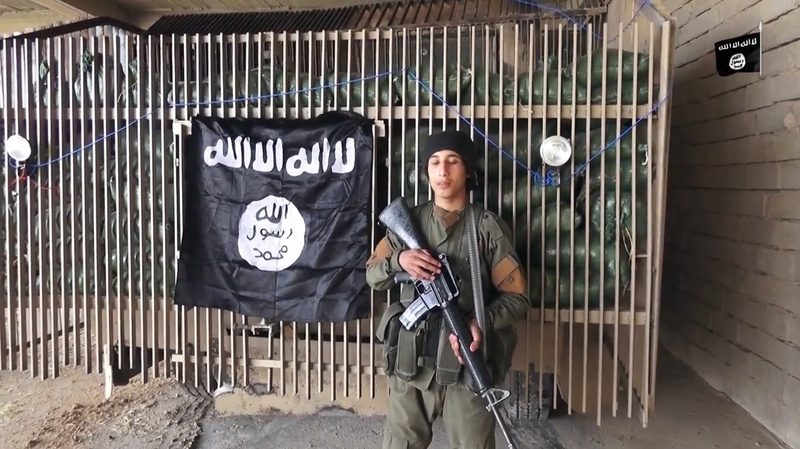 In the end, the insurgents (Islamic State of Iraq) were reduced to a shell of their former self. By the end of 2011, US and Iraqi forces had seriously degraded their capabilities, having killed 34 of the group’s 43 top leaders. The VBIED attacks never stopped completely, but it looked like Iraq was at least moving in the right direction. After US forces left Iraq in late 2011, the reformed and relatively inexperienced Iraqi army was left in charge of protecting the country. In seizing the opportunity, IS launched new waves of parked VBIED & ‘covert’ SVBIED attacks against both civilian & security targets. 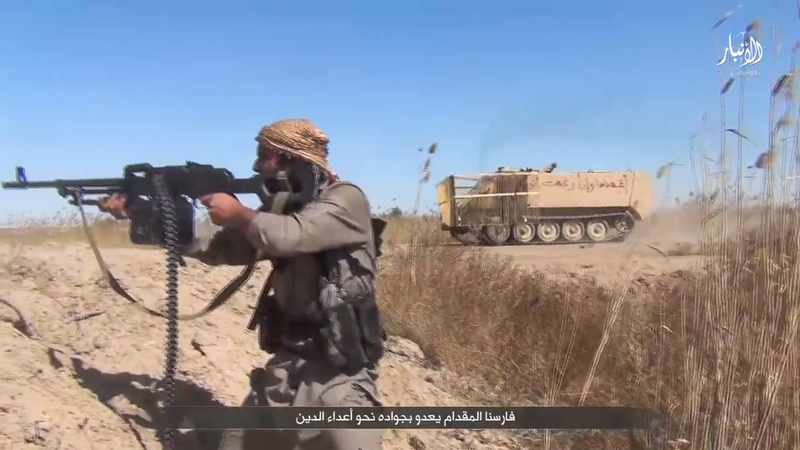 Within six months of the US withdrawal they were once again operationally active in their traditional strongholds of Ninawa, Diyala, Anbar, Kirkuk, and Salahuddin. 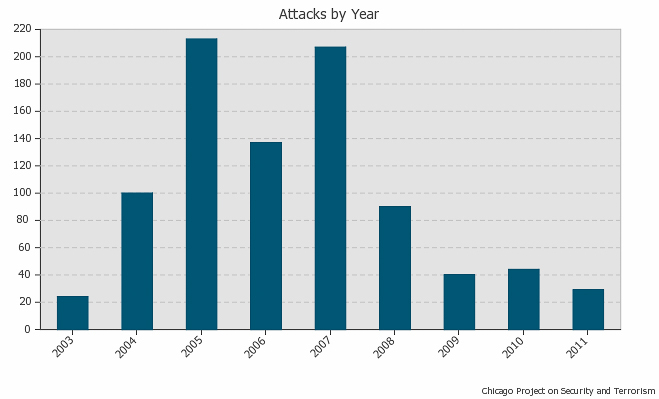 The attacks would continue to increase in numbers, with IS using 399 VBIEDs & SVBIEDs in 2012, and 807 in 2013. As their area of influence increased, so did the sanctuaries in which they were able to manufacture VBIEDs in relative safety. The inception of the Syrian Civil War in 2011 provided a huge opportunity for IS when they needed it the most. The deteriorating security situation in eastern Syria allowed IS to seize control of Syrian-Iraqi border regions in early 2013. IS fighters would enter Syria under the pretext of assisting the rebels in their fight against the Syrian government, while using the war-torn country as a staging area before making inroads into northern Iraq later the same year. Beginning in early 2014, IS started seizing control of large swathes of central Iraqi territory, before sweeping across western, central, and northern Iraq (even capturing Iraq’s second city, Mosul) – as well as taking control over large parts of northern and eastern Syria in the latter half of the same year. 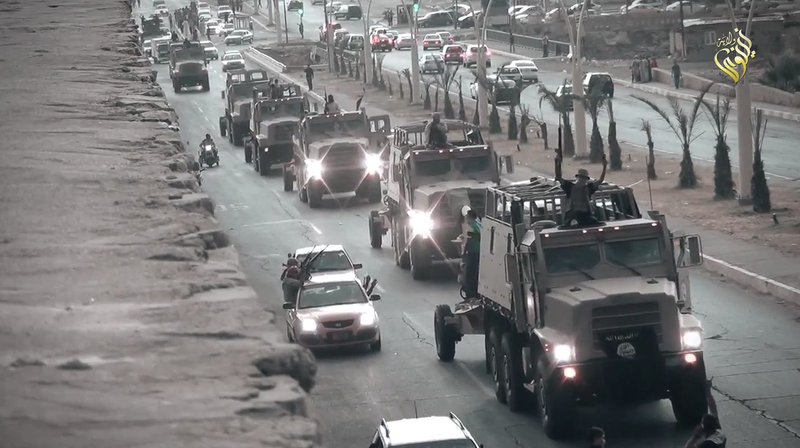 Figure 7: Military parade in Mosul city after the IS takeover in June, 2014. 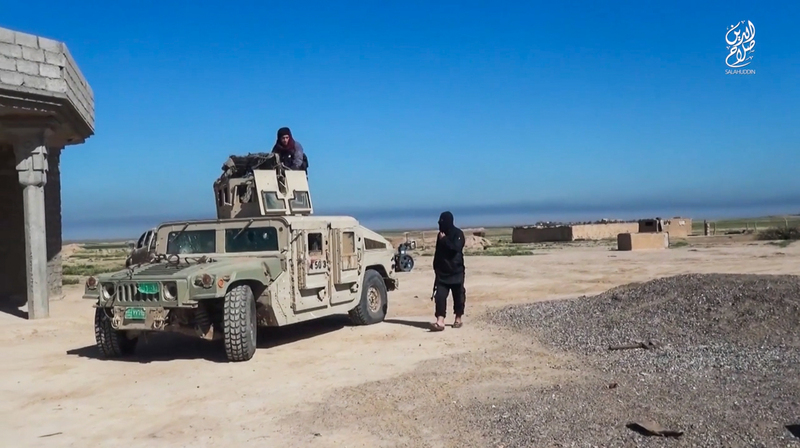 Exposed to active and relatively fixed frontlines, the traditional ‘covert’ VBIEDs lost their element of surprise. Parked car bombs became worthless on the frontline, while the ‘covert’ SVBIEDs required modifications. 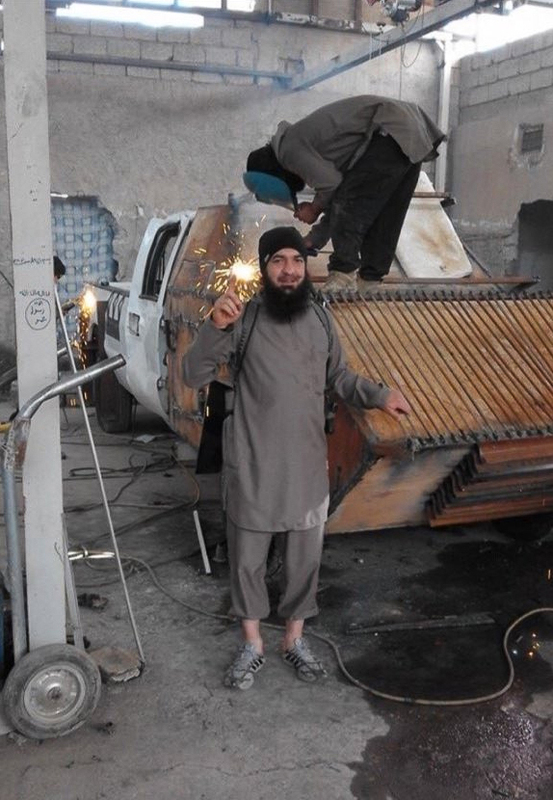 The most important thing when constructing a VBIED has always been to ensure its survival up to the intended target, without it detonating prematurely. 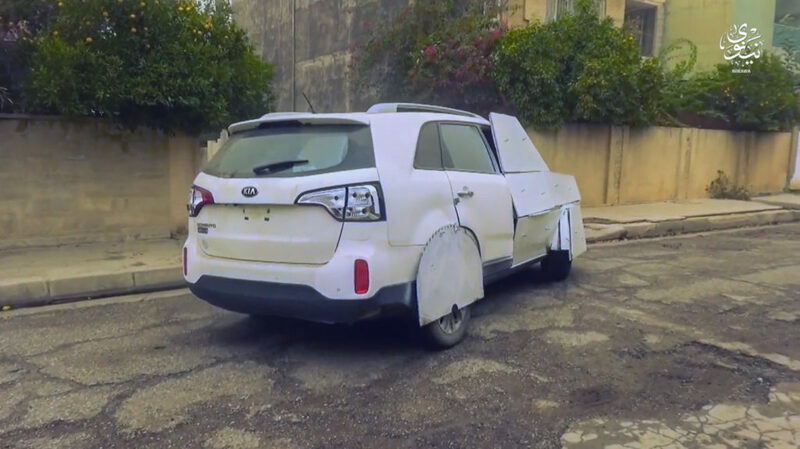 During the Iraq war, this was mostly done by masking them as civilian vehicles in order to avoid suspicion. 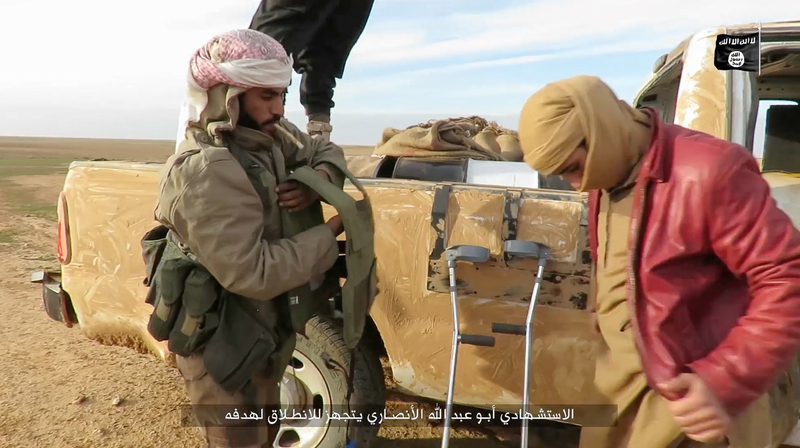 As IS gained more and more territory, they were forced to rethink and adapt, as driving a ‘covert’ SVBIED straight towards an enemy that knew you were coming would dramatically lower its success rate over time. 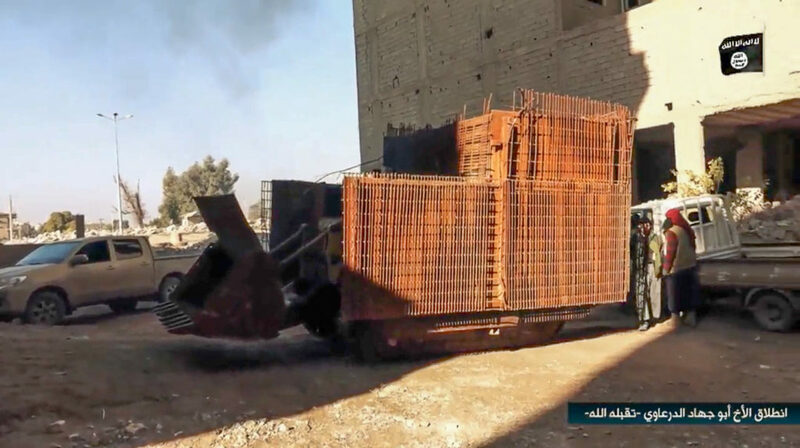 In order to protect their SVBIEDs from incoming fire up until the intended point of detonation, IS started welding steel plates as a form of improvised armor to the front of their SVBIEDs. 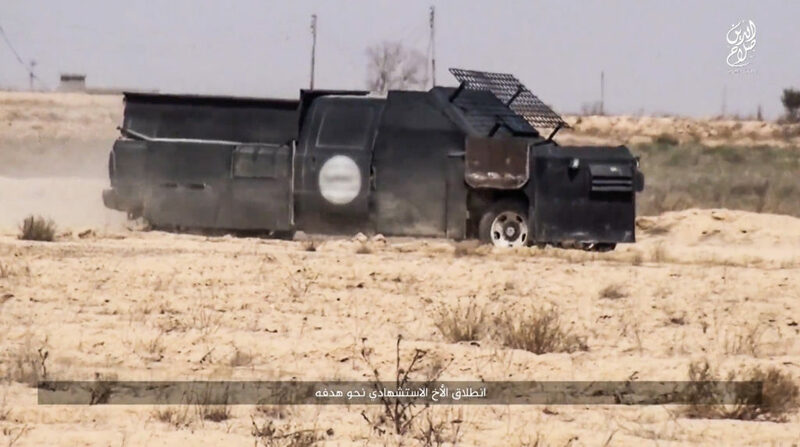 During the Iraq war and up until IS started capturing large swathes of Syrian and Iraqi territory, parked VBIEDs were the most common type of VBIED used. 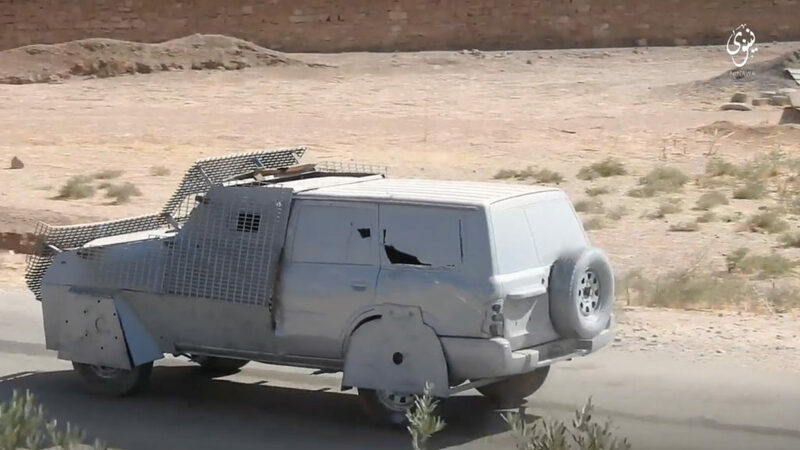 ‘Covert’ SVBIEDs were also used extensively, but the nature of fighting a more well-equipped enemy as an insurgent force, as well as the easier construction of parked VBIEDs allowed IS and its predecessors to make greater use of this type of VBIED. 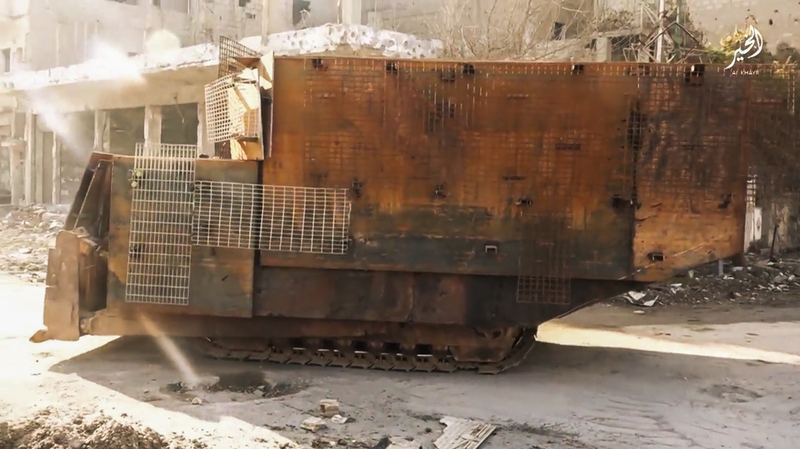 Many people believe up-armored SVBIEDs are a new phenomenon, but that isn’t true. 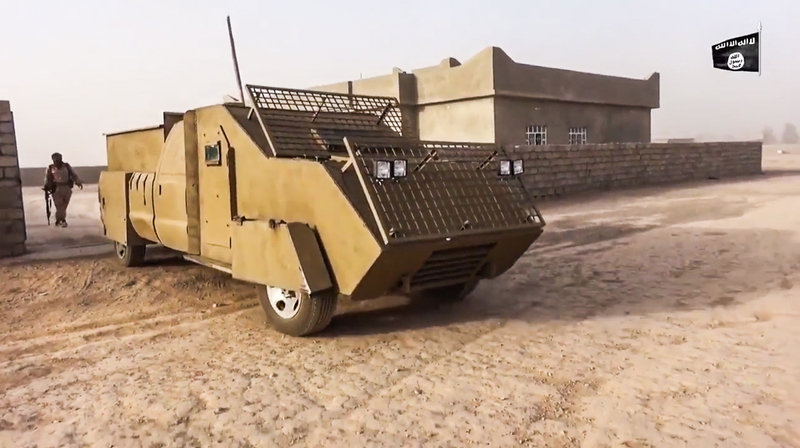 While the majority of VBIEDs used during the Iraq war were ‘covert’, insurgents would sometimes use up-armored SVBIEDs with steel plates welded to the front of the vehicles. At the time its usage was mostly limited to active frontlines around insurgent strongholds and areas that saw intense fighting. 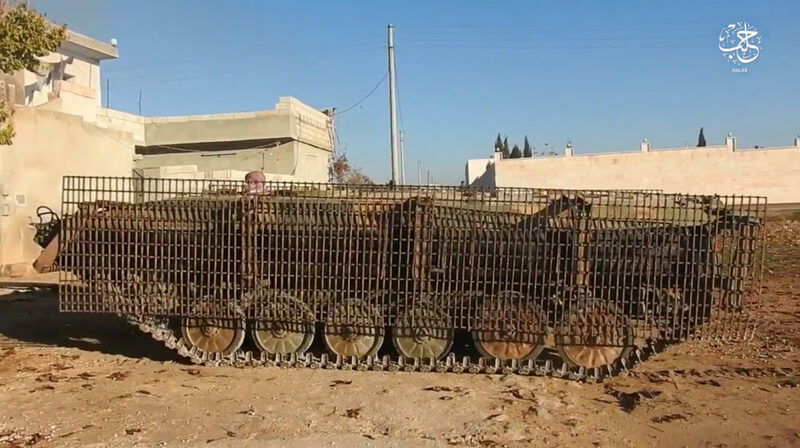 During and after the 2014 IS offensive that resulted in the capture of all this territory, IS started employing up-armored SVBIEDs again in even greater numbers. 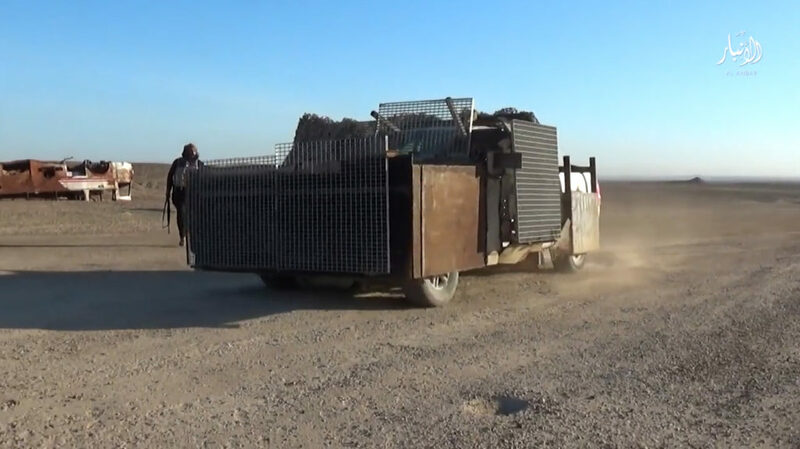 To this day, up-armored SVBIEDs are still the most common type of VBIED used by IS. 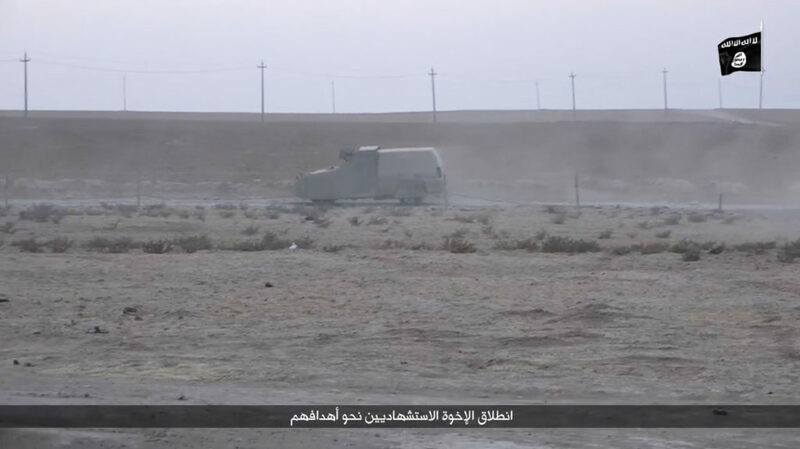 This was a logical change in SVBIED tactics, necessitated by the increase in territorial control and the shift from insurgency-level clashes to a form of more semi-conventional combat. 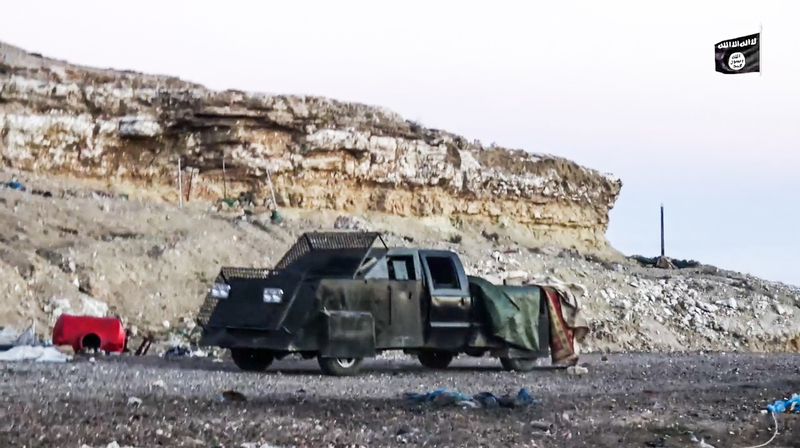 While up-armored SVBIEDs are now the norm, ‘covert’ SVBIEDs and parked VBIEDS are still used in areas where IS don’t hold territory and clashes are more in line with an insurgency. 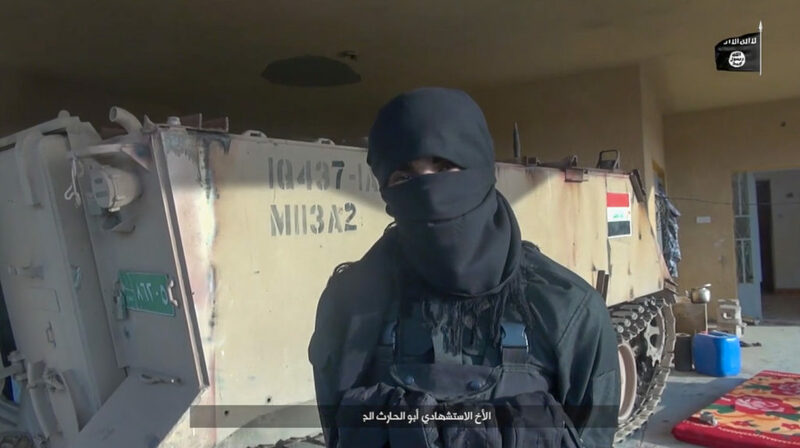 For example, IS conducted 28 parked car bomb attacks and 3 ‘covert’ SVBIED attacks in Baghdad during a 100 day period between October 3rd 2016-January 10th, 2017. This shows that the usage of up-armored SVBIEDs is closely related to the amount of territorial control and the intensity of fighting in a given area. 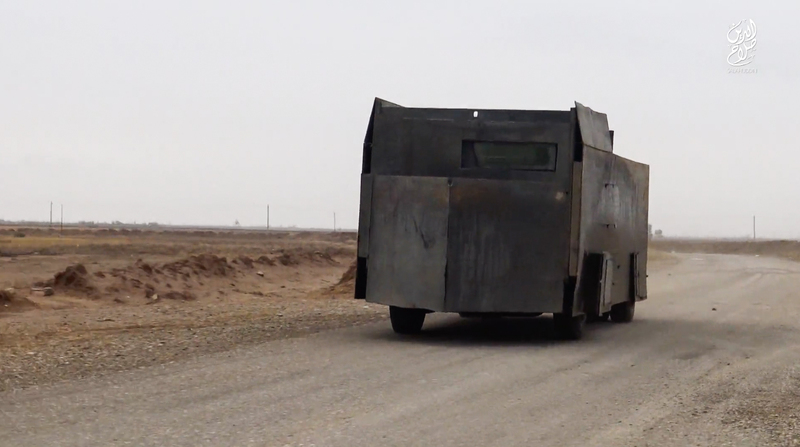 ‘Covert’ VBIEDs and SVBIEDs are used in areas where IS don’t control territory, while up-armored SVBIEDs are exclusively used on active frontlines. 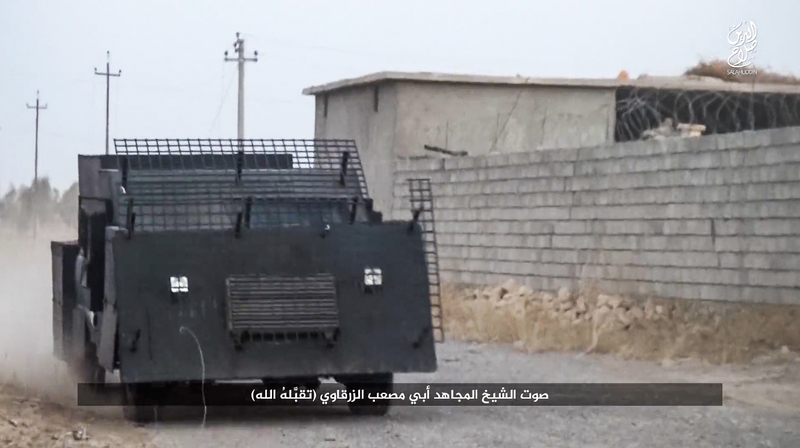 Figure 8: Up-armored tanker truck SVBIED used by IS during the initial takeover of Mosul city in early June, 2014. This is true not only for the conflict(s) in Syria and Iraq, but can be applied to any conflict where a non-state actor using SVBIEDs gains territorial control. 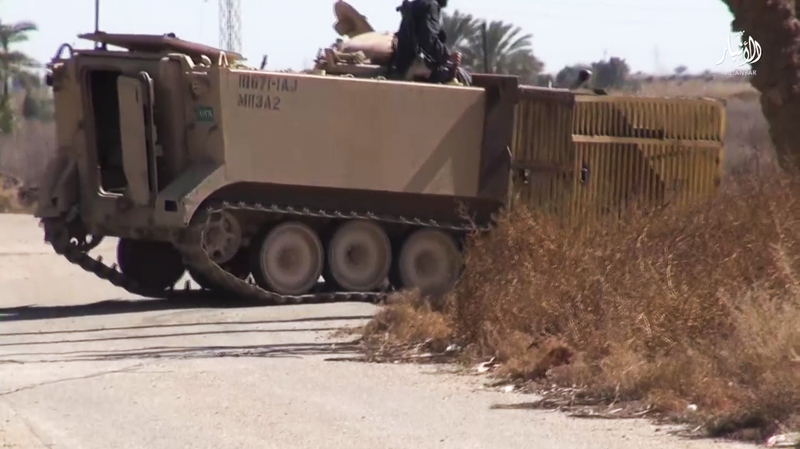 Libya is the only country outside of Syria and Iraq where IS have held a substantial amount of territory, and when IS fighters in Libya captured these territories, they too began using up-armored SVBIEDs due to the change in battlefield conditions. While up-armored civilian vehicles used as SVBIEDs became the norm, IS also began using military armored vehicles for the same purpose. 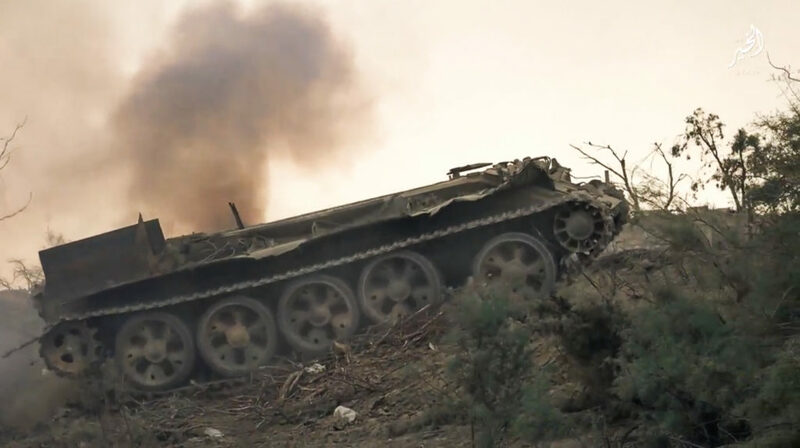 Having captured thousands of military vehicles of different types in the 2014 offensive, they had quite a few to spare even after deploying many of them in their original roles. 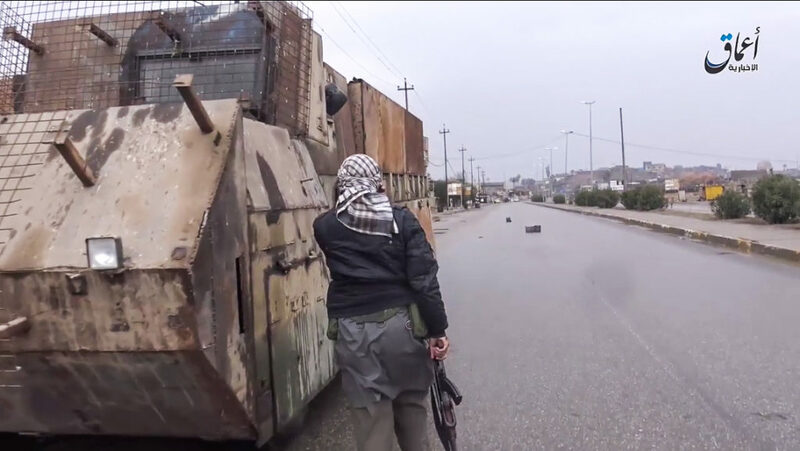 The built-in armor made them perfect for use as SVBIEDs in a more conventional fight. 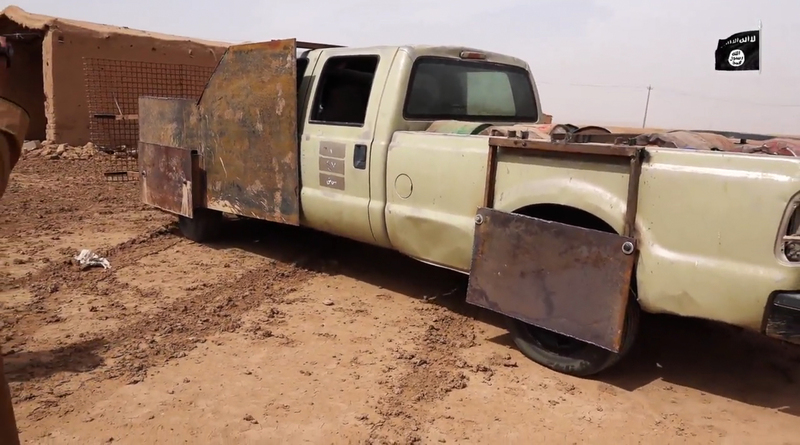 Captured US-made vehicles require regular maintenance in order to not constantly break down, a technical skill not in abundance among the ranks of IS. This, coupled with the fact that US-made military vehicles make for prime air strike targets meant that a swift conversion to SVBIED was very logical. 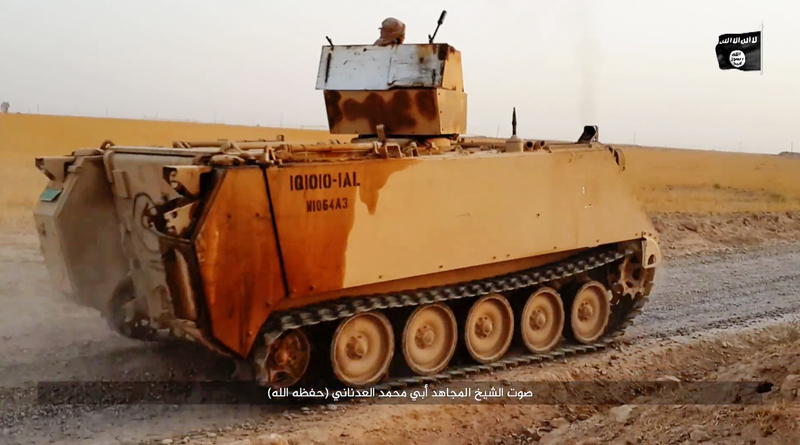 Figure 10: Up-armored SVBIED based on a BMP-1 armored personnel carrier, used at Menagh airbase on August 5, 2013. 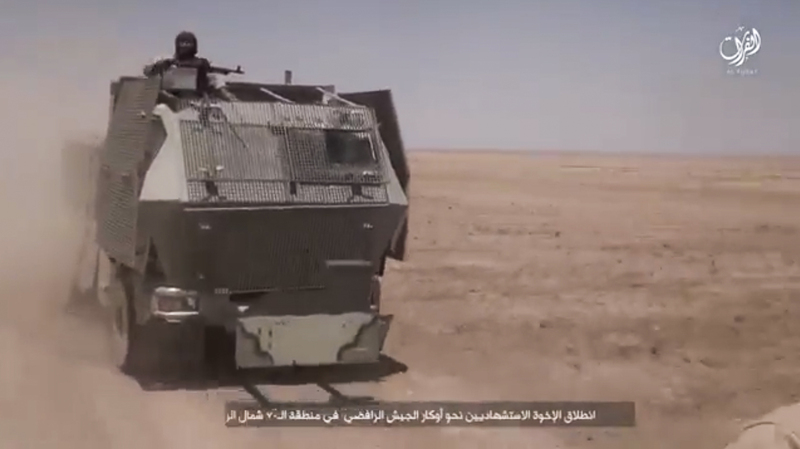 During the rise of IS through 2013-14 and at its peak, the main application of up-armored SVBIEDs in active combat was its ability to initiate battles by softening static enemy defenses before a ground assault. IS even set up ‘Suicide Battalions’ that accompany other IS vehicle formations into battle, clearing the way before a final push. Seeing as IS operate at a numeric disadvantage most of the time, the usage of up-armored SVBIEDs in combat works as a powerful force multiplier, allowing a smaller attacking force the ability to overrun larger enemy contingents. 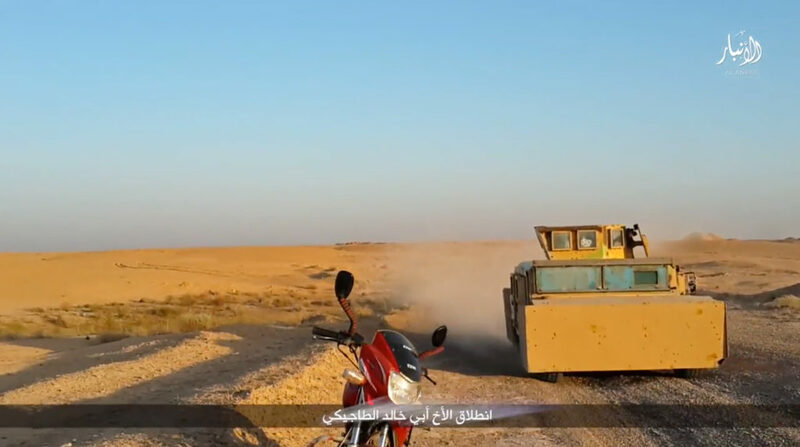 Part of its effectiveness is that the force being targeted by an up-armored SVBIED only has a limited amount of time to cause a premature detonation of the vehicle until it becomes too dangerous. 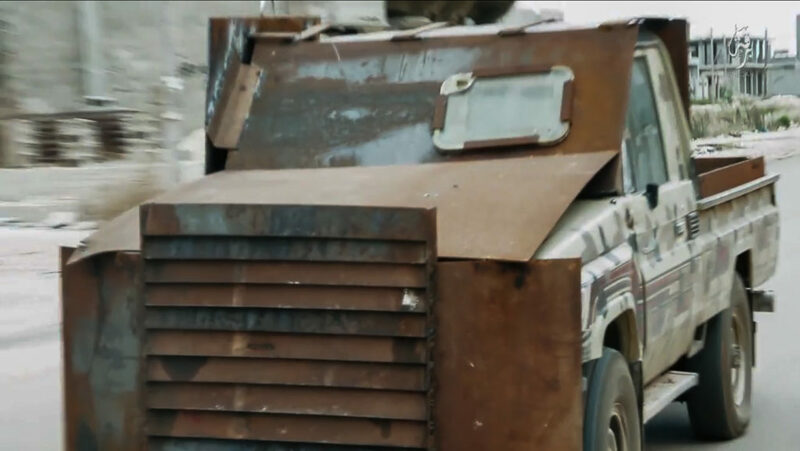 The improvised armor on the SVBIEDs makes it more difficult for the defenders to cause a premature detonation, and when they fail to do so they’re easily routed from their positions, and armored vehicles/equipment are commonly left behind. 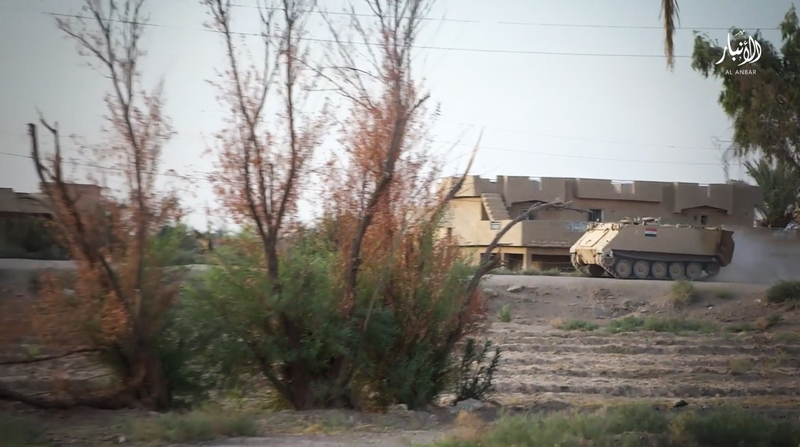 It’s important to note that in many cases, the success of an up-armored SVBIED in combat hinges on the enemy lacking proper training, equipment, as well as defensive structures. While most military forces would have a problem dealing with parked VBIEDs and ‘covert’ SVBIEDs, the success rate of up-armored SVBIED usage in combat would sink if used against an army that had the necessary training and equipment to combat it. 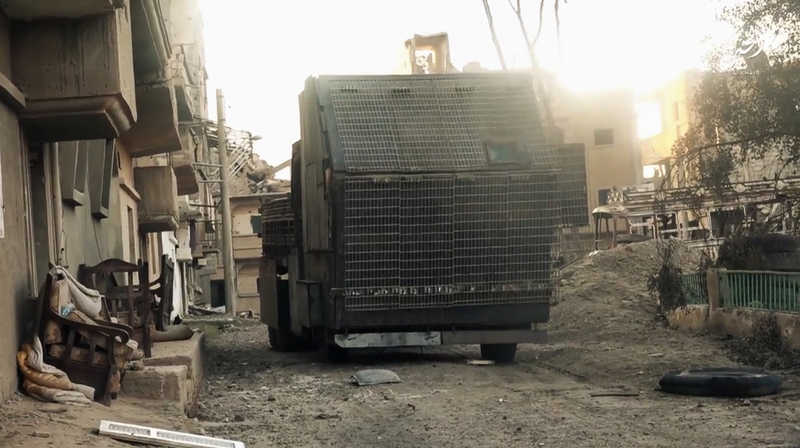 Nonetheless, SVBIEDs are a powerful weapon and there’s no foolproof method of countering it. 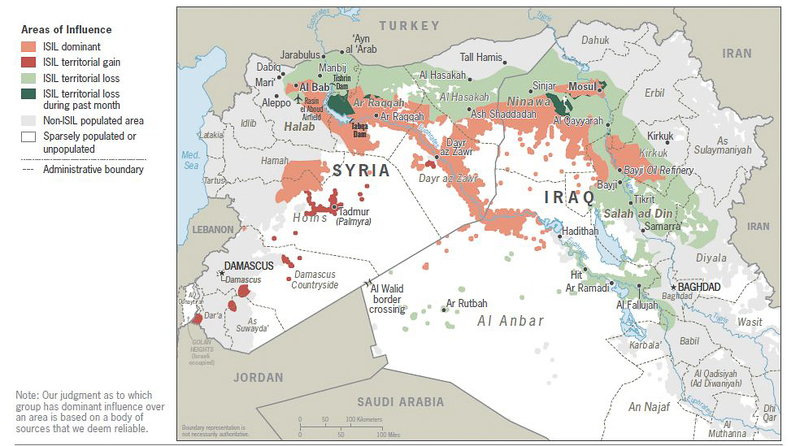 Figure 11: Since August 2014, IS have lost 62% of territory it once controlled in Iraq, and 30% in Syria. 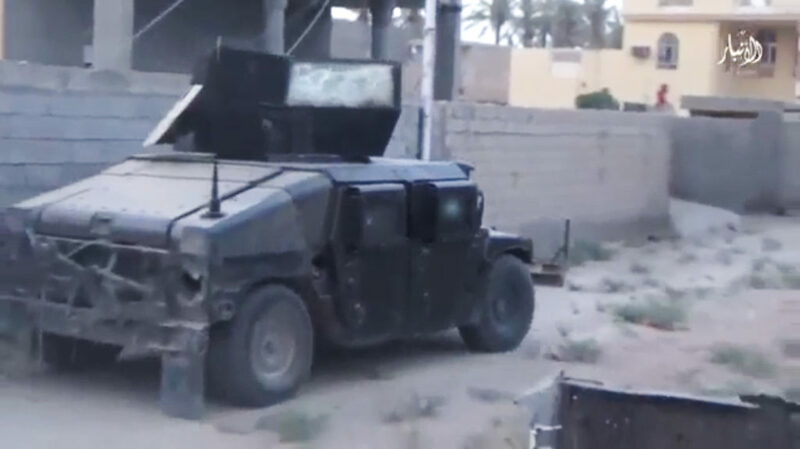 When IS overran the remaining ISF positions in Ramadi in May 2015 and captured the entire city, close to 30 up-armored SVBIEDs were used in the offensive. 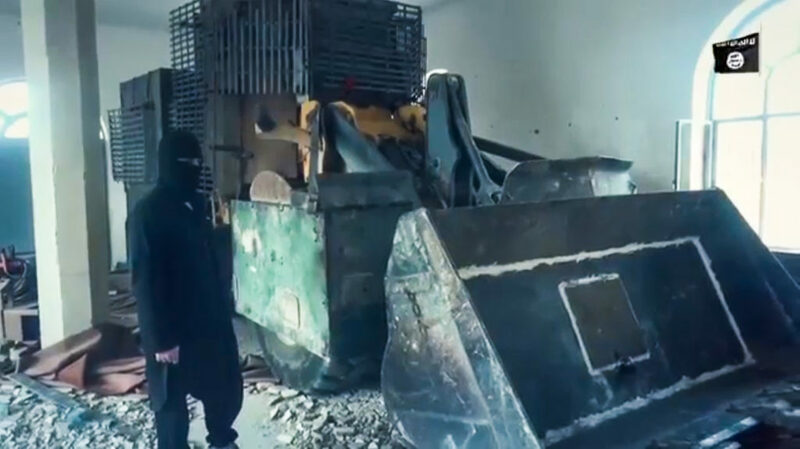 In multiple instances the up-armored SVBIEDs were preceded by up-armored front-end loaders and bulldozers that removed concrete blast barriers in order to clear the way for the SVBIEDs. 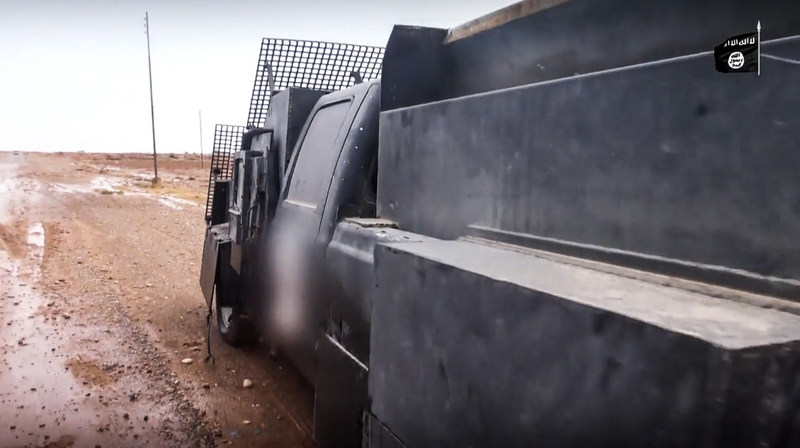 In one such case, an up-armored SVBIED based on a front-end loader barreled through two layers of concrete blast barriers protecting an ISF position, before detonating right on target. The up-armored SVBIED that came afterwards took the same route, and the subsequent detonation caused the 8-story building to collapse. 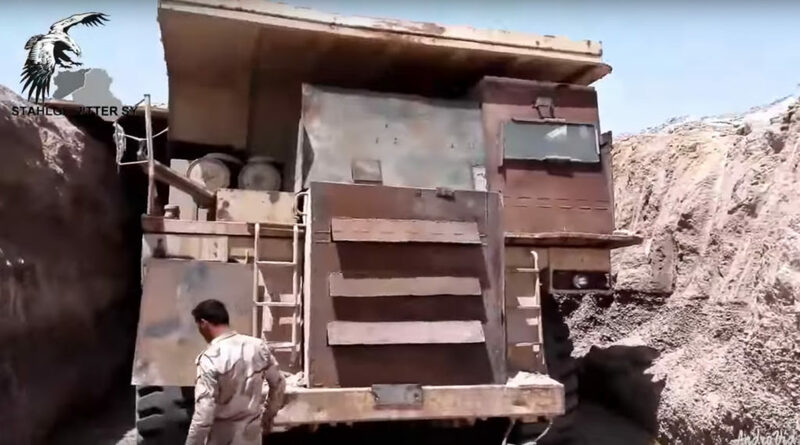 This is a clear demonstration of the important function that heavy construction equipment can serve in conjunction with or in use as up-armored SVBIEDs, especially when attacking fortified targets. 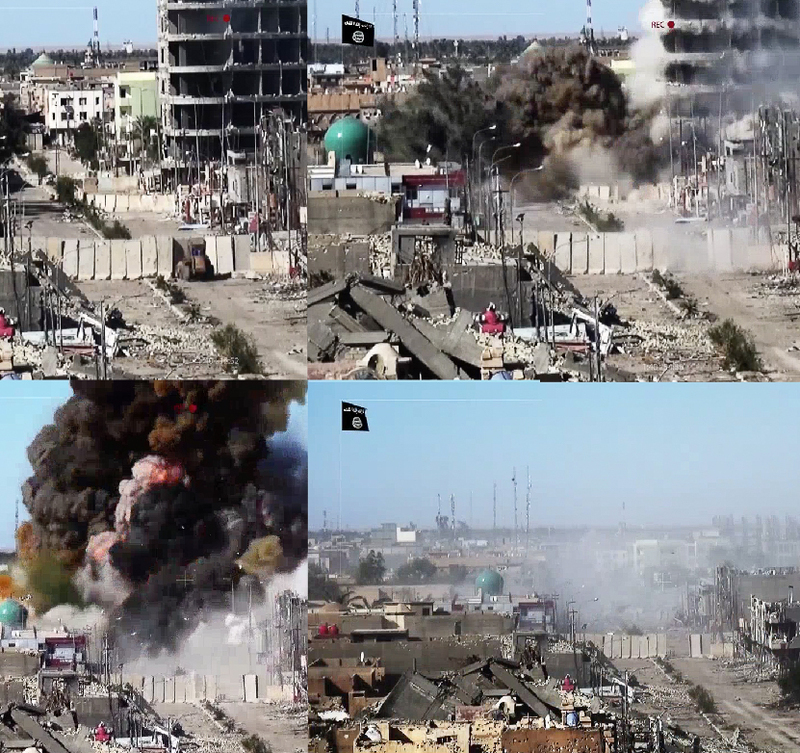 Figure 12: Sequence from an IS video showing the devastating effect of heavy construction equipment usage as SVBIEDs in an attack on a fortified ISF position in Ramadi, 2015. 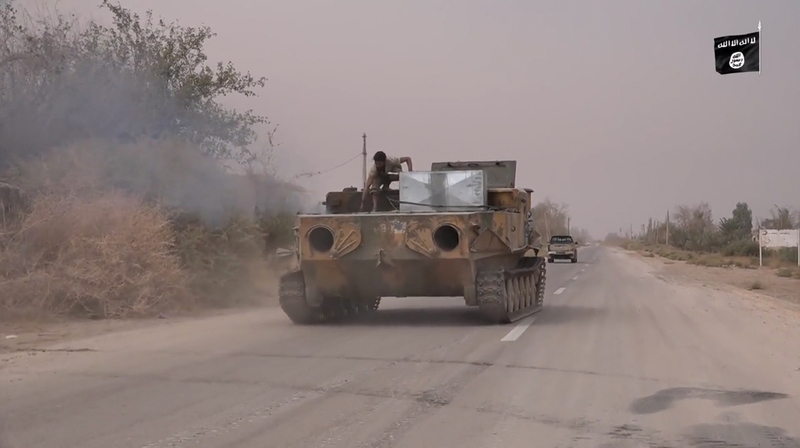 Both up-armored SVBIEDs used in the above attack took direct hits from RPG-7s fired by the defending ISF contingent, but the vehicles continued driving unimpeded. 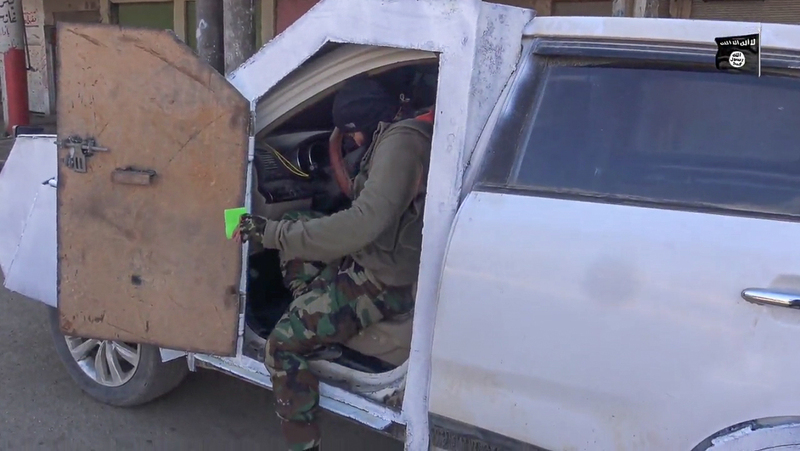 This is one of the main functions of the added improvised armor, as it theoretically allows the SVBIED drivers to choose the optimal point of detonation themselves, even when under direct enemy fire. The addition of improvised armor is not a guarantee that it’ll work every time, but it substantially increases the chances of an SVBIED being able to reach its target. 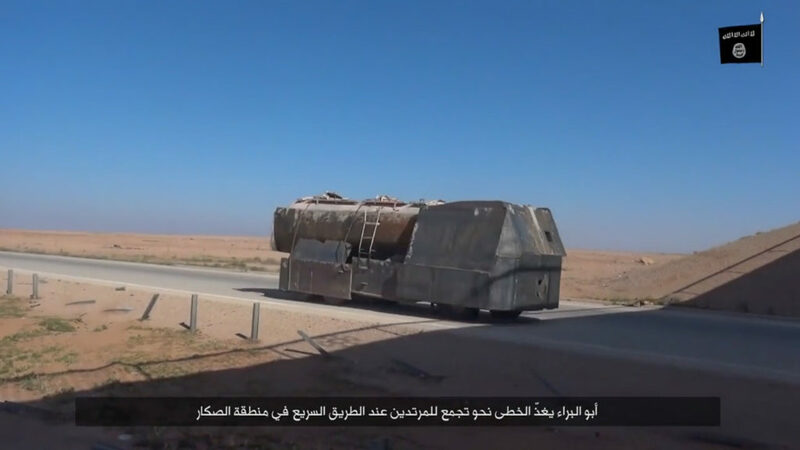 While the improvised armor used by IS on their SVBIEDs in the past has not been very uniform in terms of design or quality, they’ve borrowed some techniques from mainstream armored vehicle manufacturers. These can be divided into two main types: Sloped and slat armor. Sloped armor consists of steel plates welded to the front of the vehicle at an angle and works by increasing the effective thickness facing frontal impacts. For example, a 100mm thick armor sloped at 45 degrees becomes 141mm of effective armor. The angled armor plating also functions by being able to ricochet incoming rifle and machine gun fire of varying calibers instead of absorbing the force head on, and can even deflect AT munitions if lucky enough. When a projectile hits sloped armor, its path might be curved, causing it to move through more armor – or it might bounce off entirely. Slat armor generally takes the form of a metal grid or bars, and is typically fitted over the improvised armor plating with some spacing. If an AT munition is fired at the vehicle, slat armor can provide a slightly increased stand-off distance between the explosion and the vehicle, negatively impacting the munition’s penetration capabilities. Both sloped and slat armor can also cause AT munitions to fail and not detonate at all. 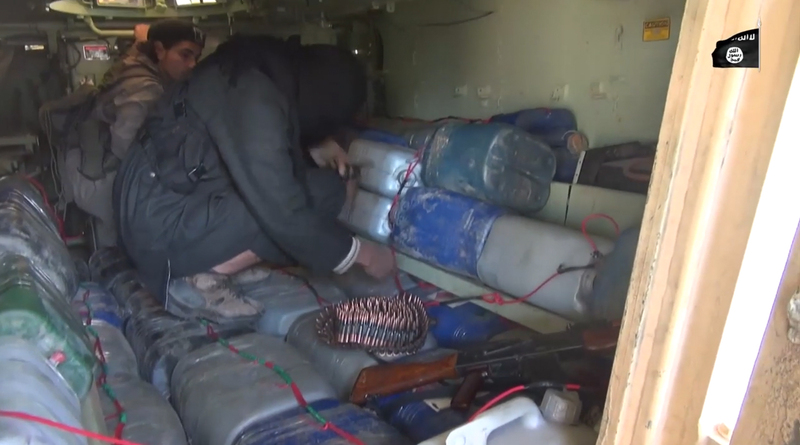 Figure 13: Inside an IS VBIED factory producing up-armored SVBIEDs. Workers add slat armor on top of the sloped frontal armor. 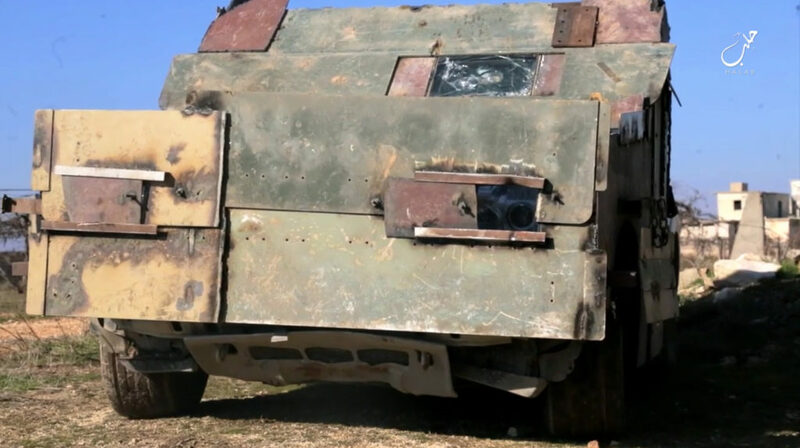 While the improvised armor’s main purpose is to protect the engine, wheels, the driver, as well as any other essential parts, it also serves as a protective barrier for the payload. 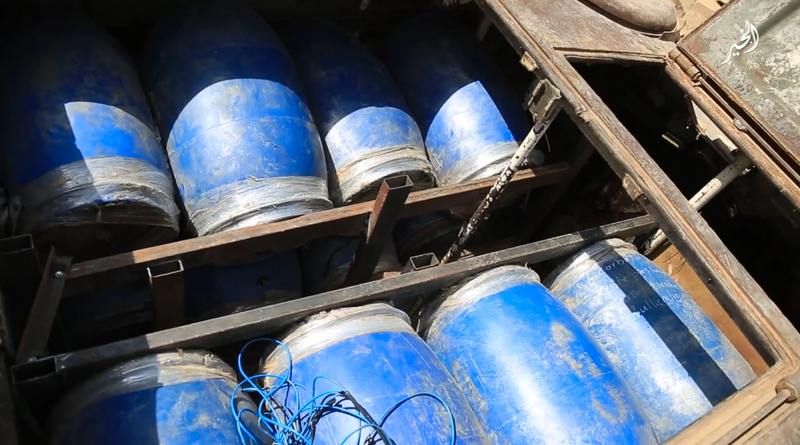 There are a variety of different containers used to store the HME that often make up the payload of SVBIEDs. 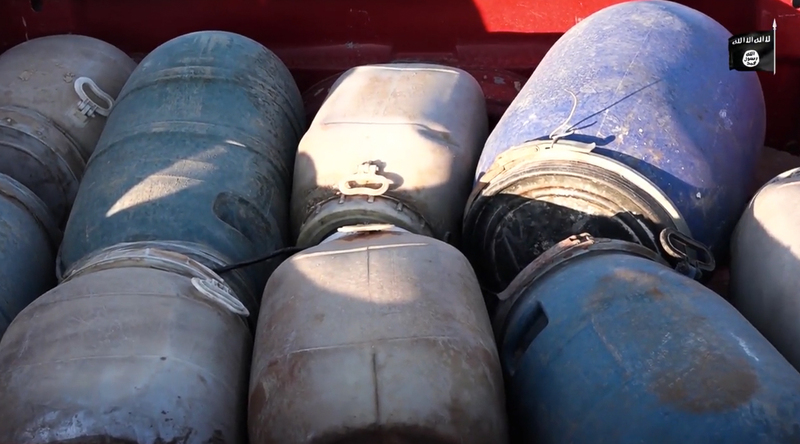 Usually a number of barrels/jugs made out of plastic or metal are filled with HME and wired together. 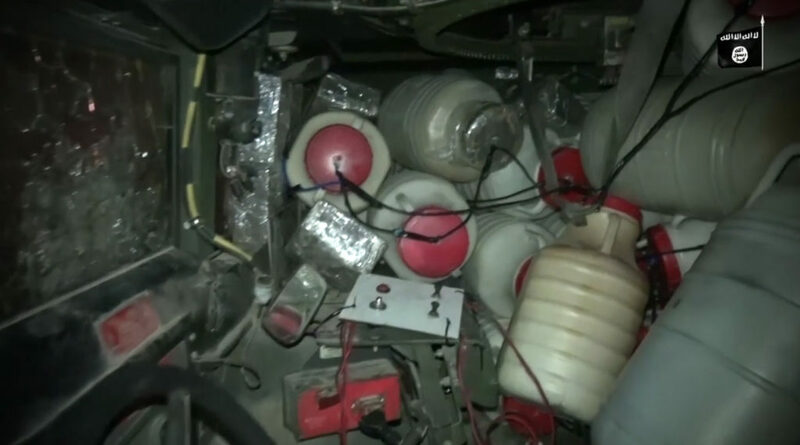 Used individually they can act as smaller IEDs, but wired together and connected to a detonation mechanism they serve as payload in the VBIEDs. In more rare cases anti-tank mines, artillery shells, and other types of heavy munitions are used. July 12, 2015. Salahuddin province. August 10, 2015. Aleppo province. November 4, 2015. Deir ez-Zor province. November 15, 2015. Shamal Baghdad province. November 23, 2015. Salahuddin province. January 2, 2016. Anbar province. January 13, 2016. Deir ez-Zor province. February 19, 2016. Aleppo province. May 24, 2016. Ninawa province. June 14, 2016. Deir ez-Zor province. July 3, 2016. Deir ez-Zor province. September 7, 2016. Barakah province. September 22, 2016. Dijlah province. Up-armored SVBIEDs are currently being built on an industrial scale. IS claimed to have conducted 815 SVBIED operations in 2016 alone, the overwhelming majority up-armored. This is the highest number of SVBIED operations conducted in a year by any group, ever. In order to sustain a campaign the size of this, IS operates a massive network of VBIED workshops that manufacture up-armored SVBIEDs on a scale not seen before. By capturing large swathes of Syrian and Iraqi territory, IS gained a relative safe haven out of which these workshops are based. 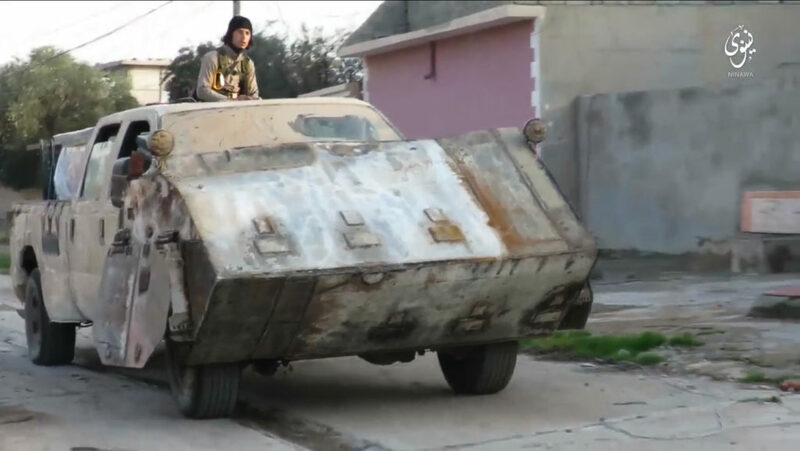 Though not safe from aerial attacks, the widespread availability of both vehicles, explosives, and steel plating for use as improvised armor ensures that IS will be able to churn out up-armored SVBIEDs for as long as they are allowed ‘free’ movement and have access to an abundance of VBIED workshops out of which these weapons are manufactured. 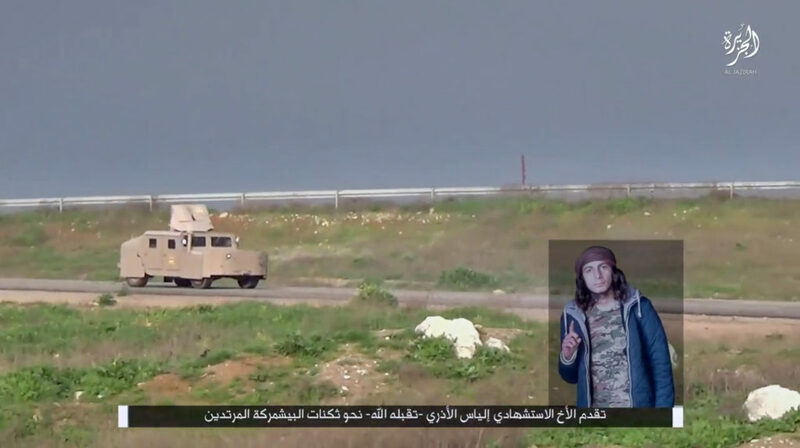 In order to gauge what type of up-armored SVBIEDs are most commonly used nowadays, I looked through and analyzed 18 months worth of IS provincial-level video releases from Syria and Iraq, published between July 1, 2015 – January 1, 2017. 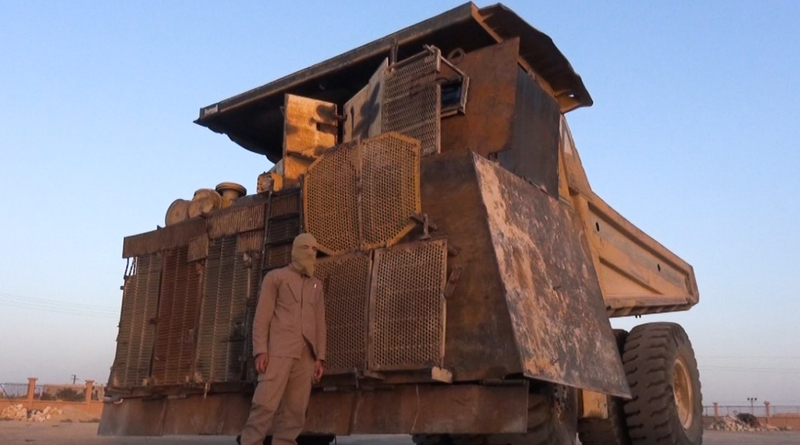 Not every SVBIED used on the battlefield is featured in IS photo reports, and even less so in videos. However, looking at the videos gives a lot more context and is not as much of an overwhelming task as it would be to catalogue every single photo report released in the same time period. During this time period (July 1st, 2015-January 1st, 2017), there were 245 VBIEDs of different types included in IS videos. There were more visible detonations than there were sightings of actual vehicles, so I chose to only include the ones where I was able to visually confirm the vehicles in this analysis. IS claimed 815 SVBIEDs in 2016 alone (several times the number I found in IS videos during a 6 month longer time period), but analyzing the dataset should yield a semi-representative sample of SVBIED usage during this time period. Out of the 245 VBIEDs featured, 178 (72,7%) were from Iraqi provinces, while 67 (27,3%) were from Syrian provinces. This was expected, as the majority of fighting in the past 18 months has taken place in Iraq as part of the ISF’s current objective of pushing IS out of the country. That also includes the ongoing battle of Mosul, which I will touch on later. I have divided up the VBIEDs into three main categories (civilian vehicles, military vehicles, and heavy construction vehicles) which will further be divided into 11 subcategories. I will present them below, ranging from the largest to the smallest category. If you’re interested in viewing all the pictures I collected in the data set for each type, I will list the complete albums at the bottom of the article in the source section. Keep in mind that the dates on the photos featured in this section indicate when the video it was featured in was released, not when the VBIED was used. 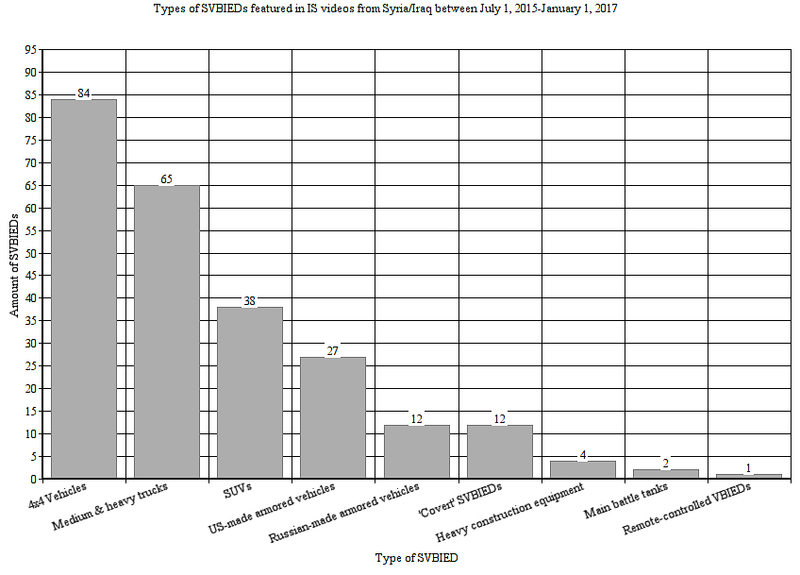 Figure 14: Graph detailing the different categories of SVBIEDs that were featured in IS videos during this time period. 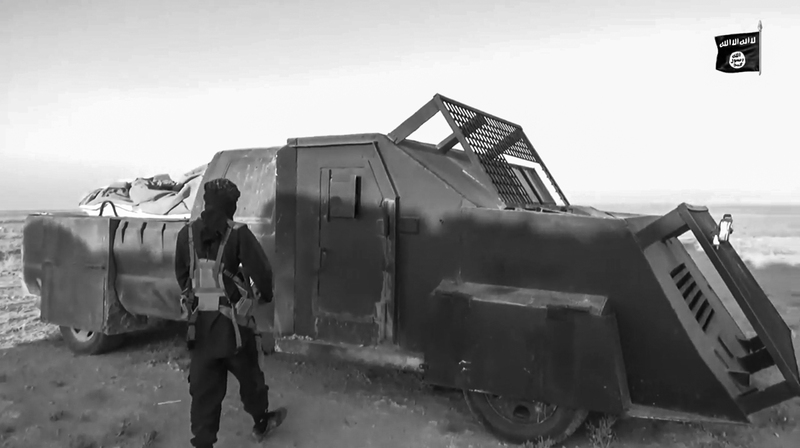 Out of all 245 VBIEDs featured in IS videos during this time period, 200 (81,6%) were based on civilian vehicles. 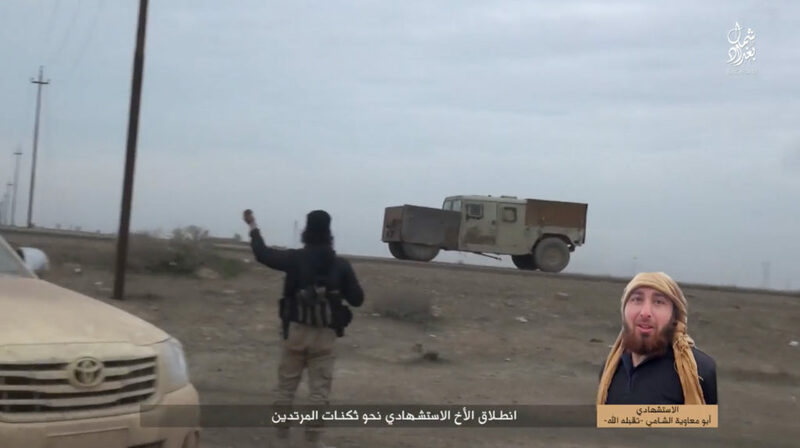 In order to clarify, I will further divide this category into five sub-categories: 4×4 vehicles, medium and heavy trucks, SUVs, ‘covert’ SVBIEDs, and remote-controlled VBIEDs. September 5, 2015. Kirkuk province. November 6, 2015. Anbar province. December 30, 2015. Anbar province. February 2, 2016. Anbar province. May 16, 2016. Salahuddin province. June 4, 2016. Furat province. June 5, 2016. Anbar province. 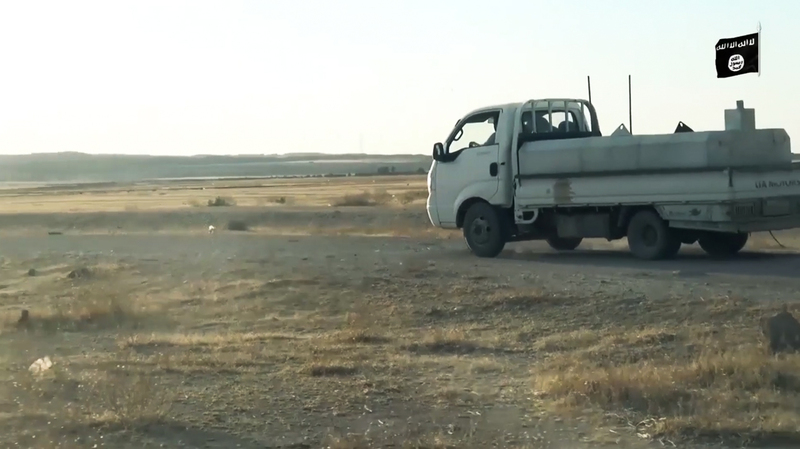 4×4 vehicles were the most common type of SVBIED used during the time period, with 84 (34,3%) being of this type. It’s a fairly simple design, with improvised frontal and side armor based on steel plates. Sometimes the frontal armor is sloped, with an added layer of slat armor. Armor is usually also added in front of the wheels, in order to protect them from incoming rounds. Narrow slats to the frontal armor provide air intake for the engine so as to prevent overheating. Typically a small window is left in the frontal armor so the driver can see where he’s going. September 14, 2015. Salahuddin province. October 27, 2015. Salahuddin province. December 9, 2015. Dijlah province. January 6, 2016. Salahuddin province. Febryary 17, 2016. Salahuddin province. February 27, 2016. Dijlah province. April 12, 2016. Salahuddin province. April 24, 2016. Salahuddin province. May 5, 2016. Salahuddin province. May 22, 2016. Kirkuk province. July 14, 2016. Dijlah province. 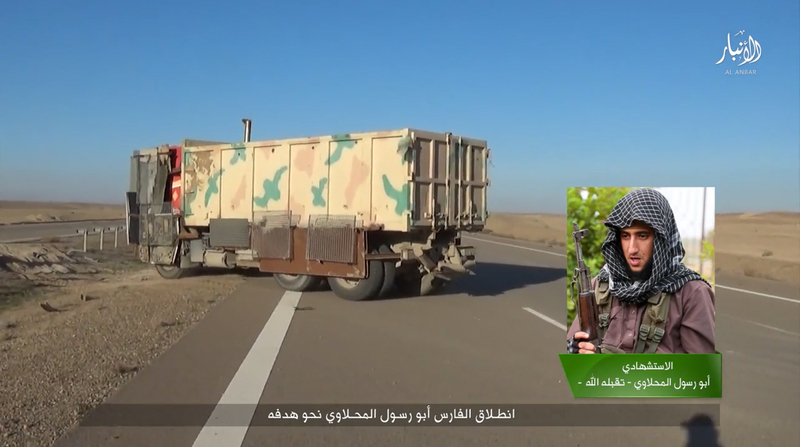 Seeing as it was captured in Salahuddin province, that would suggest that these ‘special’ SVBIEDs are mass-produced centrally in VBIED workshops in Ninawa province (most likely Mosul city) and then shipped out for use locally and in the surrounding provinces. Blurring the logo would be logical for operational security reasons. It makes sense that IS would have centralized VBIED workshops in Ninawa province. 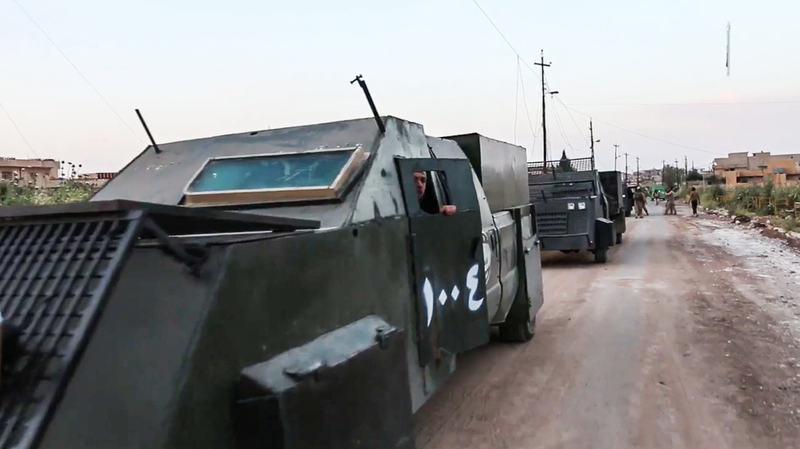 The infrastructure and resources that came with capturing Mosul has allowed IS to manufacture especially well-made improvised armor kits and armored vehicle modifications there. It’s also resulted in more standardized SVBIED designs, as well as the ability to supplement SVBIED operations in the surrounding provinces. July 11, 2015. Anbar province. July 11, 2015. Furat province. July 16, 2015. Anbar province. September 3, 2015. Fallujah province. December 8, 2015. Furat province. October 7, 2015. Anbar province. November 12, 2015. Aleppo province. December 8, 2015. Salahuddin province. February 29, 2016. Raqqah province. April 27, 2016. Salahuddin province. May 3, 2016. Salahuddin province. 65 (26,5%) of all SVBIEDs in the data set were some form of truck. I’ve included cargo trucks, dump trucks, flatbed trucks, as well as tanker trucks in this category so as to not dilute the article. 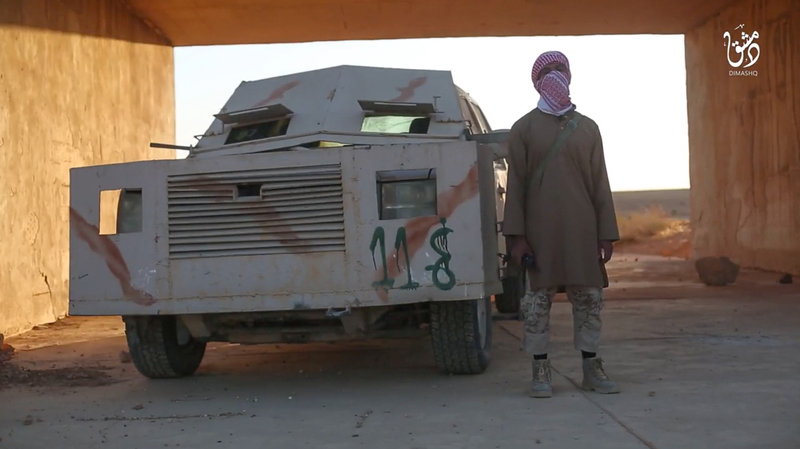 These up-armored SVBIEDs have no real uniformity in terms of design, apart from the improvised frontal armor. Some include a heavy use of slat armor, some of them have sloped frontal armor, and there’s even an example with sand bags in between the slat armor and steel plating in the front. 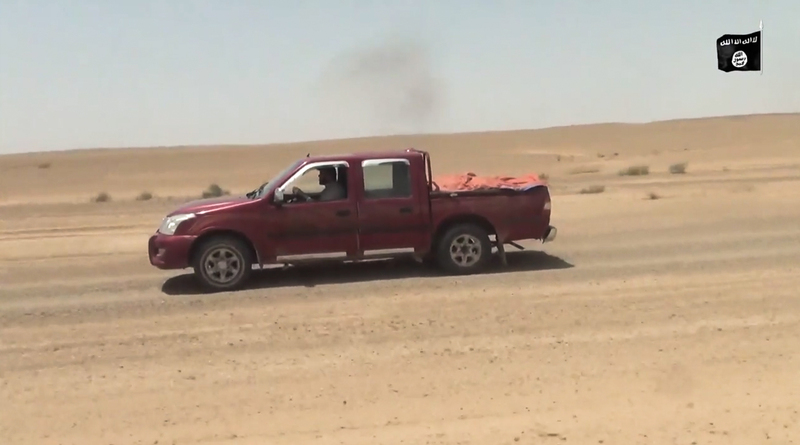 Truck-based SVBIEDs are naturally more powerful than your average 4×4 vehicle, seeing as they can carry a lot more explosives. 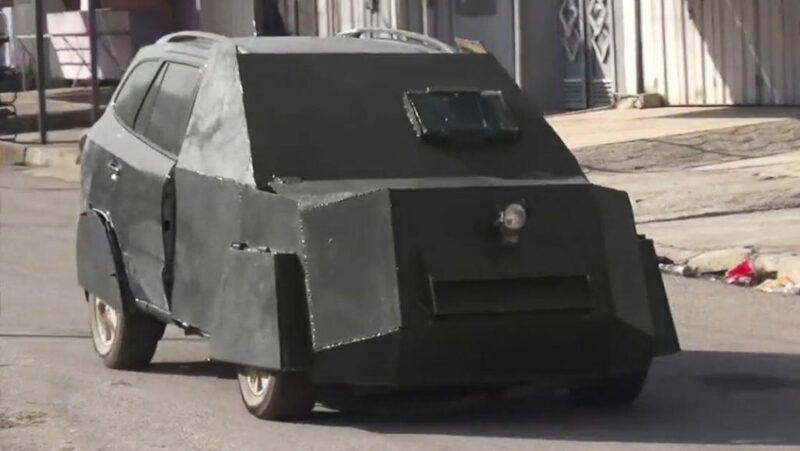 They’re bigger targets than a standard civilian vehicle, but the larger frame and improvised armor can also provide more protection against incoming enemy fire. 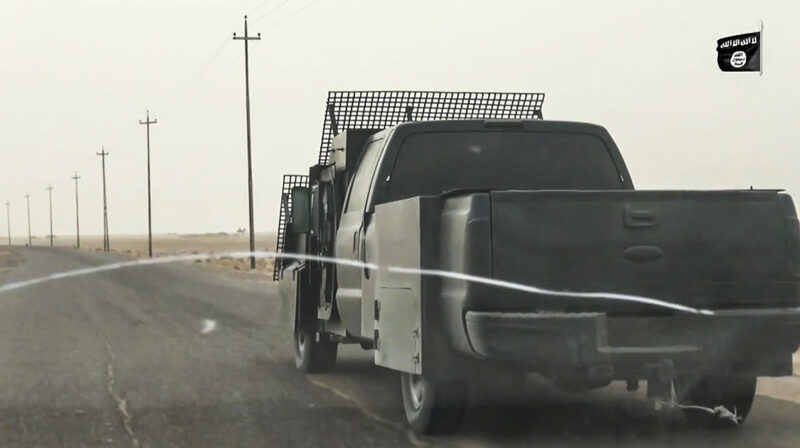 This type of SVBIED is usually reserved for use against high-value targets that require an above average quantity of explosives in order to neutralize. 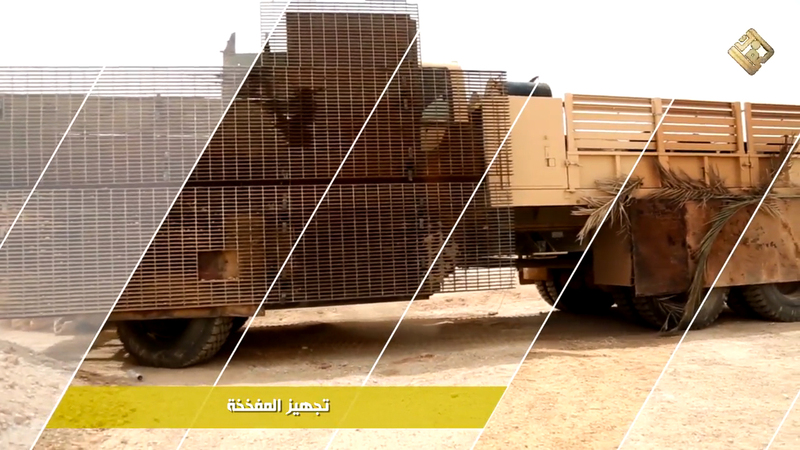 While they were featured in videos during this time period at a rate almost as high as standard 4×4 vehicles (65 and 84 respectively), this is probably more due to the fact that an up-armored SVBIED based on a heavy truck looks better on camera than a 4×4 vehicle. There’s no reason to believe truck-based SVBIEDs are being manufactured on a scale similar to 4×4 vehicles, as the latter is a much more resource-friendly construction. Outside of this data set and on the heavier end of the spectrum, IS have also overhauled and employed some ridiculously massive constructions, namely mining haul trucks. 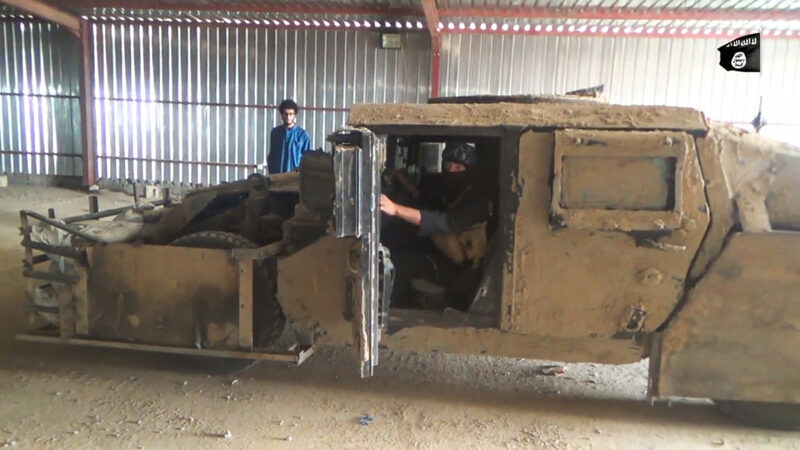 Haul truck SVBIED captured by Iraqi forces in a dugout in Anbar province (early 2017). 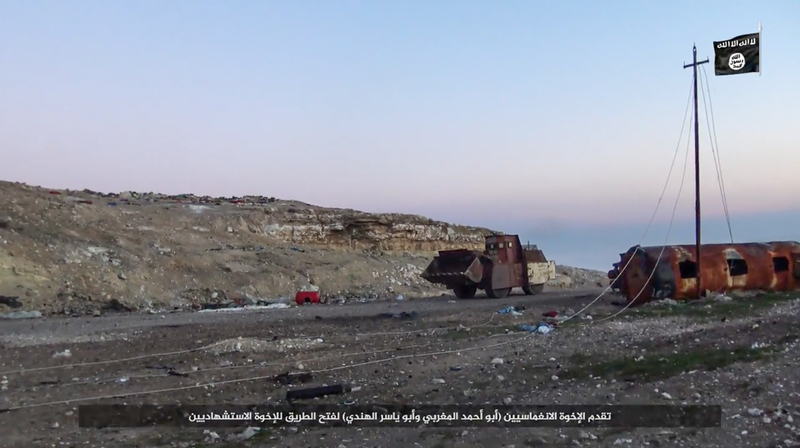 Haul truck SVBIED used against Syrian loyalists NE of desert town of al-Qaryatayn (Autumn 2015). While these monstrosities look quite intimidating, they are rarely used and aren’t the most efficient type of SVBIED. The slow speed and size of the vehicle means that its success relies mostly on the defenders not being able to prematurely detonate it, or escape their positions in time. The large payload it can carry also means that IS would have to fill it almost to the brink with ordnance in order to make using one worthwhile, as a larger truck is similarly also able to carry a multi-ton payload. June 4, 2016. Aleppo province. July 12, 2016. Aleppo province. July 15, 2016. Kirkuk province. August 7, 2016. Dijlah province. October 29, 2016. Ninawa province. November 4, 2016. Dijlah province. November 30, 2016. Jazirah province. December 10, 2016. Dimashq province. SUVs accounted for 38 (15,5%) of all up-armored SVBIEDs used during this time period. I have included jeeps and other civilian vehicles with four doors in this category. 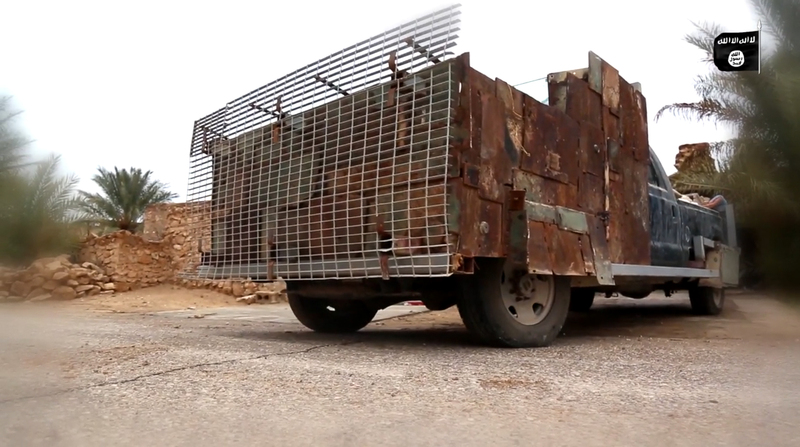 Traditionally speaking, SUVs have not been used as up-armored SVBIEDs to any great extent. There have been cases in Iraq as well as Syria throughout the years, but not any type of widespread usage. This changed dramatically in late 2016. 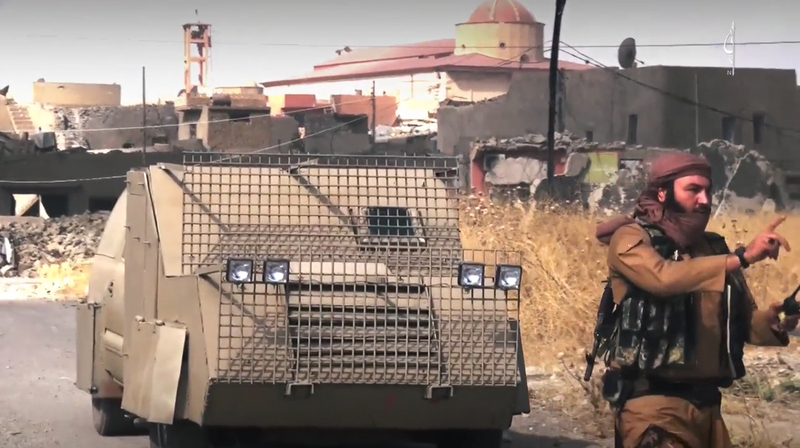 Since the inception of the ISF offensive aimed at retaking Mosul from IS, up-armored SVBIEDs based on SUVs have mainly been used. This is a peculiar phenomenon, seeing as they have been used not only in Mosul city in Ninawa province, but also in the adjacent IS provinces affected by the ISF offensive (Jazirah to the west and Dijlah to the southeast). 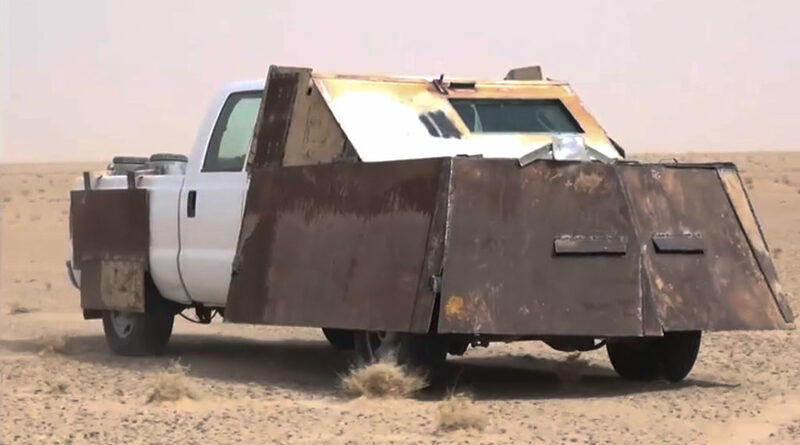 There is no real difference in terms of the improvised armor used on SUVs compared to 4×4 vehicles, with minimal differences between the two in terms of carrying capacity. 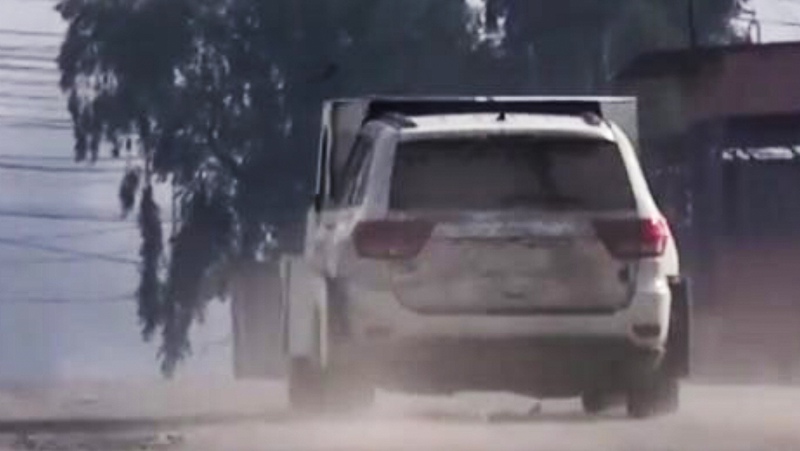 One reason for using SUVs as opposed to 4×4 vehicles could be that SUVs offer a contained space for the payload, but the stopping power of the “armor” on the car is next to non-existent. While the SUV-based up-armored SVBIEDs vary in design a bit, there are a few that look almost identical in design. The armor on these is on par with the armor used on the black and tan up-armored 4×4 SVBIEDs. 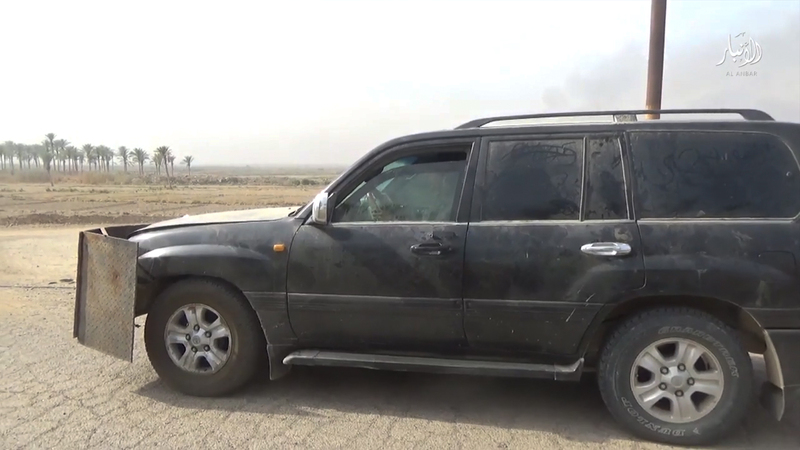 These ‘special’ SUVs were used exclusively in Ninawa, Dijlah, and Jazirah provinces – Overlapping the same areas where the ‘special’ 4×4 vehicles were used. This again suggests they were produced centrally in Ninawa and shipped out for use in the surrounding provinces. 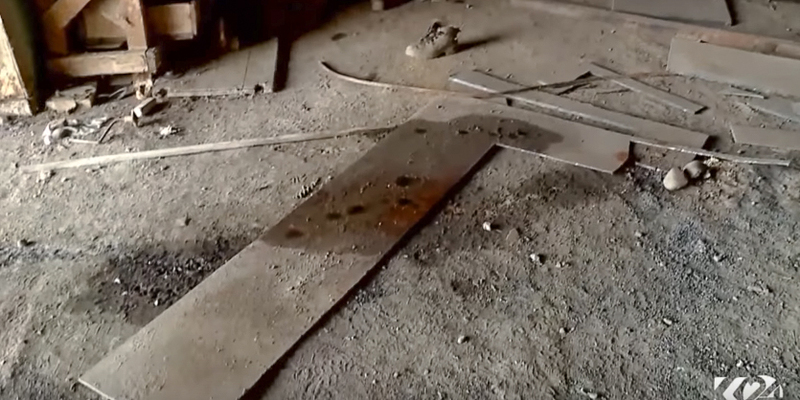 In one of the more recent IS video releases about the fighting in Mosul city, I spotted a curious phenomenon. 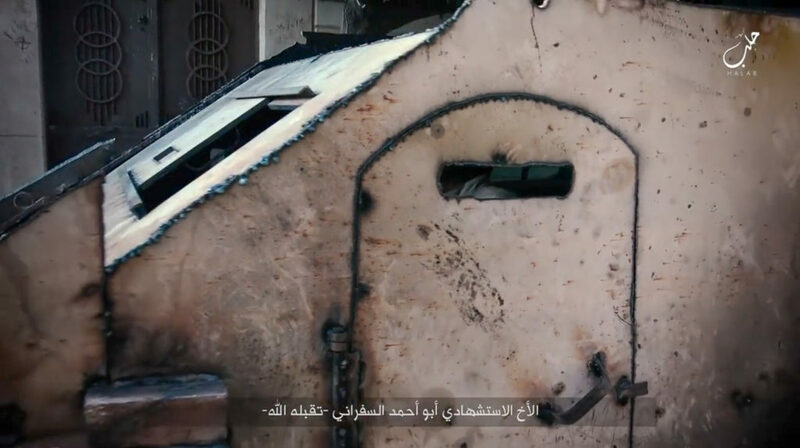 On some of the up-armored SVBIEDs based on SUVs, IS had mounted part of the payload on the inside of the driver and passenger doors. 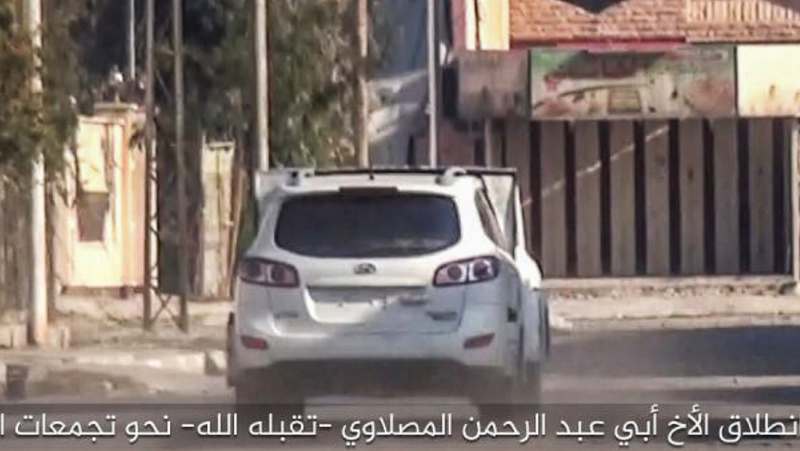 Figure 16: Door-mounted explosives on an SUV-based up-armored SVBIED in Mosul city. This may have been an attempt to either direct the explosive charge outwards to the sides, as well as utilizing all available space within the vehicle for an increased payload. 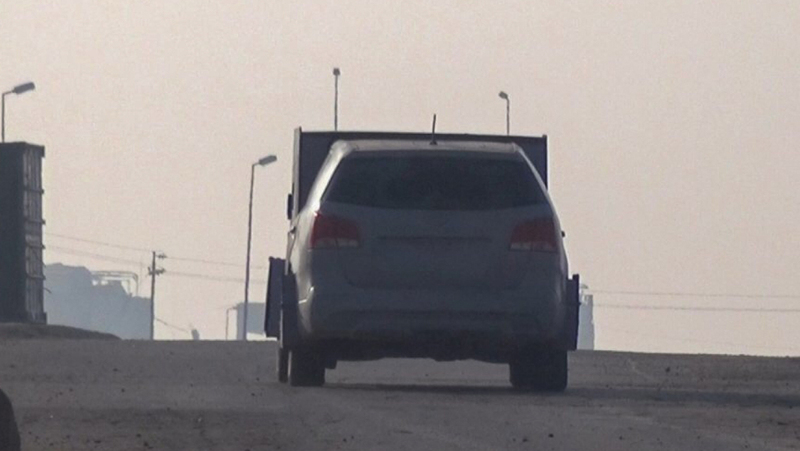 The design feature was spotted on at least two separate SVBIEDs, but it’s unclear whether its usage is widespread. August 24, 2015. Dimashq province. October 11, 2015. Diyala province. November 25, 2015. Dimashq province. January 21, 2016. Anbar province. May 5, 2016. Anbar province. Targeting enemy behind the lines: Most ‘covert’ SVBIEDs were used to target the enemy in areas where IS hold little to no territory. 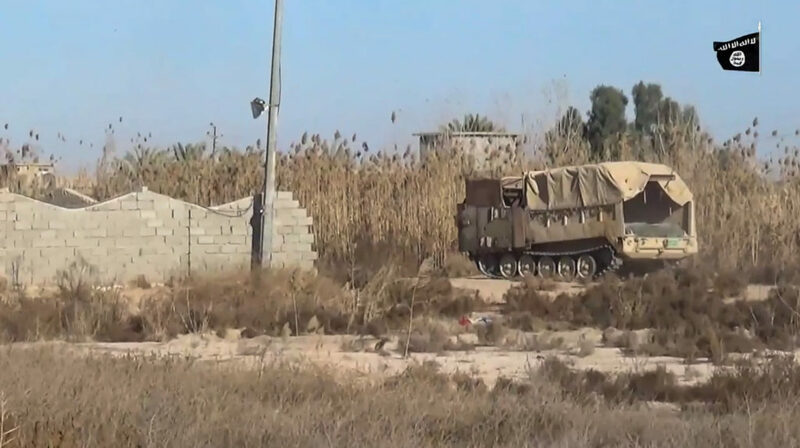 With no active frontline, ‘covert’ SVBIEDs are a necessity in order to be able to get close enough to the intended target without them discovering the SVBIED prematurely. 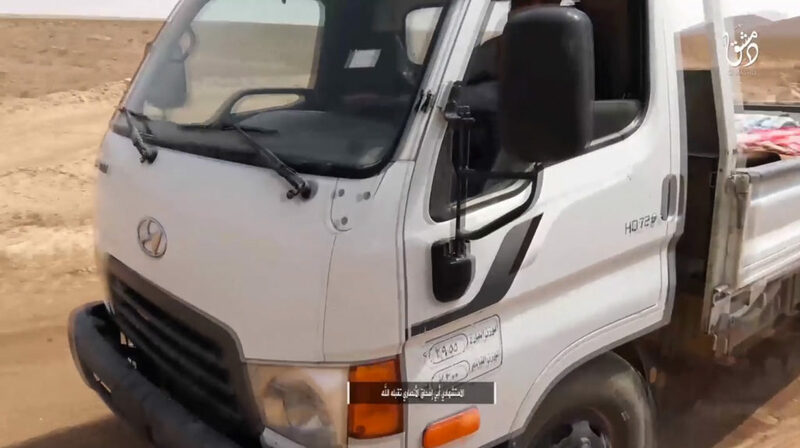 Initiating a surprise offensive: 3 of the ‘covert’ SVBIEDs featured were driven into the Syrian loyalist-held town of al-Qaryatayn on August 5, 2015, where they all detonated before IS fighters stormed the city. While this tactic is bound to cause civilian casualties, it’s an effective way of infiltrating enemy lines and causing havoc before a ground assault. 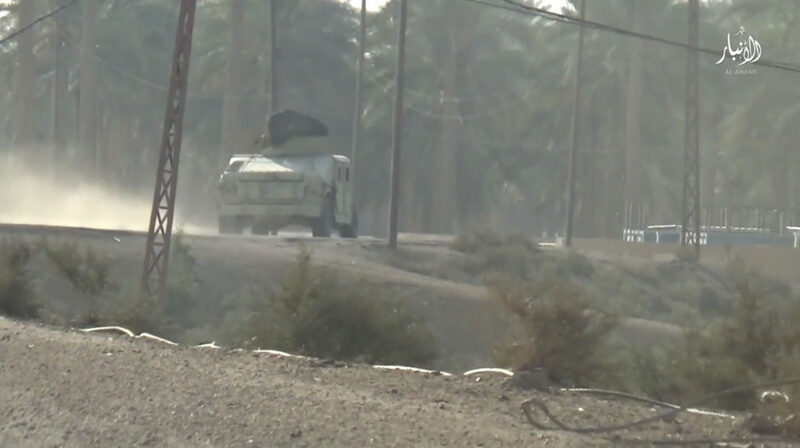 Figure 17: Remote-controlled VBIED. December 25th, 2015. Ninawa province. During this time period, there was only 1 (0,4%) remote-controlled VBIED featured. While there have been repeated alarms of IS increasing capabilities in regards to remote-controlled VBIEDs, there is no reason to believe that the threat level is substantial at all. 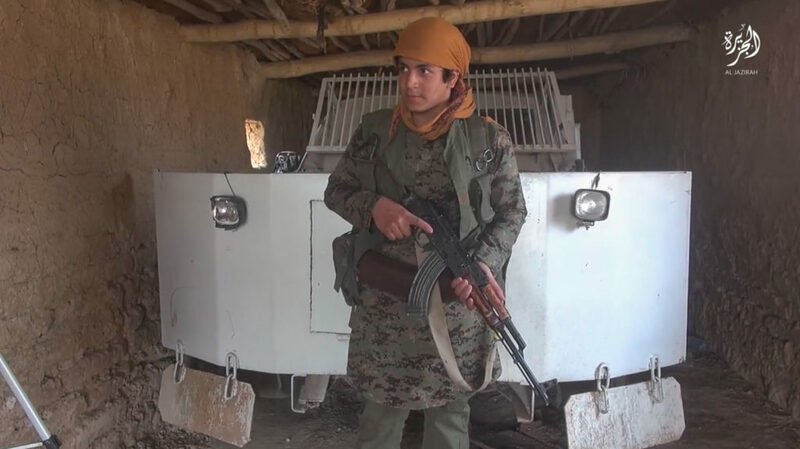 The technical requirements for manufacturing a remote-controlled VBIED (while not extremely difficult) means that it’s nowhere near efficient enough to mass-produce them. 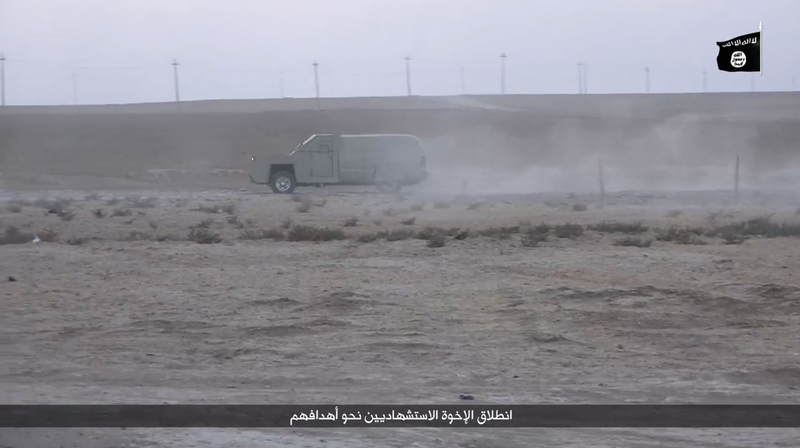 Driving a vehicle remotely also lowers both the accuracy and success rate of the VBIED compared to versions that include a suicide driver. There is no shortage of people willing to blow themselves up either, with some inside IS even complaining about ‘nepotistic waiting lists’ for SVBIED operations. In this subcategory there were two types of vehicles retrofitted as SVBIEDs: HMMWVs and M113 variants. October 7, 2015. Furat province. October 24, 2015. Anbar province. December 3, 2015. Fallujah province. February 9, 2016. North Baghdad province. April 11, 2016. Jazirah province. The HMMWV (High Mobility Multipurpose Wheeled Vehicle) is a four-wheel drive military light truck, operated by the Iraqi Army. During this time period it was used 17 (6,9%) times as an SVBIED, and in all but one of the cases (94% of the time) in Iraq. When IS captures military vehicles, they’re almost exclusively used locally in the areas where they were captured in. 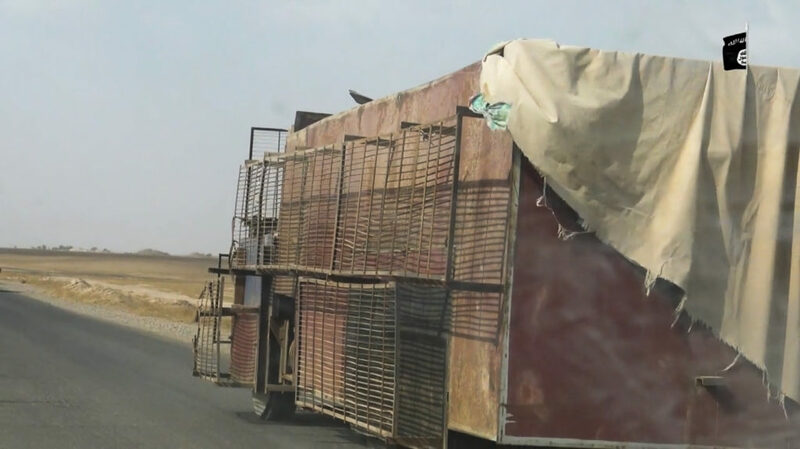 Transporting them across wide stretches of desert between Syrian and Iraqi provinces is not tenable as it would subject them to an increased risk of being targeted in an airstrike. 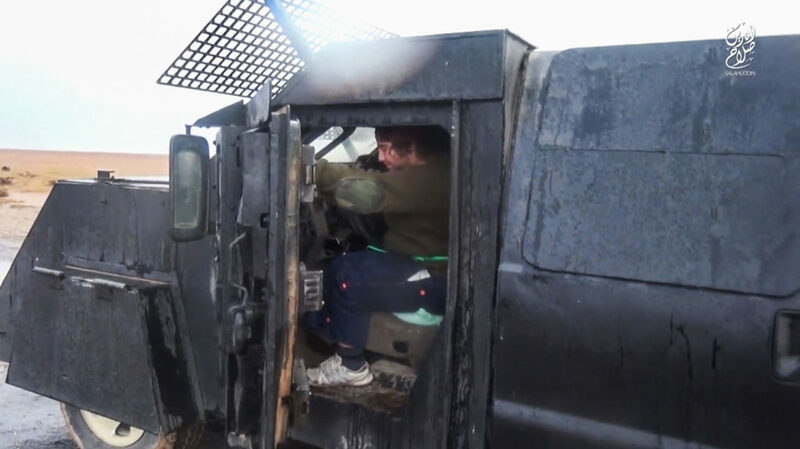 Some of the vehicles have received improvised armor plating to reinforce the light armor built in to the vehicle. M113A2. September 14, 2015. Anbar province. M1064A3. October 27, 2015. Salahuddin province. M113A3. December 6, 2015. Anbar province. M548. January 2, 2016. Anbar province. The M113 is a tracked armored personnel carrier, also operated by the Iraqi Army. Variants of it were featured 10 (4,1%) times in the data set. All of them were used in Iraqi provinces, for the same reason as the HMMWV. Most were M113A3s or M113A2s, but there was also an M1064A3 mortar carrier variant and an up-armored M548 cargo carrier variant featured. The vehicles have a light built in armor, and some of them were fitted with improvised armor plating as well as slat armor. 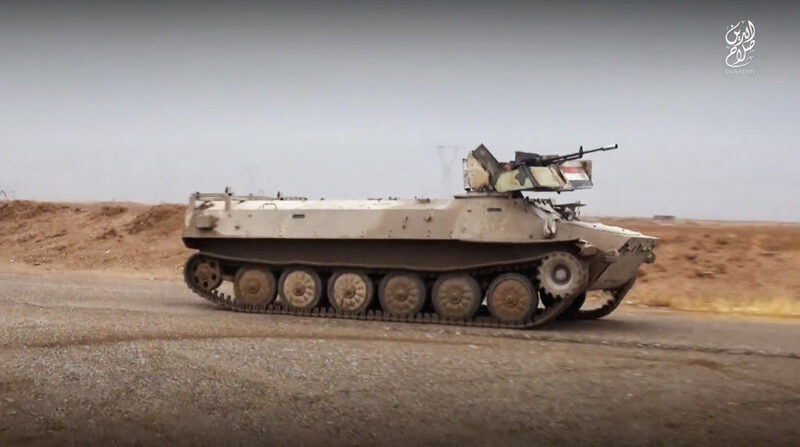 In this subcategory there were two types of vehicles retrofitted as SVBIEDs: Various types of armored personnel carriers, and main battle tanks. BTR-80UP. October 7, 2015. Anbar. BMP-1. November 4, 2015. Deir ez-Zor. BTR-50. November 4, 2015. 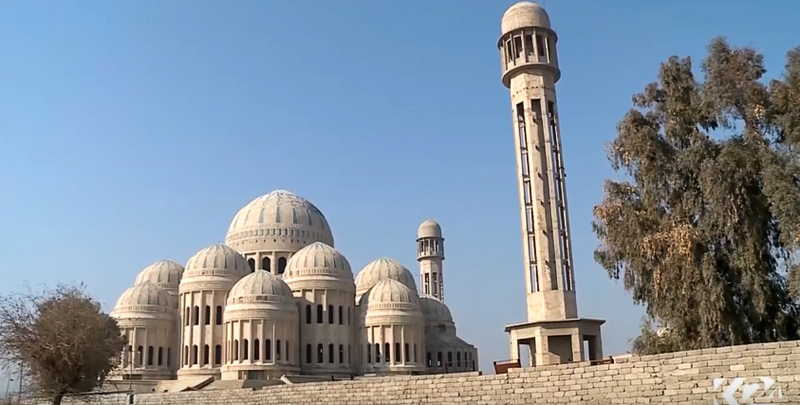 Deir ez-Zor. MT-LB. December 25, 2015. Ninawa. BMP-1. January 4, 2016. Dimashq. BMP-1. July 4, 2016. Homs. BMP-1. July 18, 2016. Dimashq. BMP-1. October 12, 2016. Deir ez-Zor. BMP-1. December 23, 2016. Aleppo. 12 (4,9%) of all SVBIEDs featured in the data set were some form of Russian-made armored personnel carrier. In line with the American-made military vehicles, the Russian-made ones were also used locally. Out of the 12 used, 9 (75%) were used in Syrian provinces while 3 (25%) were used in Iraqi provinces. This also makes sense, seeing as both the Syrian and Iraqi armies operate Russian military vehicles, although the Iraqis only to a lesser extent. 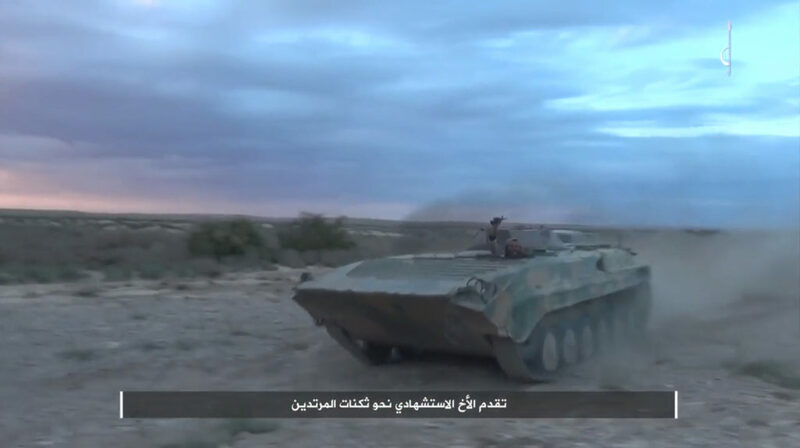 The vehicles used included the BMP-1 (9), an MT-LB auxiliary armored tracked vehicle, a BTR-50, as well as a BTR-80UP amphibious armored personnel carrier. While most were used without the addition of improvised armor, some were fitted with armor plating, as well as slat armor. These vehicles were mostly used to hit well-defended targets. For example, 3 of them were used in Deir ez-Zor, a besieged loyalist enclave in the Syrian desert that has proven particularly difficult to overrun. 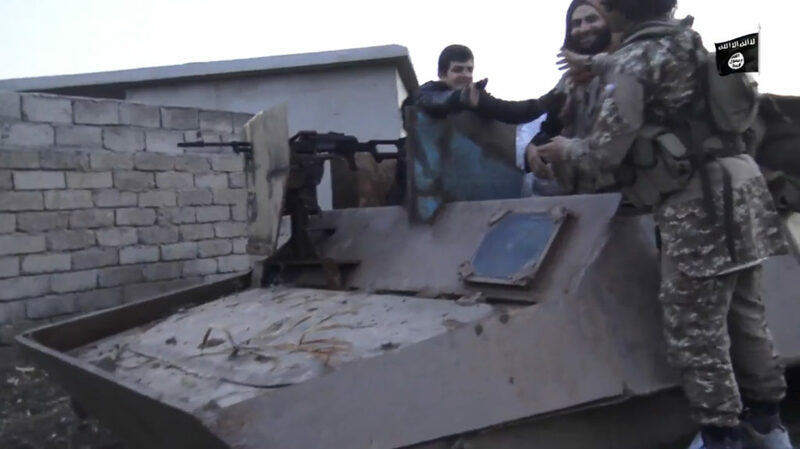 Figure 18: BMP-1 based SVBIED used in Northern Aleppo on a Turkish/FSA position. One of the SVBIEDs in this category was also pictured in an photo report from early December, 2016. 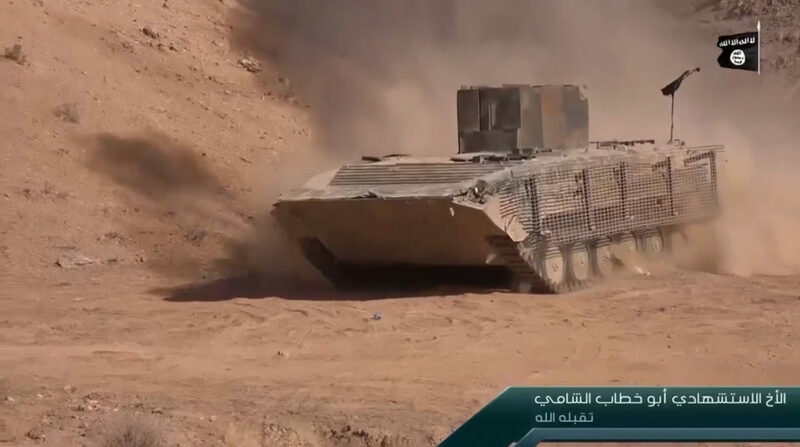 The fact that the vehicle was used in the northern Aleppo countryside is interesting, as the logo on the BMP-1 is a standard mark on any vehicle overhauled by the IS armor workshop in Raqqah. 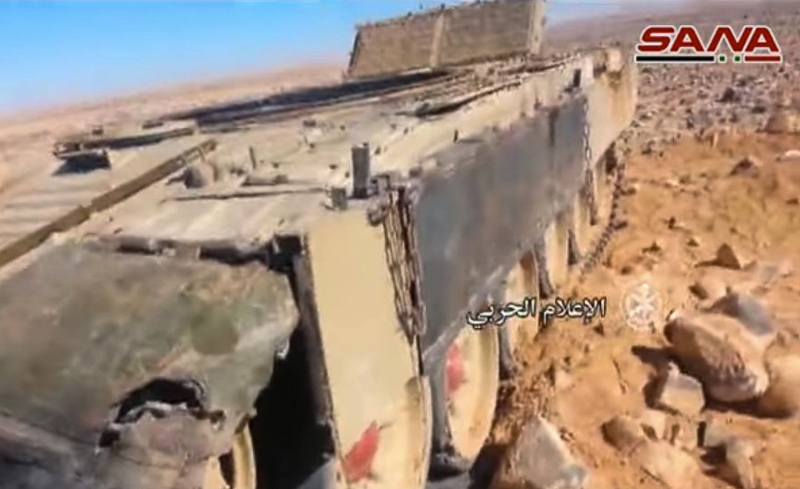 A series of BMP-1 armored personnel carries turned into SVBIEDs bear this mark, this one numbered as ‘225’. On February 12, 2017, another example of this type of SVBIED was used. 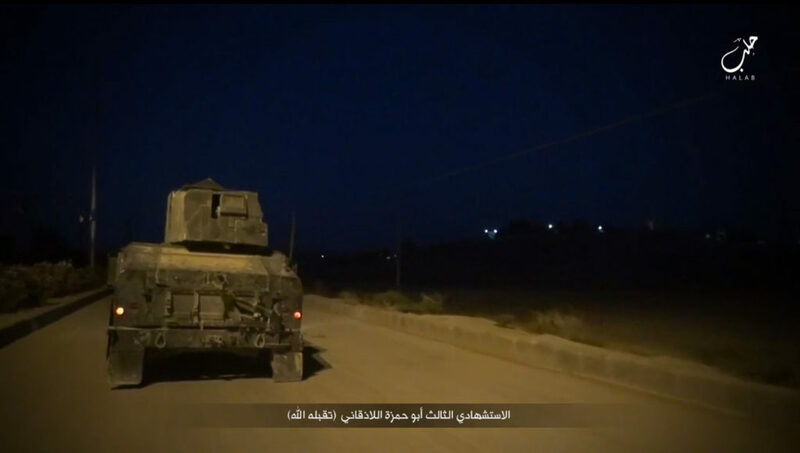 As part of their continuing defensive operations in the northern Aleppo countryside around al-Bab, an IS SVBIED based on a BMP-1 was used against a Turkish/FSA position near the town of ‘Bzaah’. This one was numbered as ‘235’. Figure 19: Another BMP-1 based SVBIED, used against a Turkish/FSA position near Bzaah, northern Aleppo countryside. 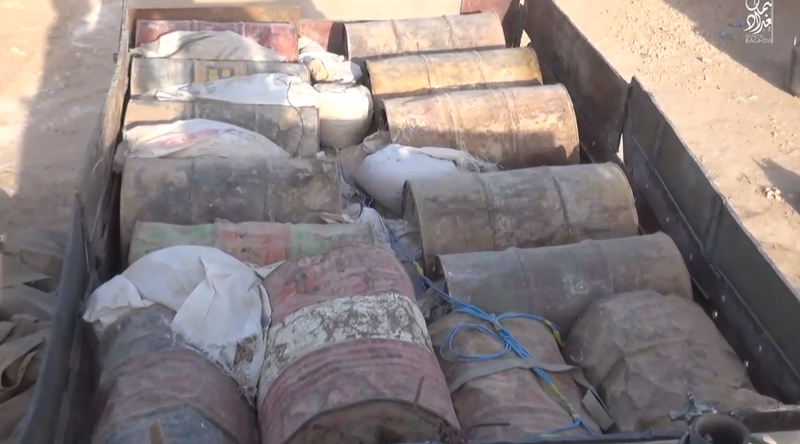 Just as in northern Iraq, this could be a sign of centralized manufacturing of VBIEDs in a population center (Raqqah) where resources and capabilities are more in abundance than in the surrounding provinces. 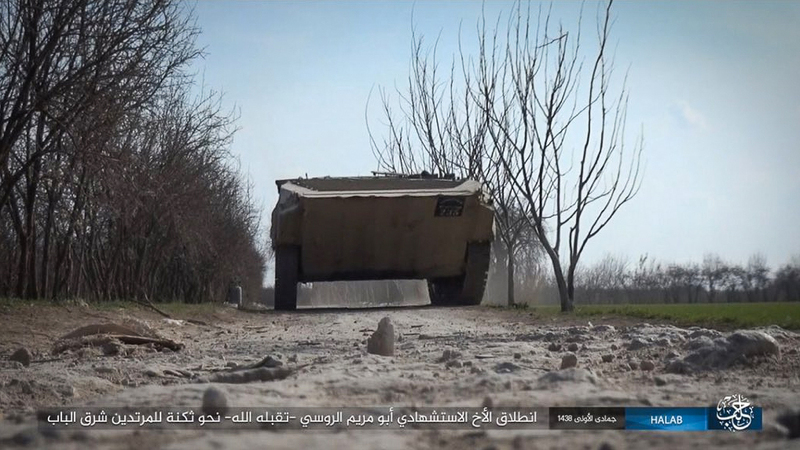 The continuing usage of ‘Raqqah-made’ BMP-1 SVBIEDs in northern Aleppo is a good indication of this fact. While BMP-1s were only featured 9 times in this data set, they are used a tad more frequently in actuality. Most of the BMP-1s turned into SVBIEDs had the turrets removed. It’d be a waste to keep them in place unless you had someone manning it at the same as the SVBIED was employed. After being removed from the BMP-1 hull, these turrets are normally fitted on the back of a 4×4 vehicle, producing a heavier variant of the well-known technical. T-55. September 20, 2015. Deir ez-Zor province. T-55. January 13, 2016. Deir ez-Zor province. Main battle tanks (MBTs) were used very sparsely, with only 2 (0,8%) featured in the entire data set. The reason for this is that MBTs are far more important on the battlefield in their original roles than when used as an SVBIED. In both cases the turrets were removed, either because of damage or wanting to salvage a piece of working military equipment for later use. Doing so also lowers the profile of the vehicles. 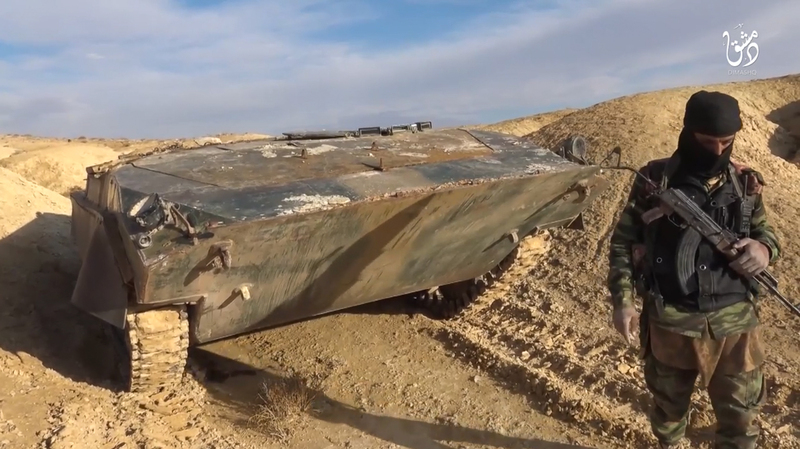 Both were used in Syria (Deir ez-Zor) and were of the T-55 variety. 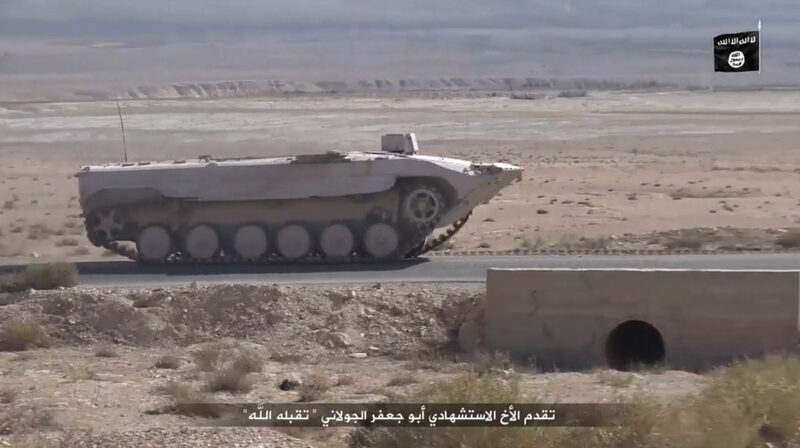 The first ever SVBIED based on a T-72 tank was employed by IS near al-Seen airbase in southern Syria in early February 2017, but failed to detonate its payload. It too had its turret removed. 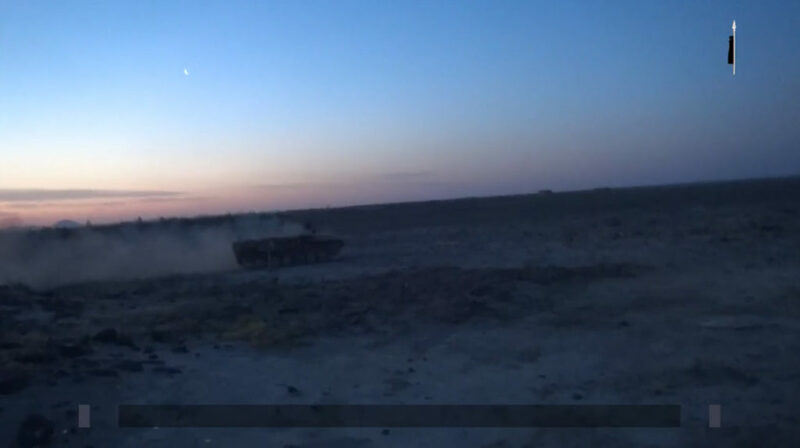 Figure 20: T-72 based SVBIED used by IS near al-Seen airbase in southern Syria. 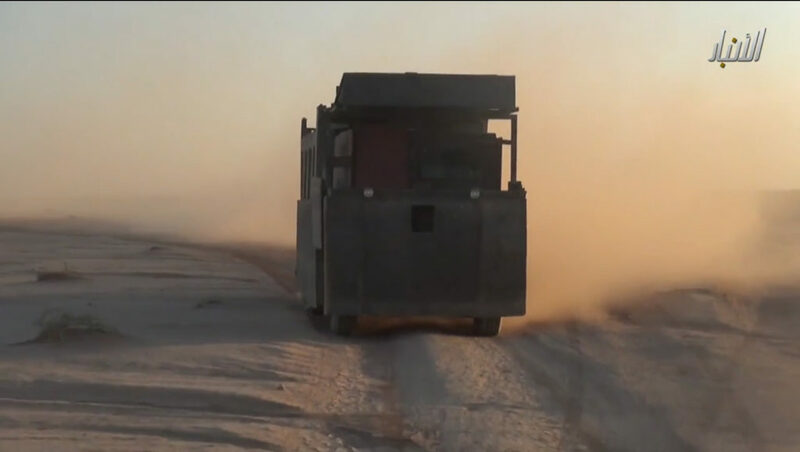 Heavy construction vehicles used as SVBIEDs were featured only 4 (1,6%) times. Half of them were used in Syrian provinces and the other half in Iraqi provinces. They were an equal mix of up-armored bulldozers and front-end loaders. 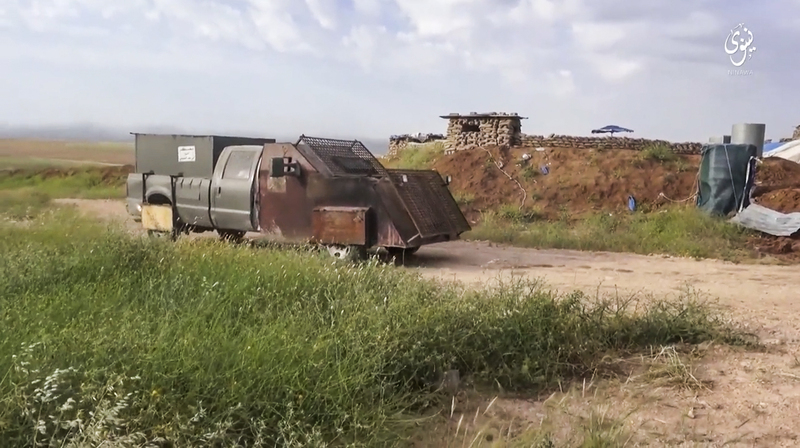 The primary function these vehicles have on the battlefield compared to any other type of SVBIED is their ability to remove roadblocks in the form of either concrete blast barriers or dirt berms. It’s important to note that most of the time up-armored heavy construction vehicles that haven’t been converted into SVBIEDs are used for this purpose and then pulled back before an up-armored SVBIED is sent in. The conversion of heavy construction vehicles into heavily armored SVBIEDs allows them to break through complex enemy fortifications and subsequently detonate a sizable payload on target without having to withdraw and wait for the actual SVBIED to arrive. 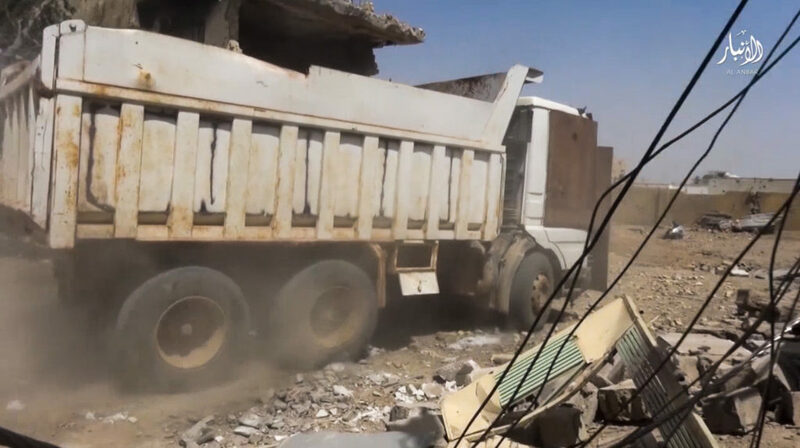 I have mentioned it earlier in the article, but the usage of heavy construction vehicles as SVBIEDs is an incredibly powerful tool used to clear the way and strike the enemy where a normal up-armored SVBIED wouldn’t be able to. Most of the time, this type of vehicle is used in an urban environment. One of the newer and more interesting phenomenon in regards to SVBIED usage is the emergence of 2-man SVBIEDs (or ‘dual operations’). 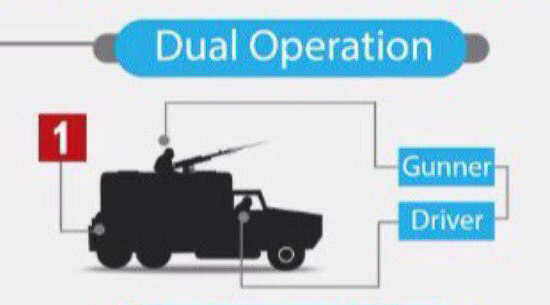 Figure 21: Excerpt from an Amaq infographic, illustrating a ‘dual operation’. 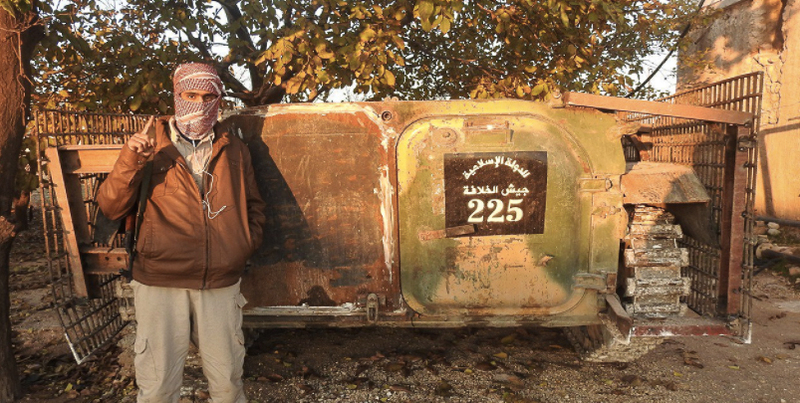 These up-armored SVBIEDs are special in that they include a driver as well as a gunner on top of the vehicle. 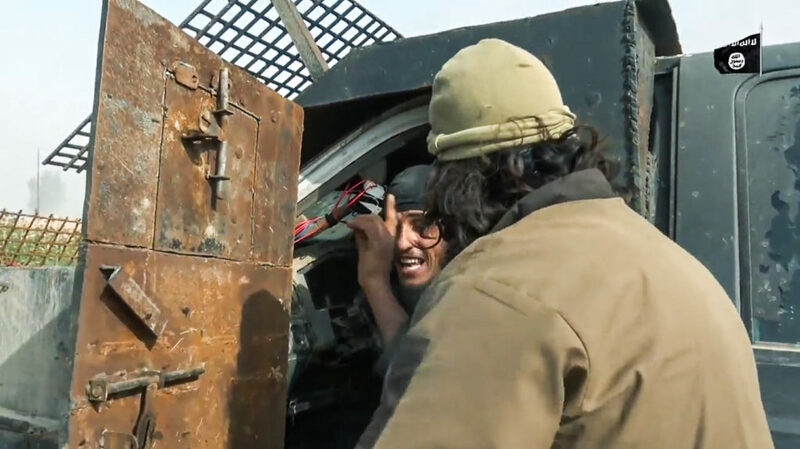 The addition of a gunner is meant to increase the survivability of the SVBIED up until the desired point of detonation, with the gunner suppressing the enemy using his machine gun. This type was used exclusively in Iraqi provinces, the scene of the majority of intense fighting during the last 18 months. BMP-1. November 23, 2015. Salahuddin province. MT-LB. December 25, 2015. Ninawa province. M113A2. January 2, 2016. Anbar province. M113 variant. March 24, 2016. Anbar province. SUV. April 5, 2016. Anbar province. Truck. September 11, 2016. Furat province. HMMWV. December 20, 2016. Dijlah province. Out of all the 245 SVBIEDs analyzed in this data set, 7 (2,9%) were 2-man SVBIEDs. Out of the 815 claimed SVBIEDs by IS in 2016, 18 (2,2%) were dual operations. This is approximately the same as the number of 2-man SVBIEDs featured in the data set, percentage-wise. A variety of different vehicles were used in dual operations, but most commonly military vehicles. The vehicles featured included an up-armored SUV, an up-armored heavy truck, an MT-LB with frontal armor, a HMMWV, two M113 variants, as well as a BMP-1 armored personnel carrier. 2-man SVBIEDs are used very sparsely, but when used they are employed against targets that are considered especially difficult. 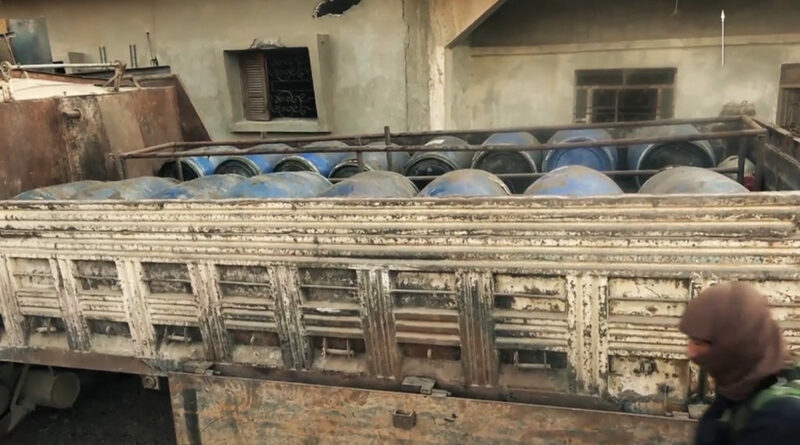 The massive amount of SVBIEDs used by IS against the ISF has allowed the ISF to learn and improve techniques in regards to how to deal with the SVBIED threat under the new battlefield conditions. The addition of a gunner on 2-man SVBIEDs is meant to negate that effect and allow the driver to choose the optimal point of detonation himself. The fact that dual operations are being used at all is not necessarily an indication that IS fighting force hasn’t diminished, because it has. However, there will always be more than enough people willing to take the easy route to ‘jannah’ (heaven) by embarking on an SVBIED operation. The importance of SVBIEDs for IS military capabilities means that dedicating 2 fighters to a single SVBIED when it increases the likelihood of it succeeding isn’t a substantial loss of manpower. 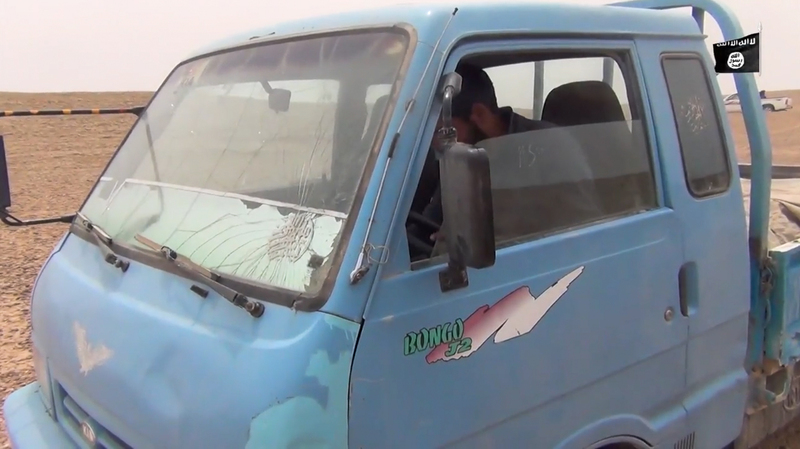 Another interesting phenomenon is that IS have been using handicapped fighters as SVBIED drivers. 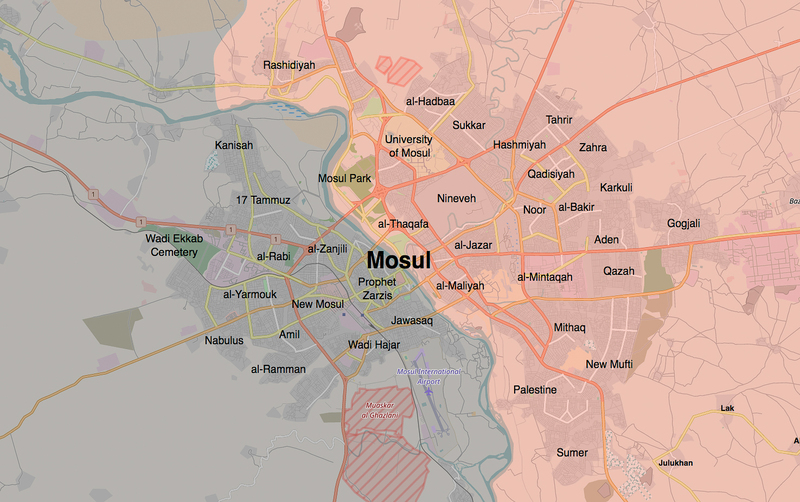 I noticed 3 cases in the data set, and decided to include a fourth from the battle of Mosul. Half of the handicapped drivers were using crutches to walk, while the other two were paraplegic and wheelchair-bound. 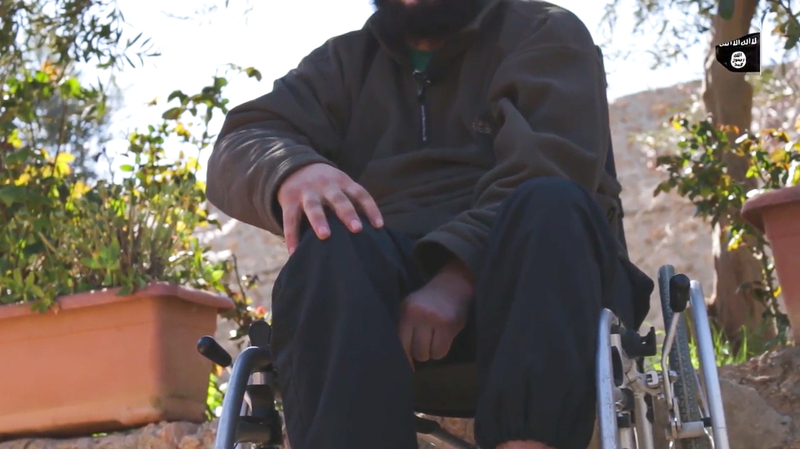 The driver from Mosul had even lost his legs in combat. 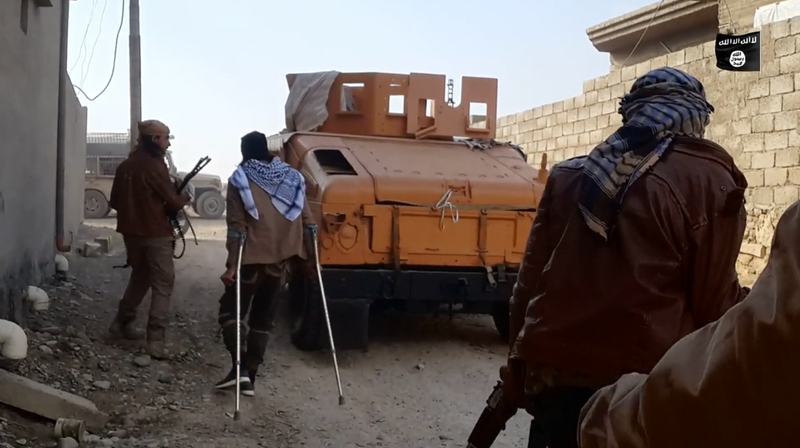 Most of them were probably able to carry out the attacks without any modifications to the standard design of an up-armored SVBIED, but the driver with no legs must’ve received a pretty heavily modified vehicle in order to allow him to drive it himself. Alternatively it could have been remotely driven, but that’s unlikely. If one were to modify a vehicle to allow it to be driven without the use of ones legs it’d make more sense to give the controls to the driver who has a better look at when the optimal detonation point is, compared to someone driving it remotely. There is no reason to believe they were being forced into conducting a suicide attack, as doing so requires signing up on a waiting list. 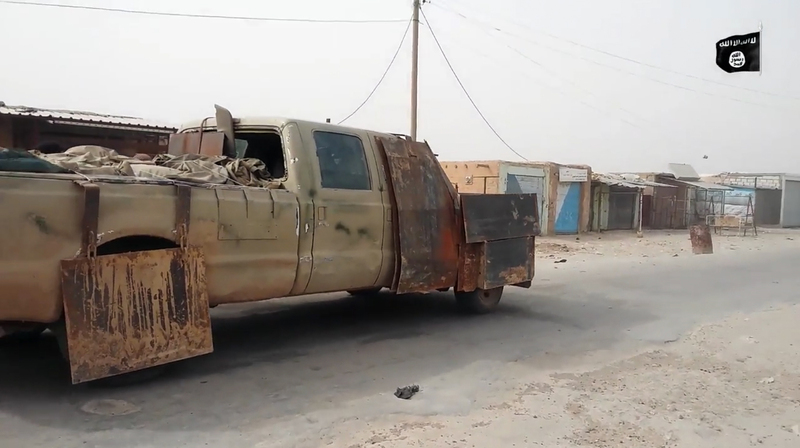 Throughout the data set, civilian vehicles were featured the most frequently, with 200 out of 245 VBIEDs being of this type. Whether up-armored 4×4 vehicles or heavy trucks, they’re simple designs that work great. The prominent use of nearly identical ‘special’ types of both 4×4 vehicles and SUVs in Northern Iraqi provinces indicate the existence of VBIED workshops that manufacture these centrally in Ninawa (Mosul) and later ship them out for usage locally as well as in the surrounding provinces. 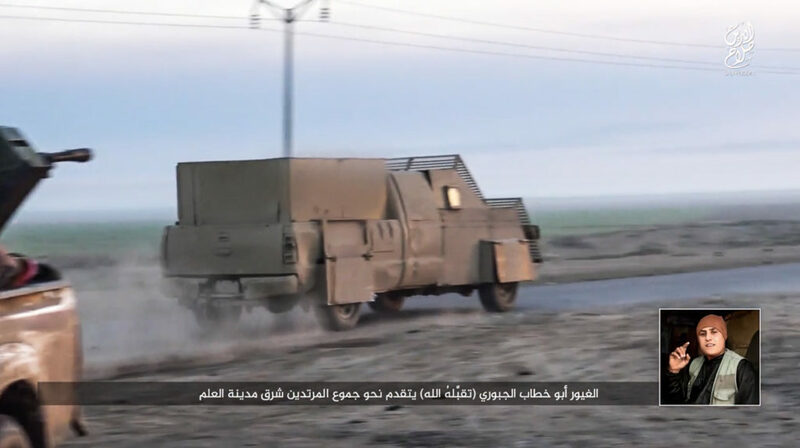 ‘Covert’ SVBIEDs were featured 12 times, but consistently followed the rule of only being used in areas with little territorial control and (rarely) as a surprise attack before a ground assault. 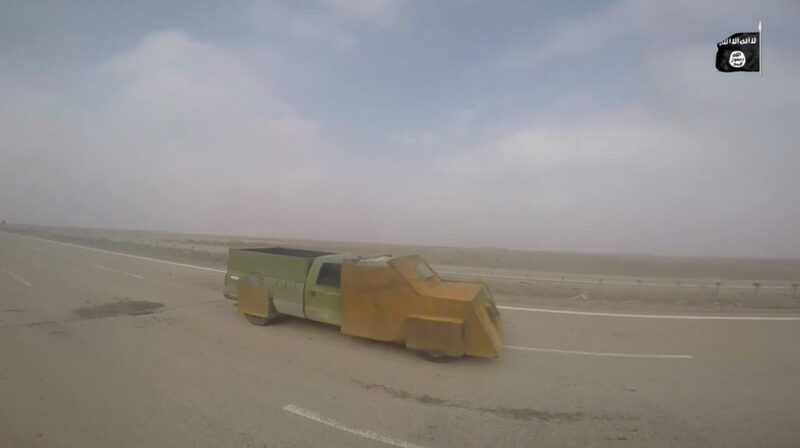 While there was one example of a remote-controlled VBIED, there is no widespread usage and it doesn’t work remotely as well as versions that include a driver. 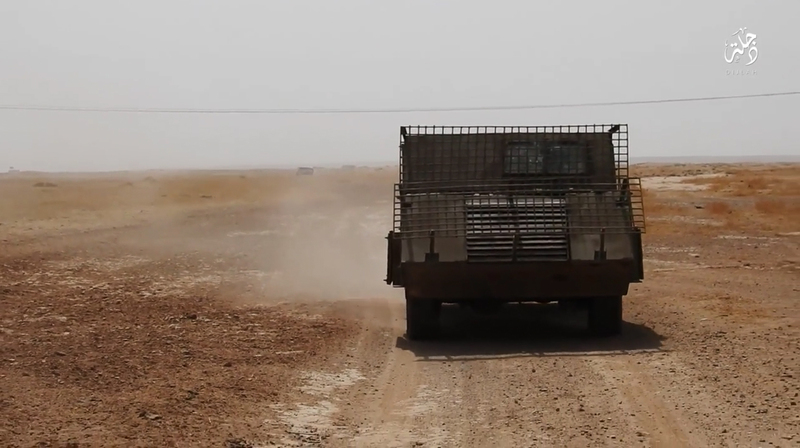 Captured military vehicles are used as SVBIEDs primarily in a local role with little movement across the Syrian-Iraqi border. American-made vehicles are used mostly in Iraqi provinces, while Russian-made vehicles are used mostly in Syrian provinces. 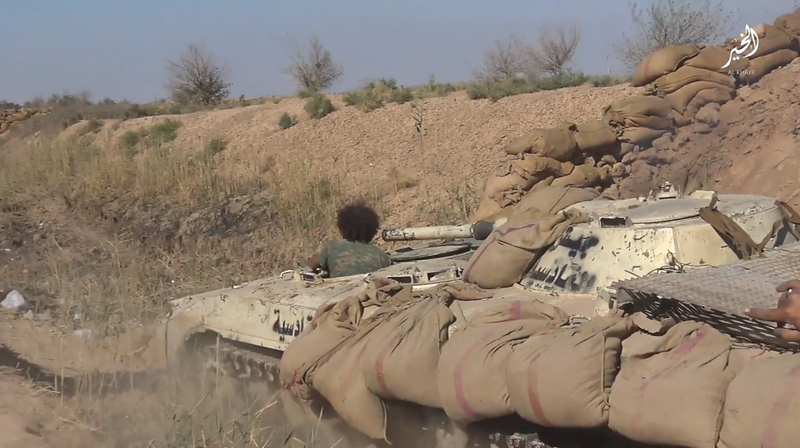 Main battle tanks were featured only 2 times, mainly because they serve a much more important function in their original role than as SVBIEDs. 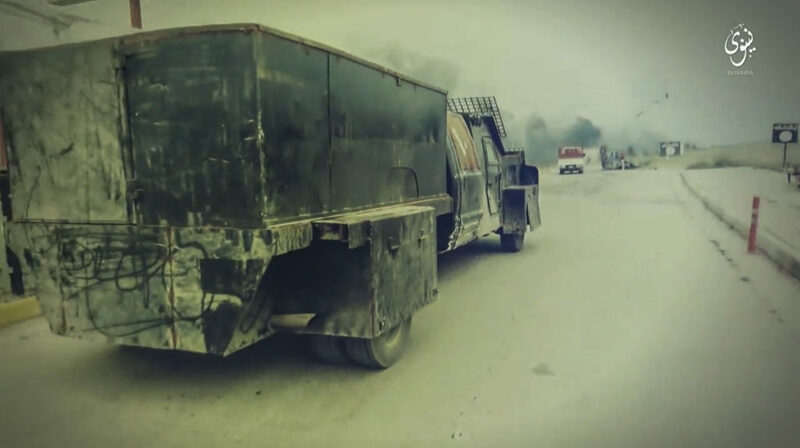 Heavy construction vehicles are used to remove roadblocks in the form of concrete blast barriers or dirt berms and can clear the way for follow-up SVBIEDs as well as strike a target where a normal up-armored SVBIED wouldn’t be able to. The usage of up-armored BMP-1 SVBIEDs in Northern Aleppo that were overhauled in Raqqah is also an indication of the same type of centralized VBIED manufacturing in Syria that can be seen in Northern Iraq. 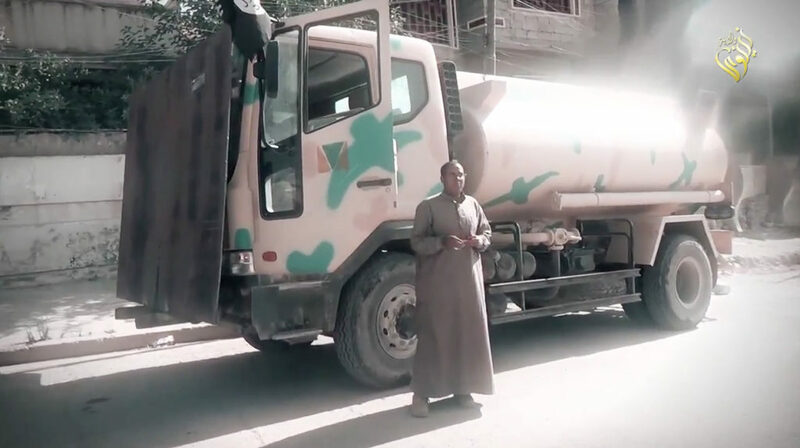 IS resource availability and manufacturing capabilities naturally gravitate towards larger urban population centers under its control, allowing VBIED workshops in its largest cities in Syria (Raqqah) and Iraq (Mosul) to supplement SVBIED operations in surrounding provinces. The emergence of 2-man SVBIEDs (or ‘dual operations’) in Iraq with a driver and a gunner is an indication of improved ISF defences against SVBIEDs and the new techniques IS are using to try to negate that. With the ISF receiving more and more training as well as experience, dual operations are bound to continue. The Iraqi military operation aimed at re-capturing Mosul begun on October 16, 2016. The ISF have now completely captured the eastern side of the city, and a pause in large-scale fighting has been established until the offensive to take the western part is initiated. In this section I will analyze IS tactical usage of SVBIEDs in Mosul city so far. Figure 22: Territorial control in Mosul city as of January 25, 2017. Red = ISF, Black = IS. 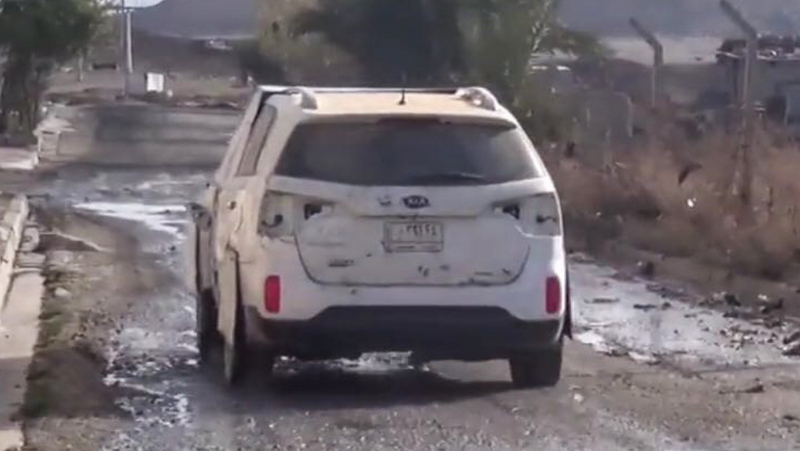 Most of the SUVs converted into SVBIEDs have been white Kias of similar models, as if IS had seized all the vehicles in a car dealership within the city. 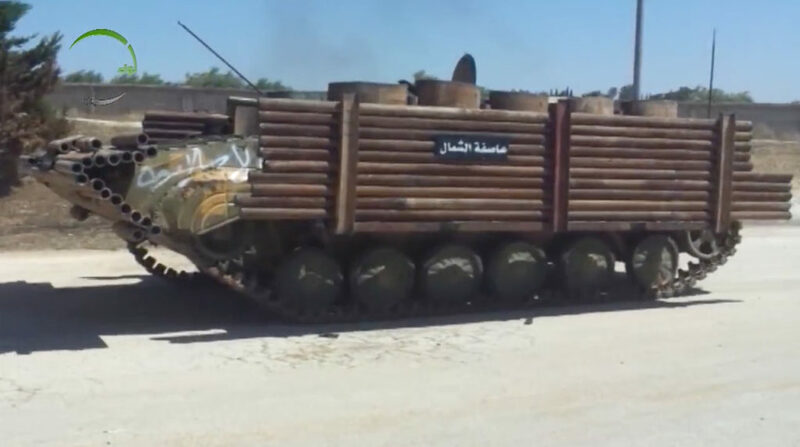 The improvised armor on these SVBIEDs has also been fairly consistent, indicating mass-production. 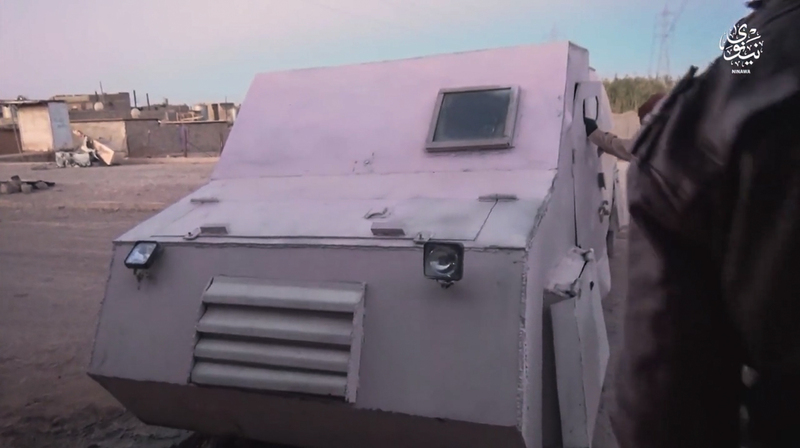 Seeing as Mosul itself has been home to the largest VBIED workshops in Iraq, these were most likely manufactured locally. Most of the time the added armor is painted in the same color as the vehicle, disregarding the sometimes counterintuitive colors like blue and red. This may have been attempts at fooling ISF contingents into believing the vehicle wasn’t an SVBIED, although it’s unclear how successful it may have been. 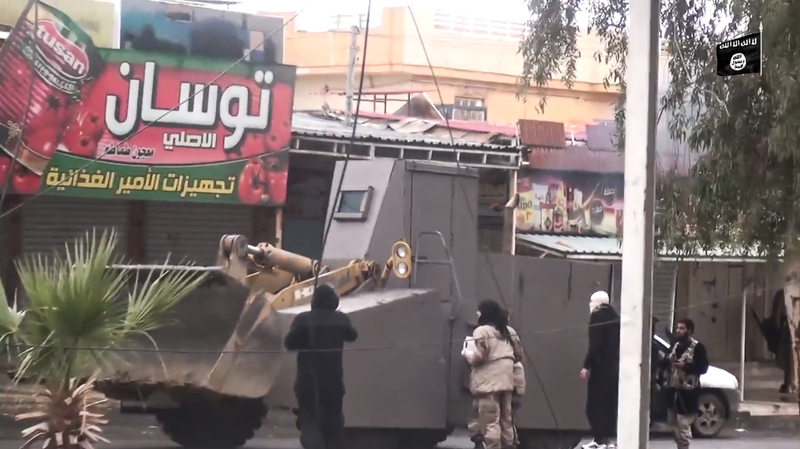 SVBIEDs have always been the most dangerous threat faced by the ISF, but the threat has been amplified by tough street fighting in dense neighborhoods in Mosul. 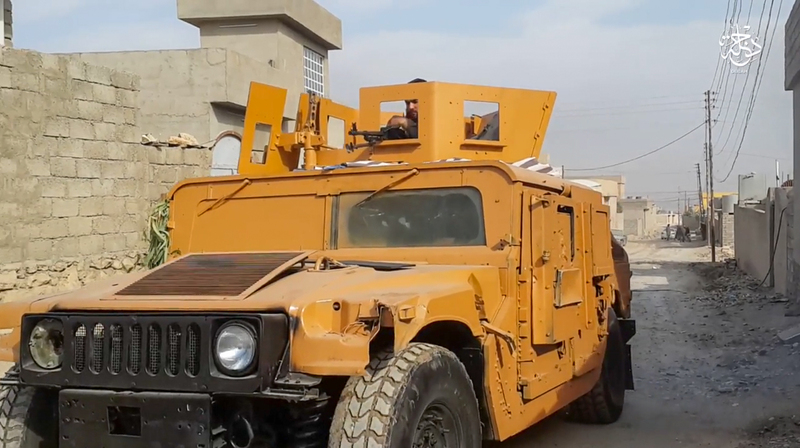 Large-scale urban fighting typically favors an irregular defending force the likes of IS, and makes it difficult for the attacking force (ISF) to defend against SVBIED attacks. When fighting in open areas (e.g. the Nineveh plains), it’s relatively “easy” to defend against SVBIED attacks. 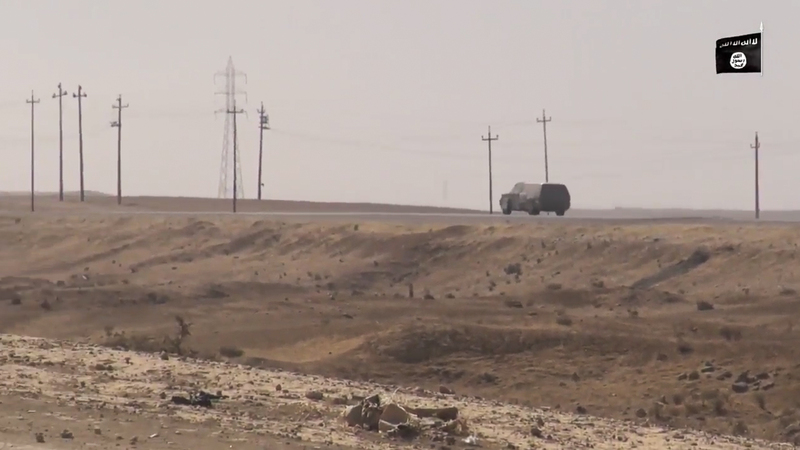 The SVBIEDs often have to drive across open areas that don’t offer any cover, and that gives the ISF time to fire at it in the hopes of achieving a premature detonation. In Mosul, Iraqi forces are a lot more vulnerable and have continuously been caught by surprise in devastating attacks. SVBIEDs often appear out of nowhere from around a corner that was ‘cleared’ just minutes before. ISF contingents are often only given a clear line of sight down a single street, and the sprawling networks of intersecting roads has made it difficult for the ISF to maintain a coherent perimeter defense. 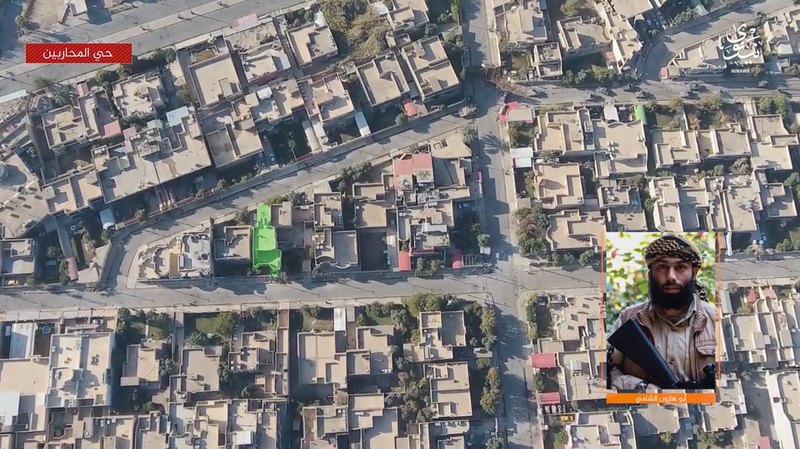 IS has also made extensive use of commercial quad-copter drones in Mosul. In addition to conducting reconnaissance, IS have started using them to guide SVBIEDs to the target in real time. Using drones, they are able to give instructions by radio and follow the suicide driver’s progress on live video feed. Drone footage used to be a semi-rare feature in IS video releases. 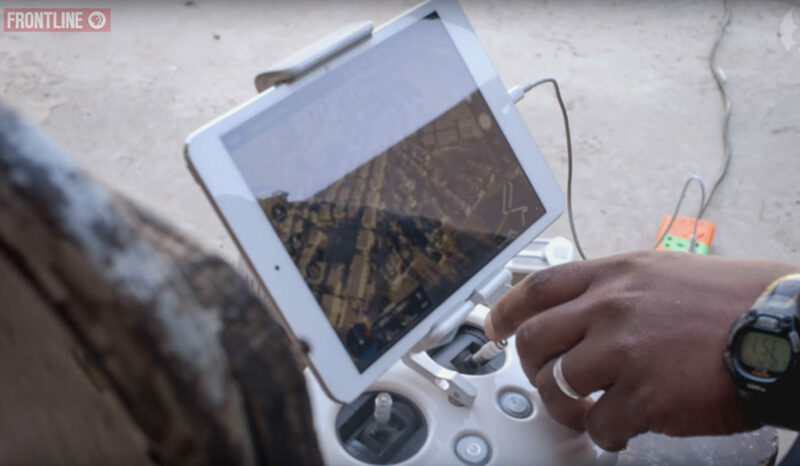 When the fighting approached Mosul’s outskirts however, the amount of drone footage used in official videos increased dramatically. 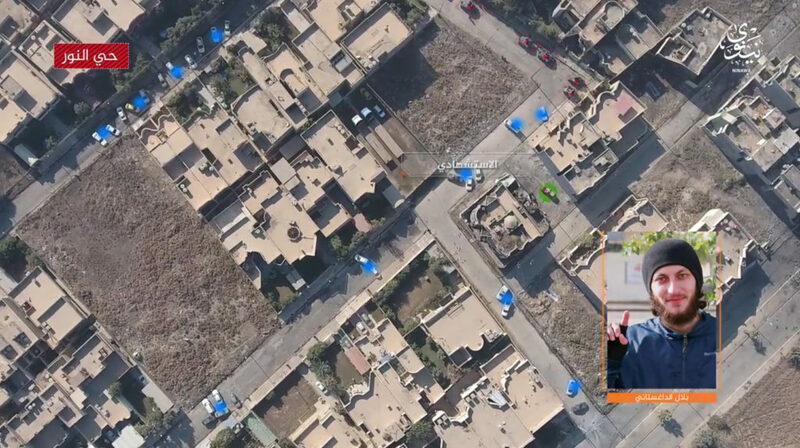 In the last 4 IS video releases from Mosul city, there have been at least 40 cases of successful SVBIED attacks filmed by drones. This is more than twice the number of total SVBIEDs filmed by IS drones up until the battle of Mosul. Iraqi forces also employ quad-copter drones in a surveillance role, but it’s a lot easier for IS to locate ISF positions than the other way around. 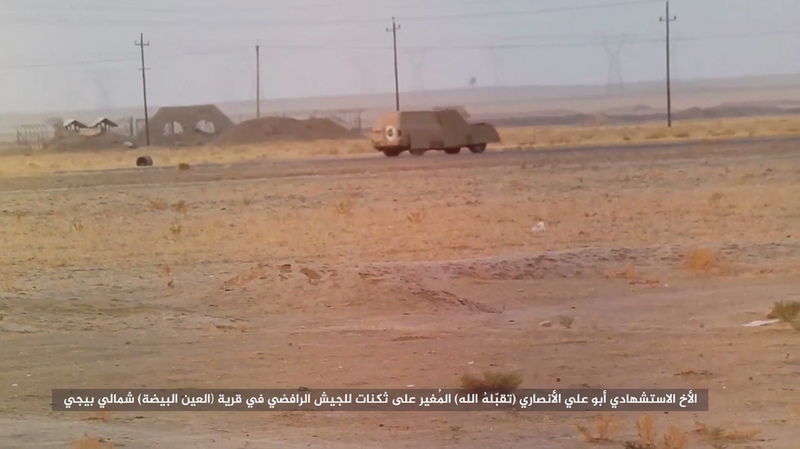 The large ISF convoys stand out like a sore thumb, while IS fighters are often able to blend into the maze-like surroundings. 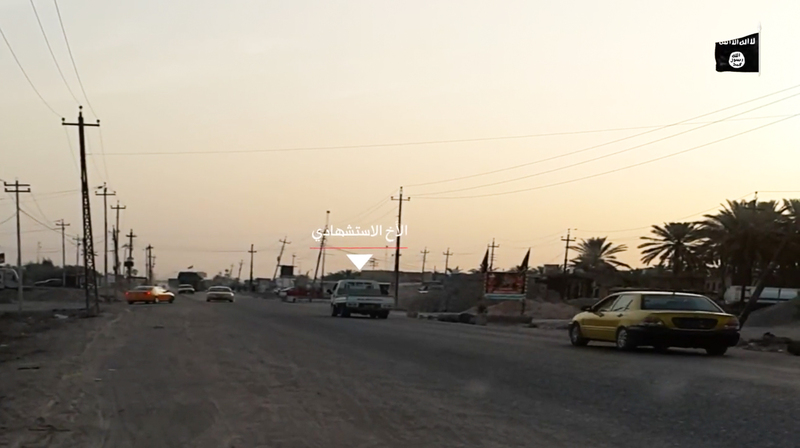 Figure 24: Iraqi forces surveil IS positions in Mosul using a quad-copter drone. A typical ISF advance inside the city has consisted of columns of HMMWVs, supported by M1 Abrams tanks and/or armored personnel carriers pushing into contested areas, then setting up a temporary base in a civilian compound after clearing out the IS militants present in the area. 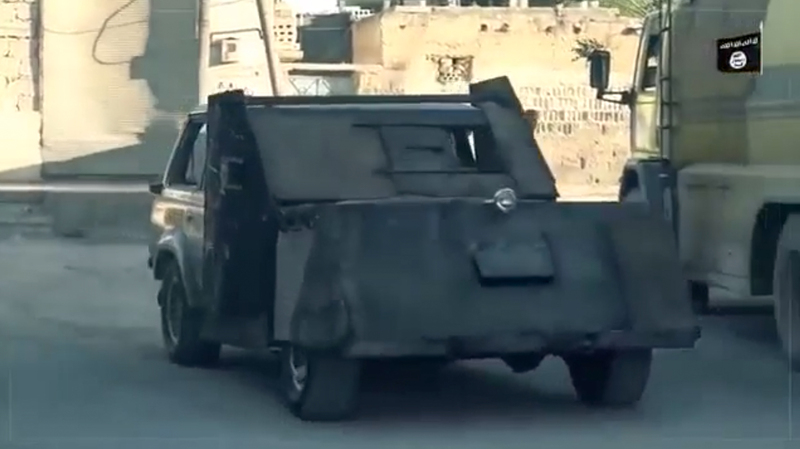 Seeing as the civilian neighborhoods in Mosul offer basically no protection against an SVBIED attack, the ISF has resorted to hot-wiring civilian vehicles and placing them in the middle of the roads surrounding their bases as a form of improvised roadblocks. Figure 25: An ISF commander directs one of his soldiers to block the road with a hot-wired civilian car. 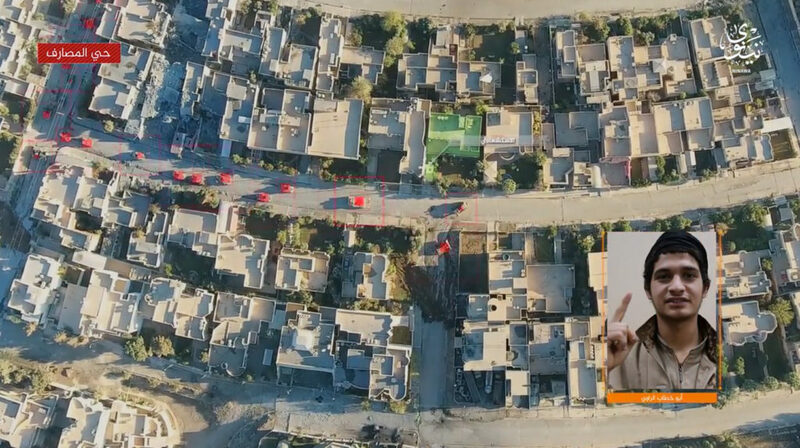 In theory it should work fairly well, but drone footage released by IS has shown that SVBIEDs often drive around the cars, push them aside, or take alternative routes. 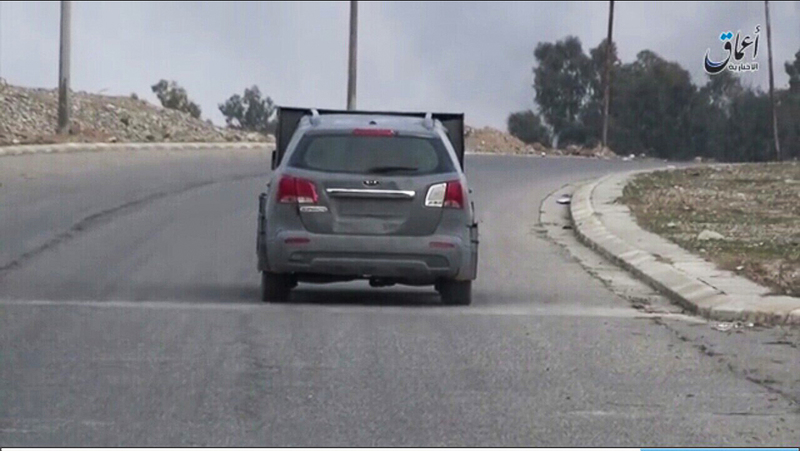 In the SVBIED attack pictured below, the driver simply took a different path before crashing into the ISF vehicles and detonating. Figure 26: Blue = car roadblocks, green = SVBIED, red = ISF vehicles. 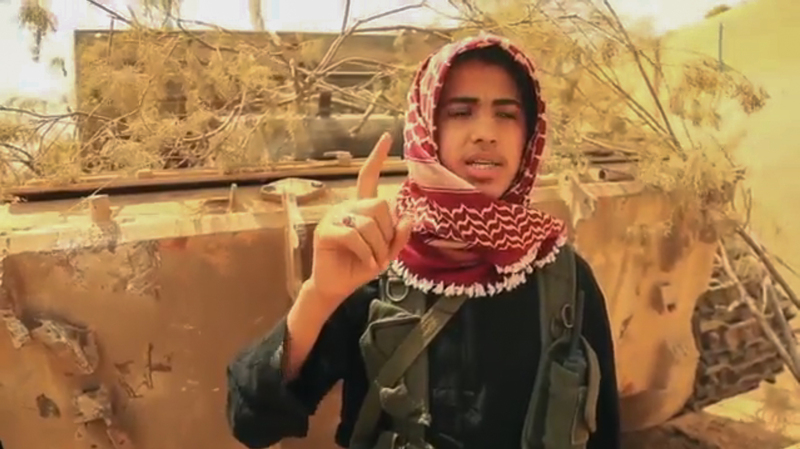 IS have also started employing treacherous tactics that are hard to combat. In some cases, ISF contingents advancing into a contested neighborhood in Mosul have been hit by an SVBIED attack seemingly out of nowhere. 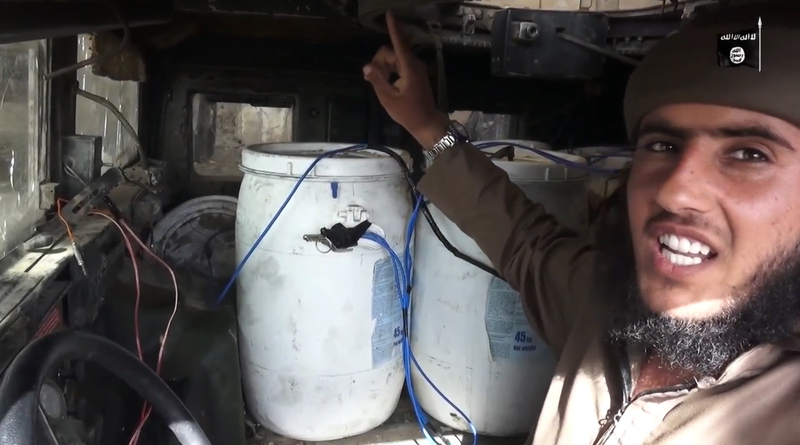 IS has made it a point to park ‘covert’ SVBIEDs in the garages of civilian houses. 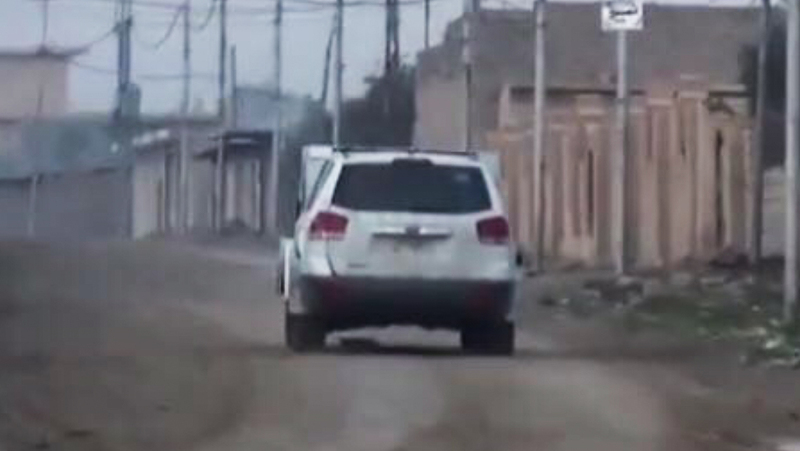 When an Iraqi convoy approaches, the suicide driver starts the vehicle and rolls right into the convoy. Green = HIdden SVBIED. Red = ISF convoy. The 'covert' SVBIED detonates right on top of an ISF vehicle. Green = HIdden SVBIED. Red = ISF convoy can be seen top-right. 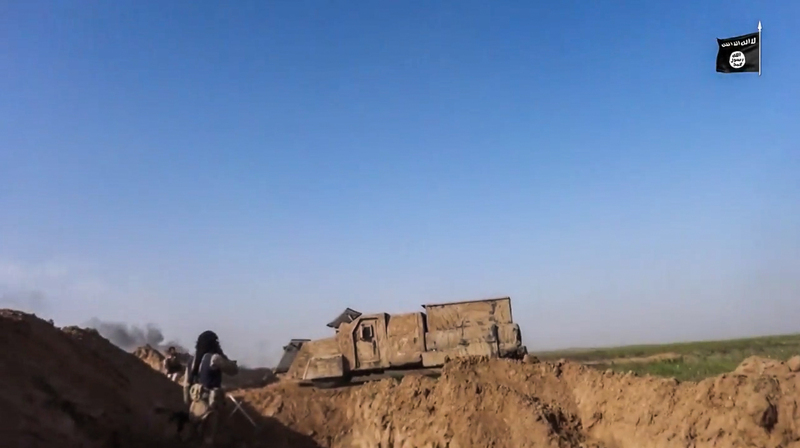 The 'covert' SVBIED rolls out of its garage and smashes into an MI Abrams tank before detonating. 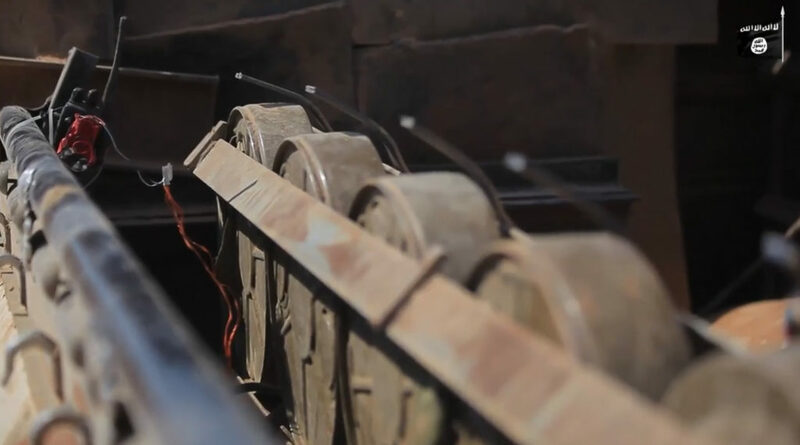 This ingenious trap relies heavily on the element of surprise as well as IS predicting the enemy’s advances, and hiding the ‘covert’ SVBIEDs in the attacking forces’ way. Advancing ISF contingents have no way of controlling every single vehicle parked in driveways/garages while advancing up a street. 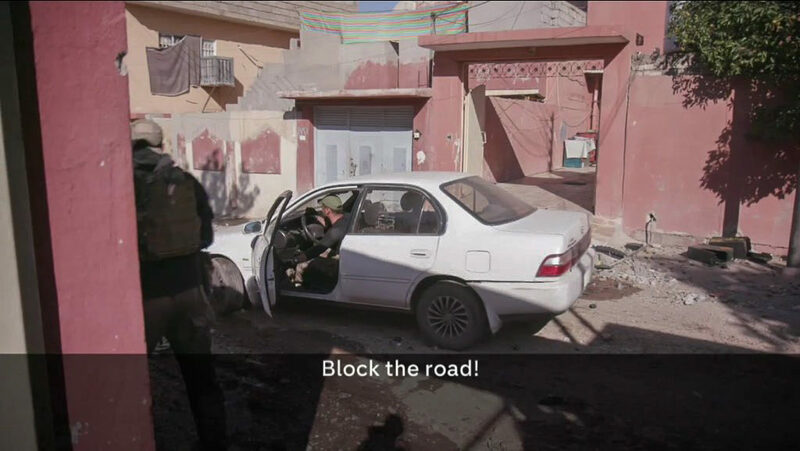 This tactic allows IS the ability to harass Iraqi forces on another level, as it turns every garage, compound, and driveway into a potential SVBIED threat. A consistent lack of situational awareness among Iraqi forces has allowed IS to utilize SVBIEDs with great success. While urban fighting makes it more difficult to maintain a coherent perimeter defense, Iraqi forces should remain extremely vigilant. 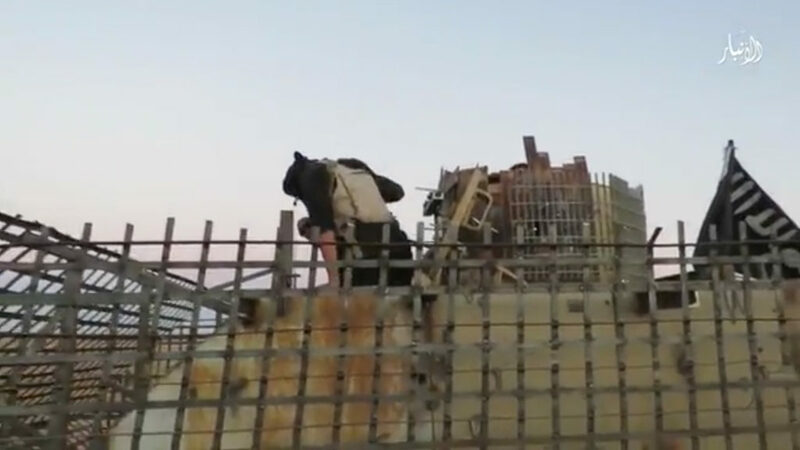 Constant lookouts from elevated positions or continuous drone surveillance in urban environments are imperative in order to prevent disastrous SVBIED attacks in the future. A heavier deployment of Anti-Tank Guided Missiles (ATGMs) should also be a top priority. 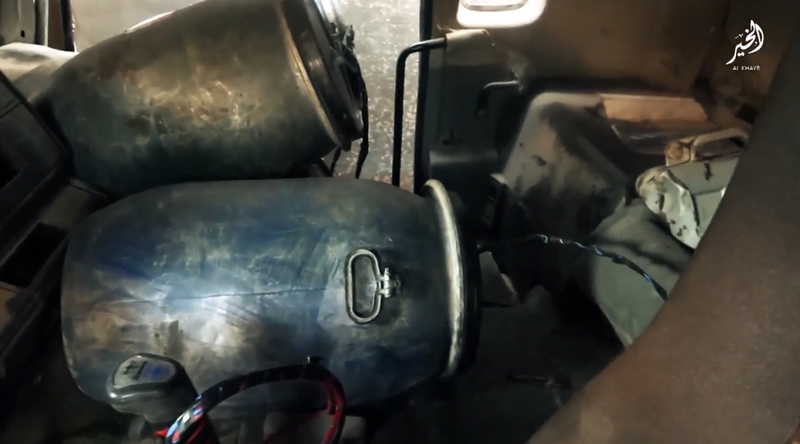 These powerful weapons are very effective at stopping SVBIEDs, and could be the difference between disaster and success if set up on continuous perimeter watch at an improvised base. The ISF are not on par with a western army, but the military operation of recapturing Mosul city is a massive and complex undertaking. The elite Golden Division has lead the majority of ISF advances in Mosul, bearing the brunt of casualties sustained during the operation. Some of the Golden Division’s battalions have suffered casualty rates as high as 50%, a highly unsustainable number. With western Mosul still under IS control, it remains to be seen how that part of the battle will develop once initiated. 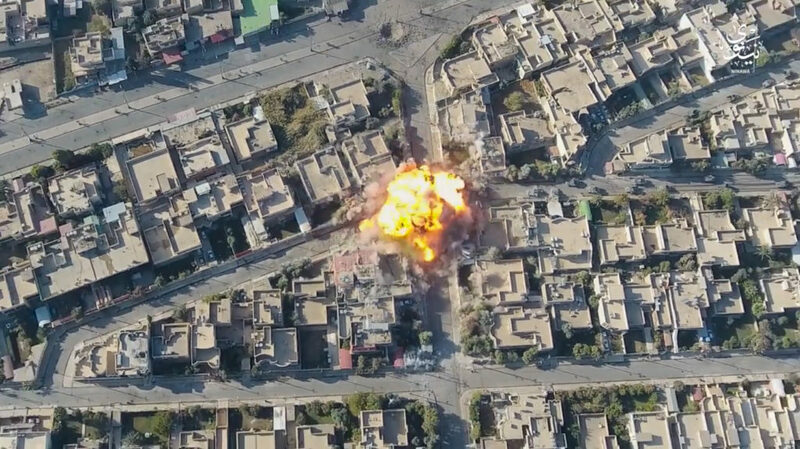 Just as in the eastern parts, IS are bound to employ the tactic of heavy SVBIED usage in coordination with drones, utilizing the favorable urban setting to strike the ISF where they are the most vulnerable. 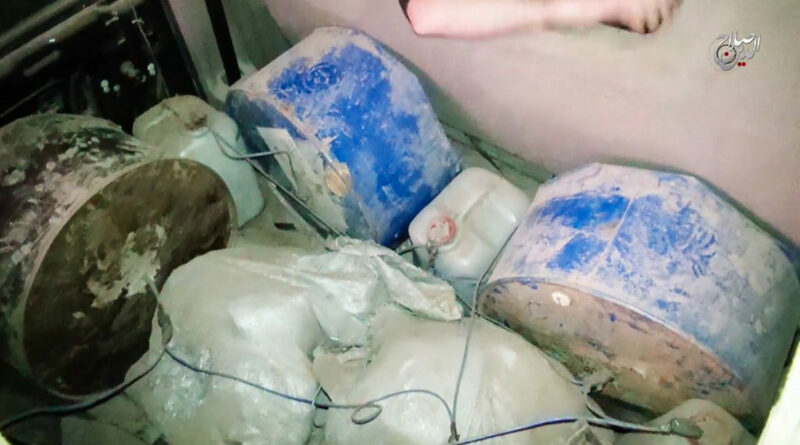 After capturing eastern Mosul, Iraqi forces have discovered many signs of an extensive network of VBIED workshops in the city that were used to fuel the IS war machine. 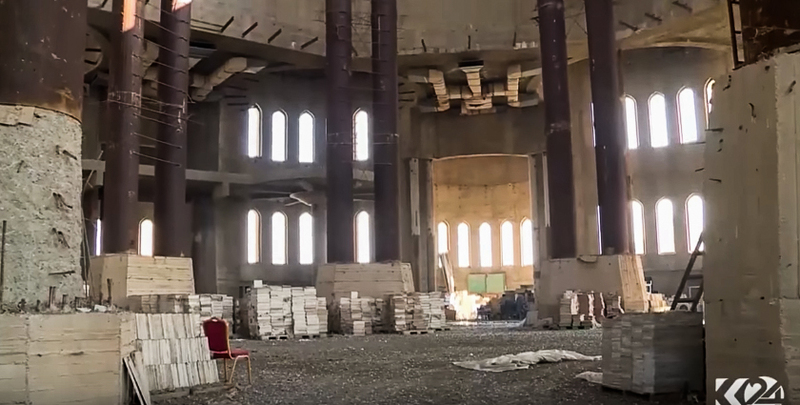 Apart from the industrial areas, IS also converted the Grand Mosque of Mosul into a VBIED workshop. 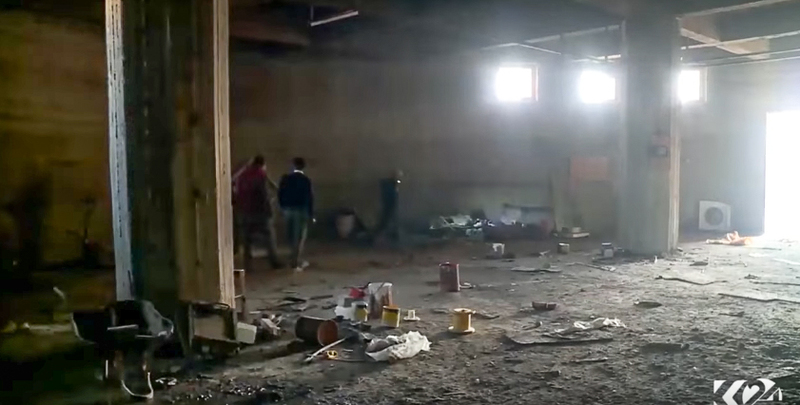 It’s a logical place for a VBIED workshop, as the religious symbolism lowers the risk of it being targeted in an air strike. 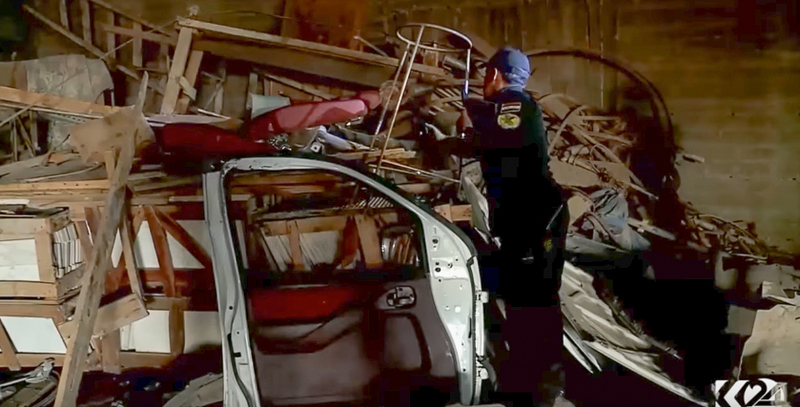 The spools of wiring and the sheets of metal found are both indicators, but the car doors are perhaps the biggest clue. When overhauling a civilian vehicle into an SVBIED (particularly SUVs), the driver and passenger doors are usually removed. 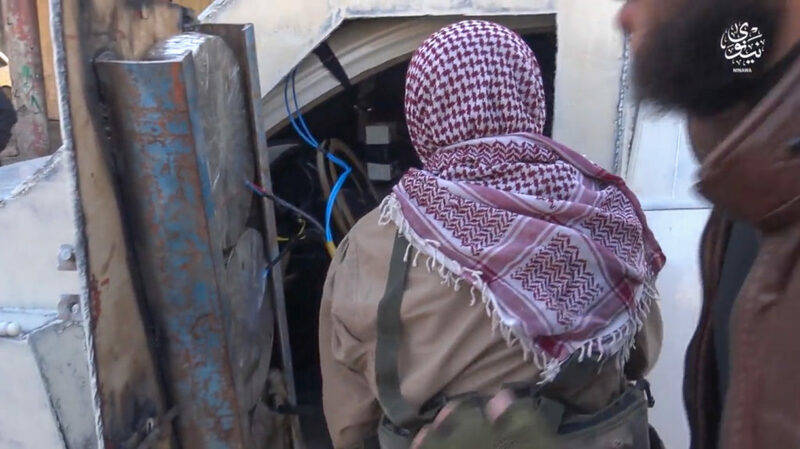 A door with multiple locking mechanisms is then typically added to the improvised armor, allowing the driver to get in the SVBIED without climbing through a hole in the rooftop. 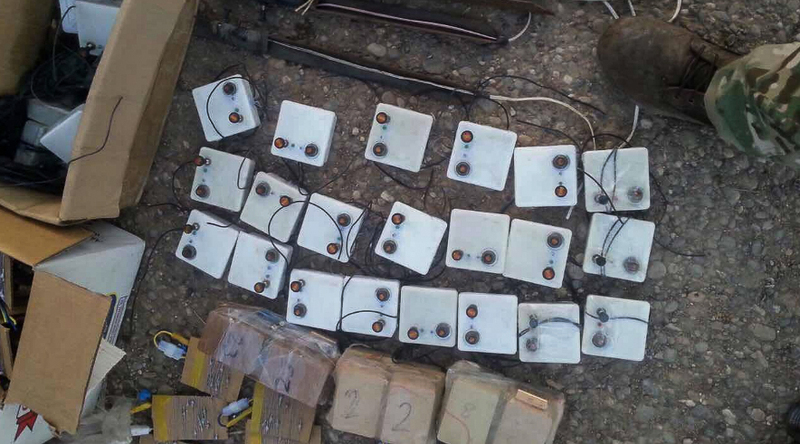 Iraqi forces also discovered a variety of IED components in a raid after securing eastern Mosul. One type of item that stood out was the most common detonation mechanism used in an SVBIED nowadays. Detonation mechanism fitted inside an SVBIED that was used in Mosul. 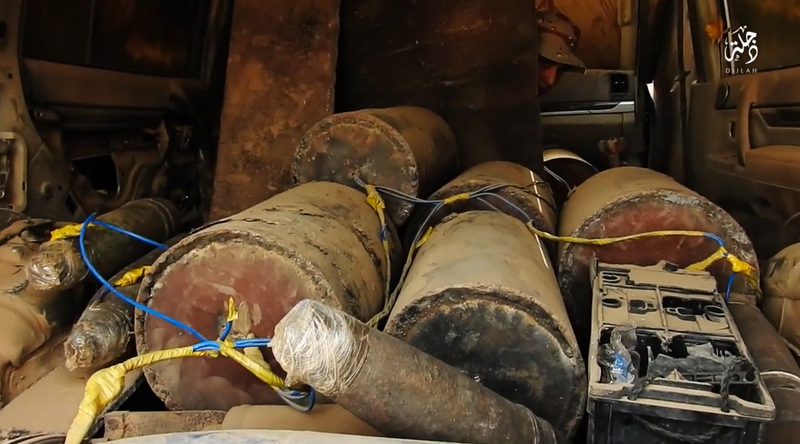 SVBIED detonation mechanisms (pictured center) captured in an ISF raid in Mosul. 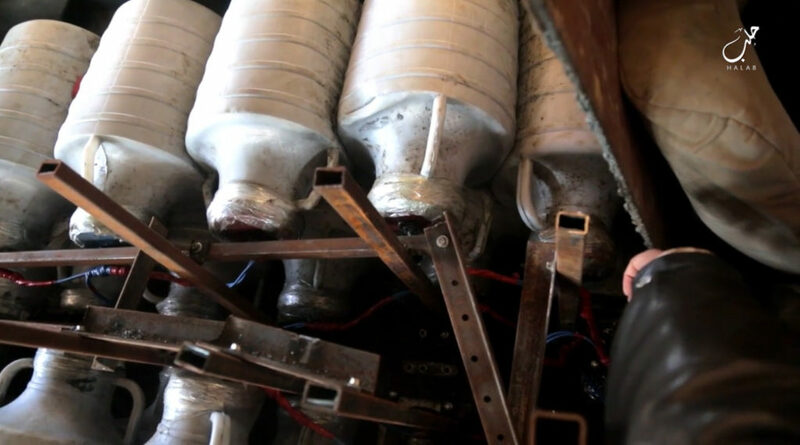 SVBIEDs constructed by IS usually don’t employ standardized detonation mechanisms, with some going as far as using half a dozen redundancies of different sorts. 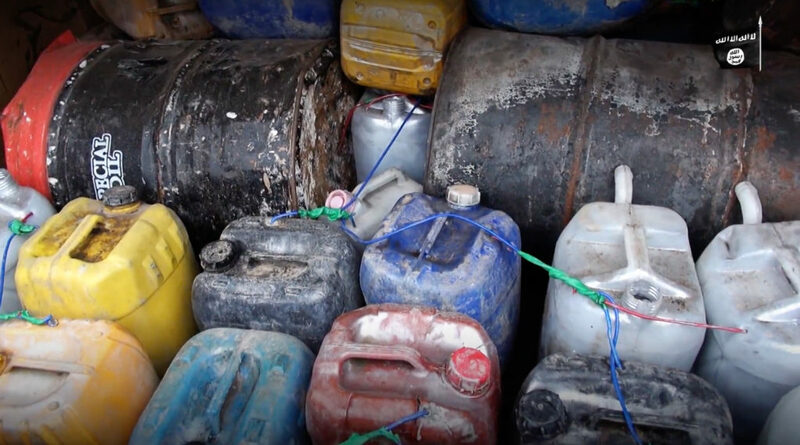 However, there has been an increasing phenomenon of standardized detonation mechanisms as of late, particularly in Mosul and in the surrounding provinces. The detonation mechanisms that were captured here include a safety that needs to be pressed before the firing switch is activated, so as to prevent an accidental premature detonation. 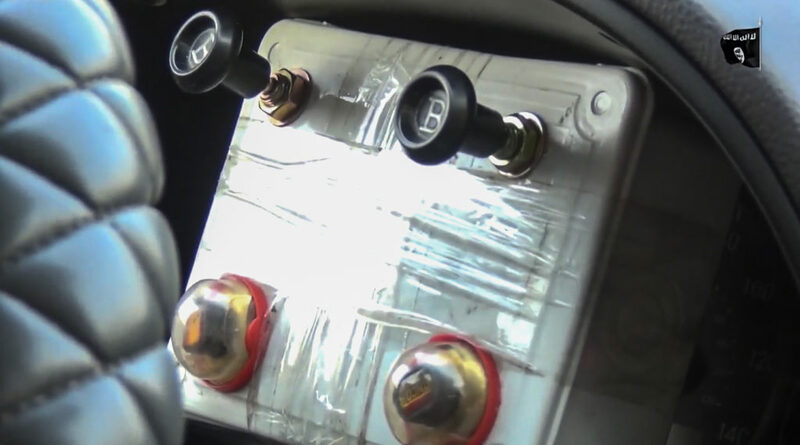 The detonation mechanism that can be seen fitted on the inside of an SVBIED is slightly different as it consists of two sets of safeties and firing switches. Each set of safety and firing switch is connected to a separate firing circuit, for a good reason. The second set of buttons act as a fail-safe in case the wiring on the first set is faulty. 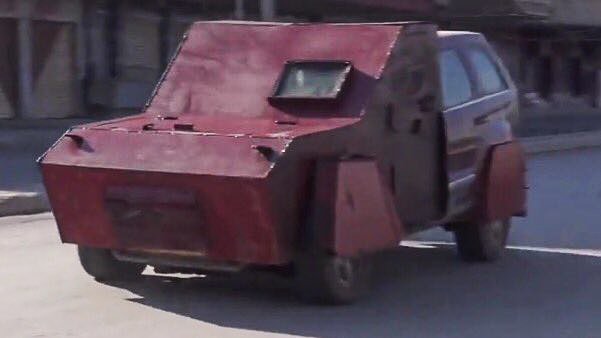 The thought behind this design is to maximize the chances of the SVBIED being used successfully. This is in line with what I’ve talked about earlier. Every component and design feature of an SVBIED, whether it’s ‘covert’ or up-armored, is thought-out in order to make the chances of it being successfully used as high as possible. From the semi-standardized improvised armor and multiple redundancies on up-armored SVBIEDs to the unmodified nature of ‘covert’ SVBIEDs and the often clean-shaven drivers – Each type of SVBIED is thought out to the smallest detail with one thing in mind: Get it to where it needs to detonate. 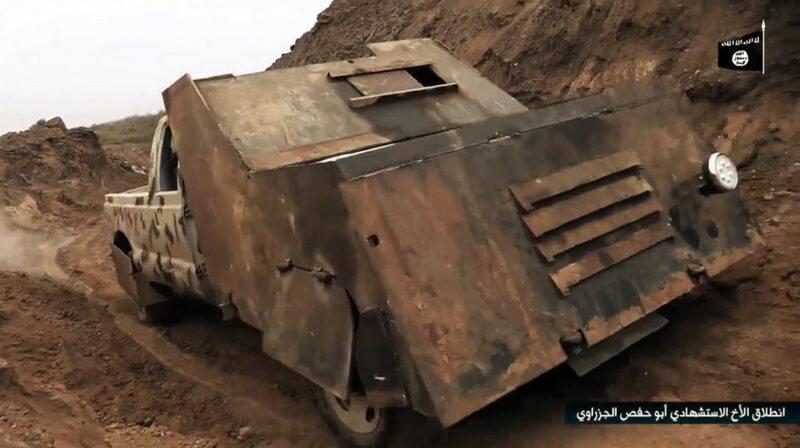 The VBIED is not something that anyone is ever going to be able to eliminate from the battlefield, and IS have mastered the art of its usage. 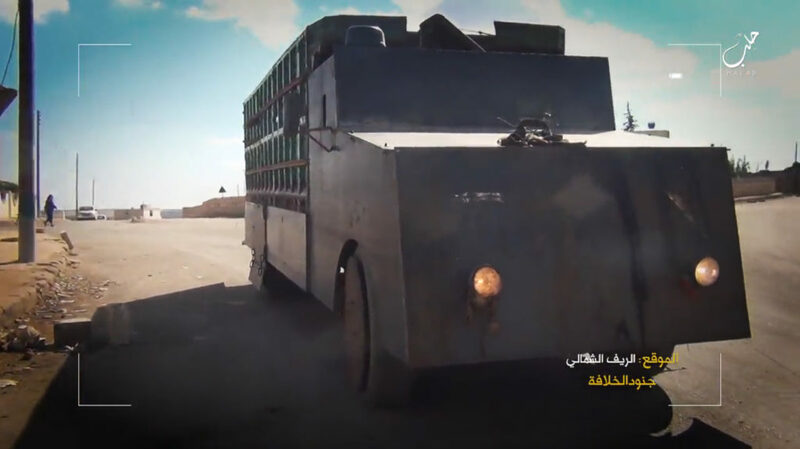 VBIEDs are the most central and core tenet in their philosophy of war, and has allowed them to project a military power far more sizable than their actual military force. 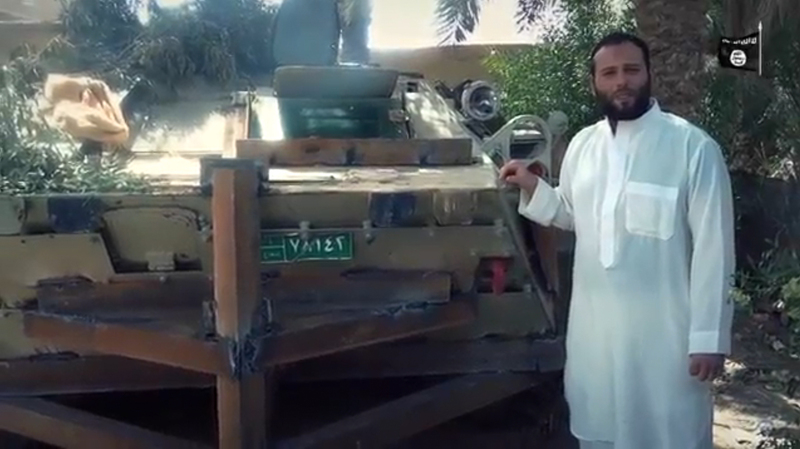 There’s a variety different types of VBIEDs that all serve their own inherent purposes. SVBIEDs are an extremely cost-efficient weapon, and the massive amount of SVBIEDs used by IS (815 in in Syria/Iraq in 2016 alone) has necessitated a vast network of VBIED workshops that continuously work to overhaul vehicles. Larger workshops gravitate toward the bigger cities under their control (Raqqah in Syria and Mosul in Iraq) and are tasked with supplementing VBIED capabilities in surrounding provinces, outside of manufacturing VBIEDs for local use. The ability to adapt its construction and employment throughout the years with regard to changing types of combat also shows that the SVBIED is an extremely versatile and adaptable weapon of war. 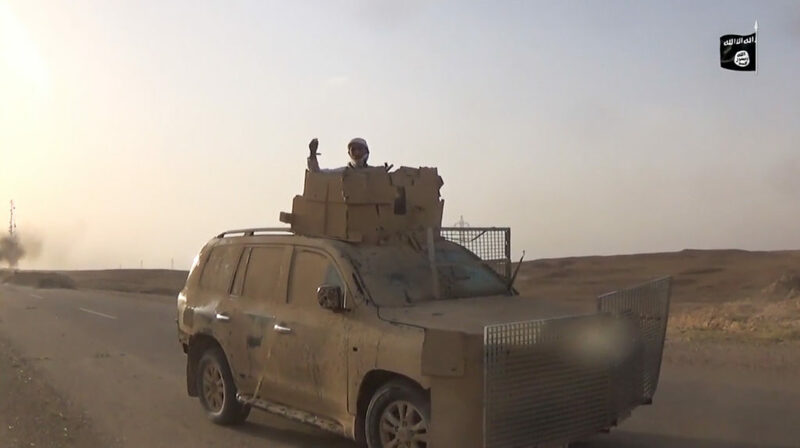 As I have shown earlier, the usage of each type of VBIED is very closely related to the amount of territorial control and the intensity of fighting in a given area. 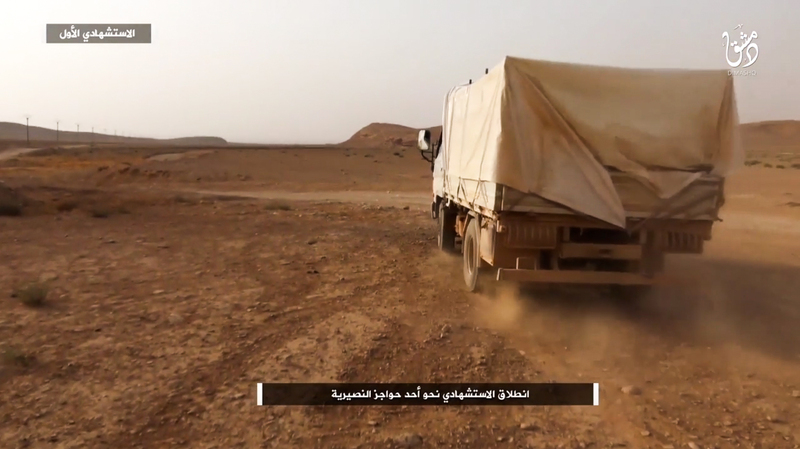 For example, the usage of parked VBIEDs and ‘covert’ SVBIEDs is mostly limited to areas where IS have little territorial control – while up-armored SVBIEDs are exclusively used in areas where IS have territorial control. 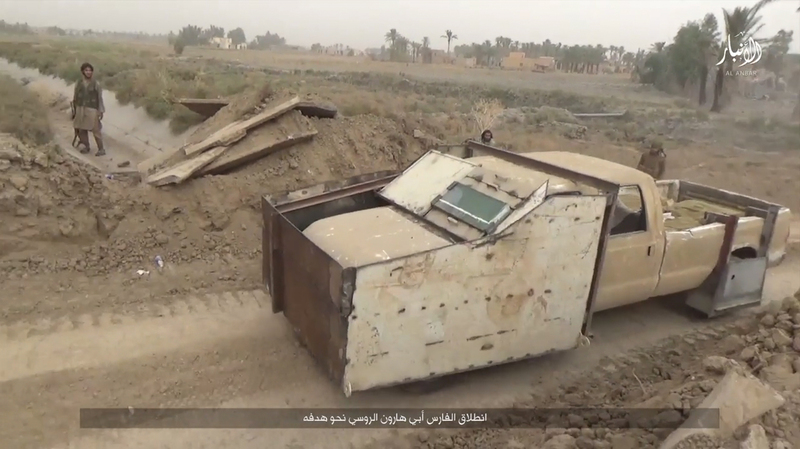 This doesn’t mean either is limited to a specific time period, as up-armored SVBIEDs were used in small numbers during the Iraq war, and parked VBIEDs and ‘covert’ SVBIEDs are still used today. 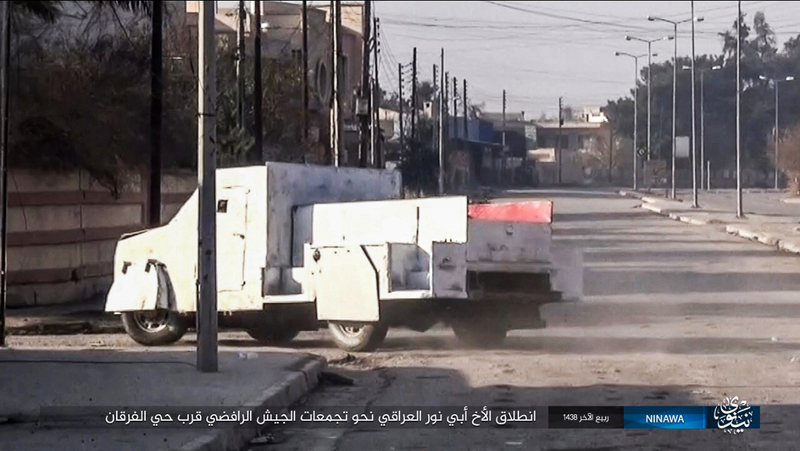 As this stage of the anti-IS fight continues, up-armored SVBIEDs will continue to be used in great numbers, peaking when the battles for Raqqah city and the western side of Mosul are initiated. As anti-IS forces take over more and more of their territory, the VBIED manufacturing capabilities of IS will eventually be diminished. 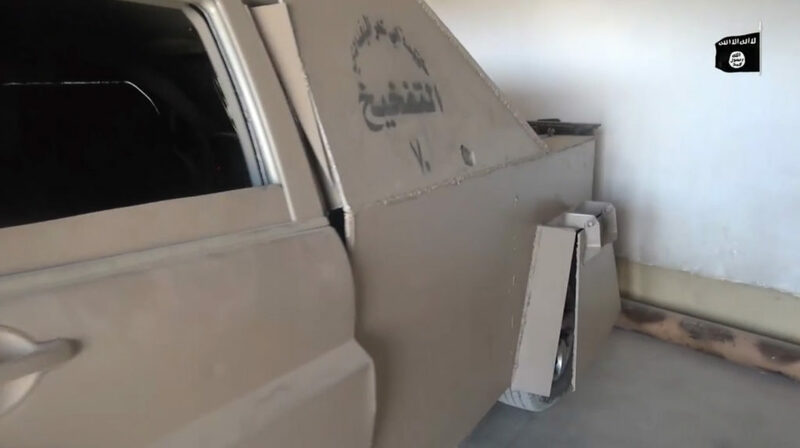 As IS are once again pushed out of their traditional strongholds, VBIED workshops will shift toward manufacturing more parked VBIEDs and ‘covert’ SVBIEDs for use in the areas it just lost. 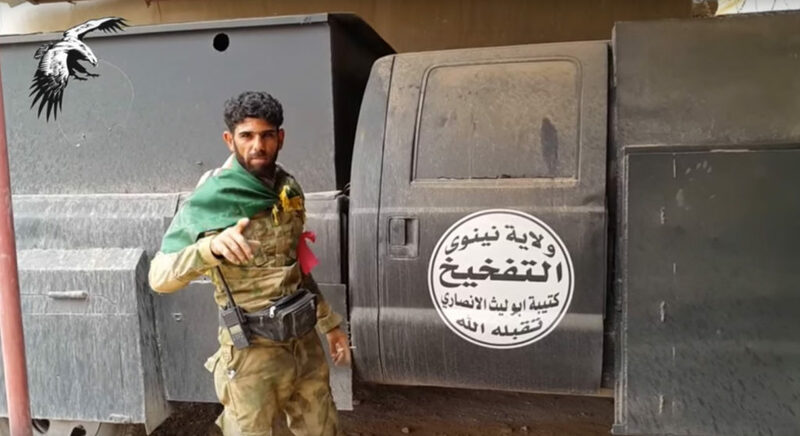 Once IS loses the overwhelming majority of their territorial control and the frontlines fade away, VBIEDs will become ‘covert’ en masse once again. There is no real reason to believe that defeating IS ‘militarily’ (i.e. denying them territorial control) will defeat the group in a final sense. The current anti-IS campaign has been too focused on re-capturing territory quickly that was lost to IS in 2014 than it has been in using the right forces to do so. IS were able to resurrect after the intense campaign against them in the late stages of the Iraq war, and they will most likely be able to come back in some shape or form after this campaign too. 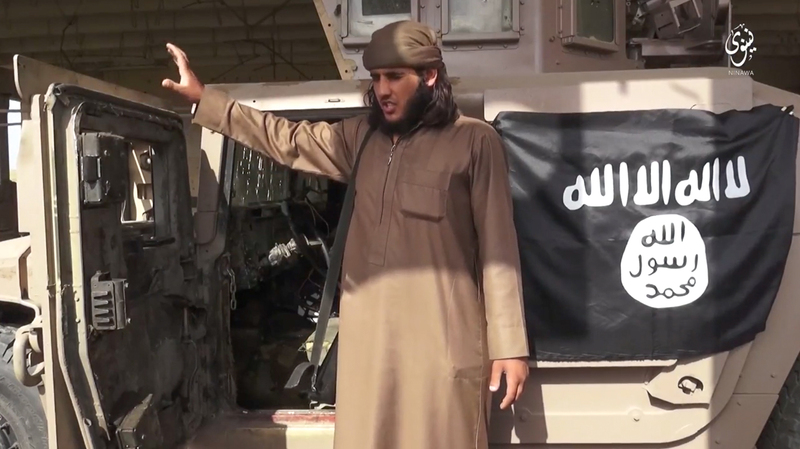 The one thing that’s clear is that the VBIEDs will continue to detonate. Note: for the analysis section, all screenshots were taken from Jihadology.net – Big thanks to Aaron Zelin for making this source material available for researchers. Reblogged this on Aiman Farhan. This is really brilliantly done. I am envious. One of the best IS-related articles I’ve ever read. Wow. This is a very respectable thesis about IS car bomb. Kudos to the writer. Great post many thanks for sharing that. I like the article..but I am sad..these peoples are going to build and die in it without any human feeling..these peoples should have a bright future…but they are being used for this mission…Anyway, I like to say thank you for locate and do research on suicide vehicles that made by ISIL. Superb article, thanks. It’ll be of excellent help in my own cartoons and fiction.